SOKE International Japan martial arts Karatedokai is Proud of Mr. Bruno Koller. 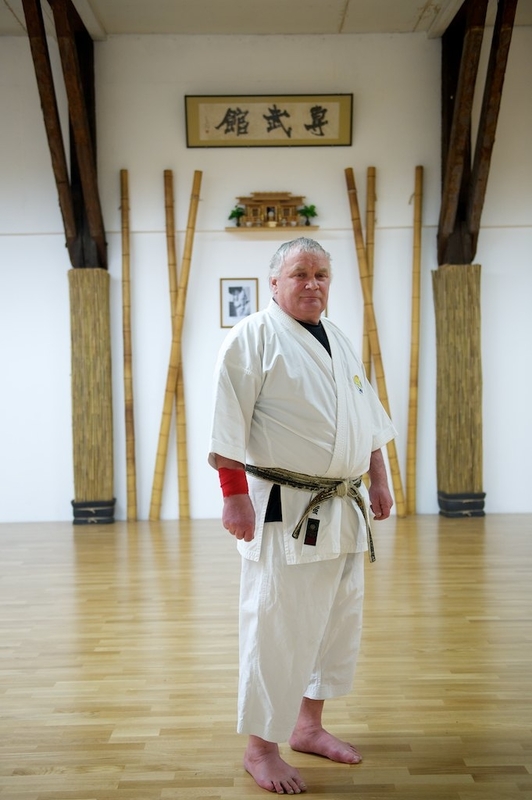 We, SOKE IJKA, is proud of Mr. Bruno Koller, and truly respect him from the bottom of our hearts. 2010 Following the event, he attended the international instructor meeting. 2010 Examination finally ended after 6 hours. At the Sohonbu Tetsukiho Kan dojo. 2011 Following the event, he attended the international meeting. 2014 Following the event, he attended the international meeting. 2016 He attended the Asai Cup International Karatedo Championship, Even after he fell ill in 2009.
and devoted himself to training. two of them went to heaven together enjoying each other窶冱 company. Please find a moment of rest. Bruno sensei, who shared a very strong master-student relationship with Master Asai for over 30 years, passed away on April 30th. born in 1949 in Appenzell. 1975 moved to Japan with his wife and son Giosuel to get to know Karate. test in Budokan fight against everybody and won every single encounter. 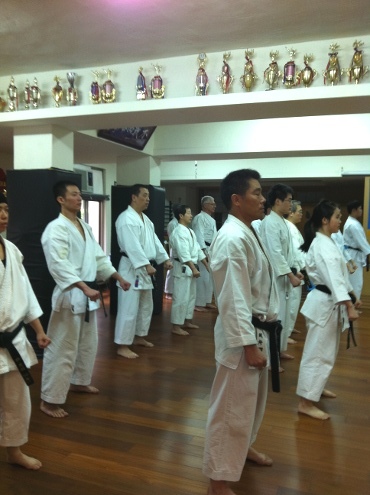 participate in the instructor training in Tokyo. Behind closed doors. 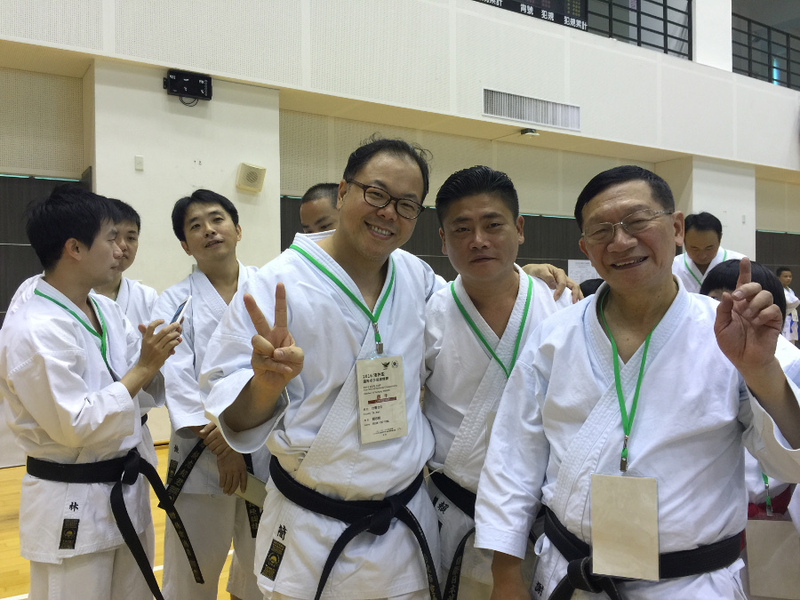 challenges along with the instructors of Japan (Asai Sensei, Nakayama Sensei). experienced the reality of Bushido. Karate World Championship in Egypt. and Karate World Championship in South Africa November 1993 3rd place Kata, 5th place team Kata. Sendai Cup in North Japan 1st place Kumite, 1st place Kata. 1st Asai Cup in Russia 1st place Kumite, 3rd place Kata. IJKA European Championship in Burmingham 1st place Kumite, 1st place Kata. 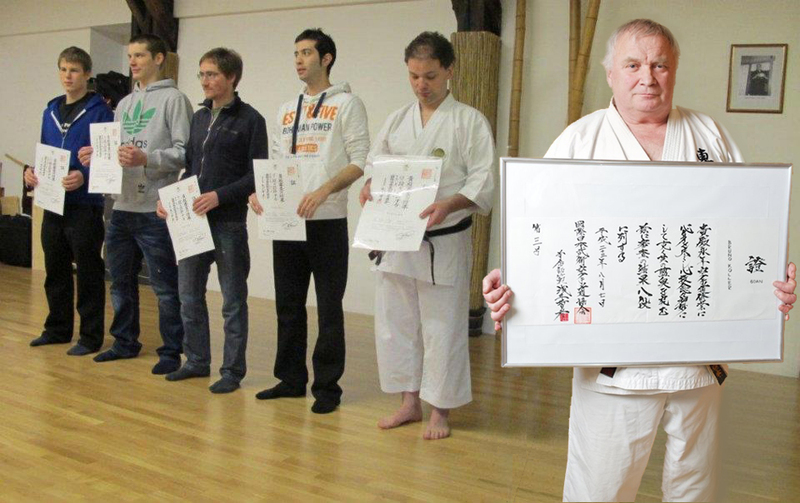 On May 6th, IJKA General Headquarters issued Bruno sensei a 9 Dan certificate. 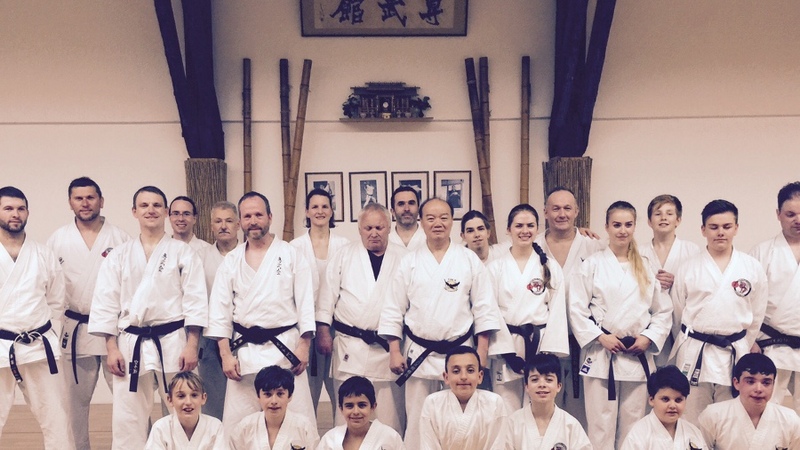 We were so shocked to learn of Bruno Sensei's Suddenly passed away. Bruno Sensei was such a wonderful person, who dedicated himself to Karate with his whole life; contributed to the development of IJKA in Europe among so many othters which had been well known to Karate world, and among your family. We know how little words written on a page can possibly mean to you at such a time, and words can't touch the depth of sorrow for your loss, but may the joy of rememberance of him shared among your family help to sustain you during such a bleak time. We will all miss Bruno Sensei deeply. When I was preparing for the seminar next week in Switzerland and look forward to meet you again, I heard sadly the news that you are unexpected leaving us forever. As Master Asai passed away on August 15. 2006, we went to Japan for his funeral ceremony and met each other there. Your speech in the ceremony was filled with such deep feeling of sincerity and touched the heart of every one who was there. I can not forget that moving feeling until now. 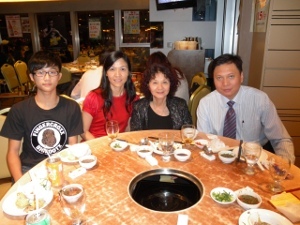 After then you came to Taiwan several times to visit my father and we practiced together under his guidance. Your attitude was always so humble and therefore unforgettable for me. In the past few years, the disease has taken the vision gradually from you. Although you could not see well, but when I was in Switzerland, you still wore your Karate Gi and practiced seriously with us, sometimes moved even faster, pounched more powerful than before. I often mentioned your attitude and spirit with my students as a model for us to follow. Maybe what I dream of at night reflects what I think about at daytime. Last night I saw you and Master Asai practicing Kakuyoku together in my dream. It was raining in Taipei. When I woke up in the middle of the night, there was also raindrops on my face. Dear Bruno Sensei, I wish you to continue practicing Karate happily with Master Asai in Paradise. Dear Bruno Sensei, let's meet in the next life and be brothers again! 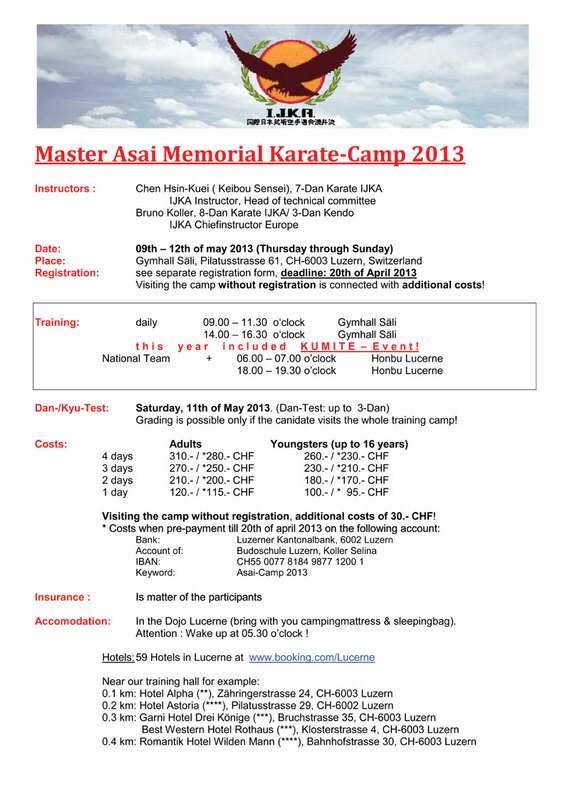 Introduction of the extraordinary new form of karate the late Master Asai left unrevealed. The timing of the introduction is set up on the completion of instructor training. 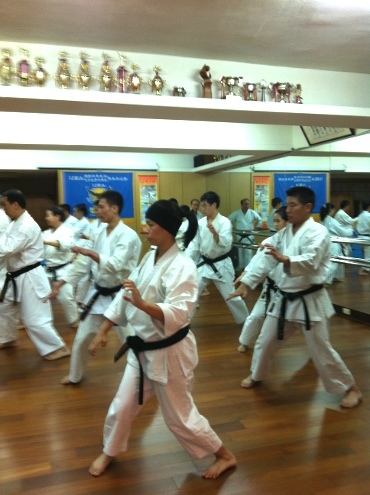 Global instructor training has been already being strengthened at Tetsuhiko Kan in Taiwan. 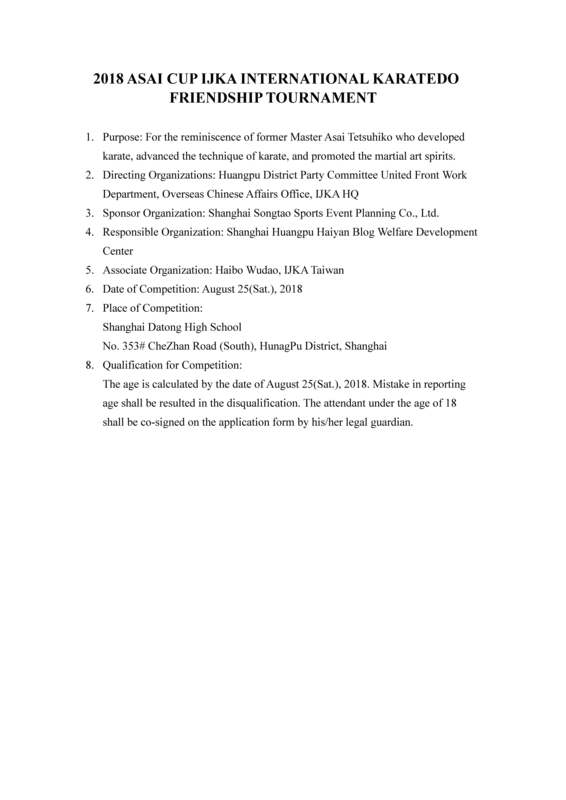 Establishment of individual membership division. Since there is already a clause in the current IJKA Rules and Policies that deals with individual memberships and their training that there is no need to establish a new division. 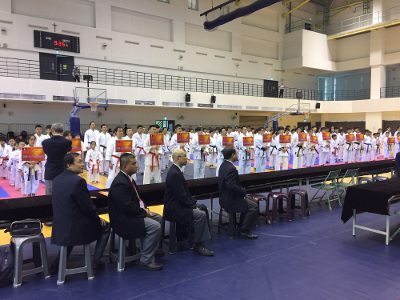 In order to host the 2018 Shanghai Asai Cup International Karatedo Tournament that will be held in August in Shanghai smoothly and successfully, attendees reconfirmed their duties. 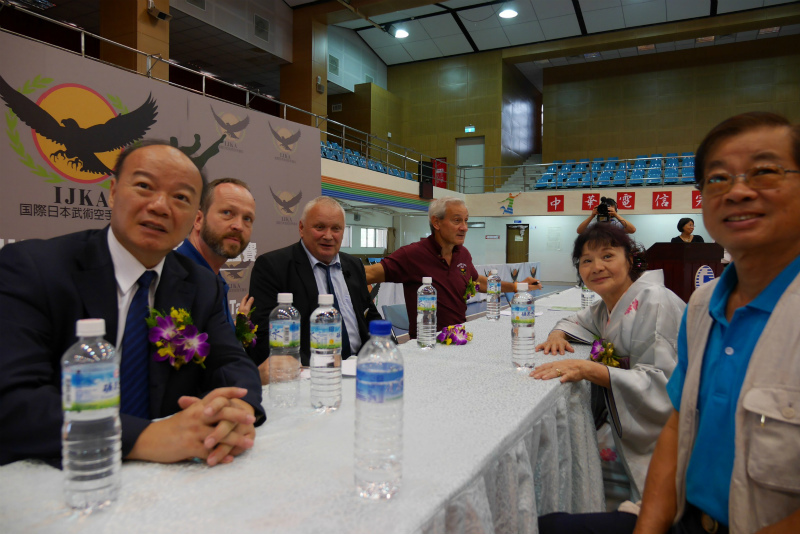 Photo: (Front front left counterclock wise) global instructors Chou, Chih-wen and Wang-ruyu, Head of Technical Office, Chen Hsin-koei, Soke IJKA President Keiko Asai, global instructors Ji, Bang-yen and Toshiyuki Kidokoro. 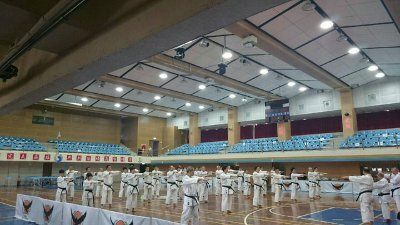 During and immediately before or after the 2018 Asai Cup Karatedo Tournament, scheduled on August 25th and 26th, Asai Karate seminars will be held. 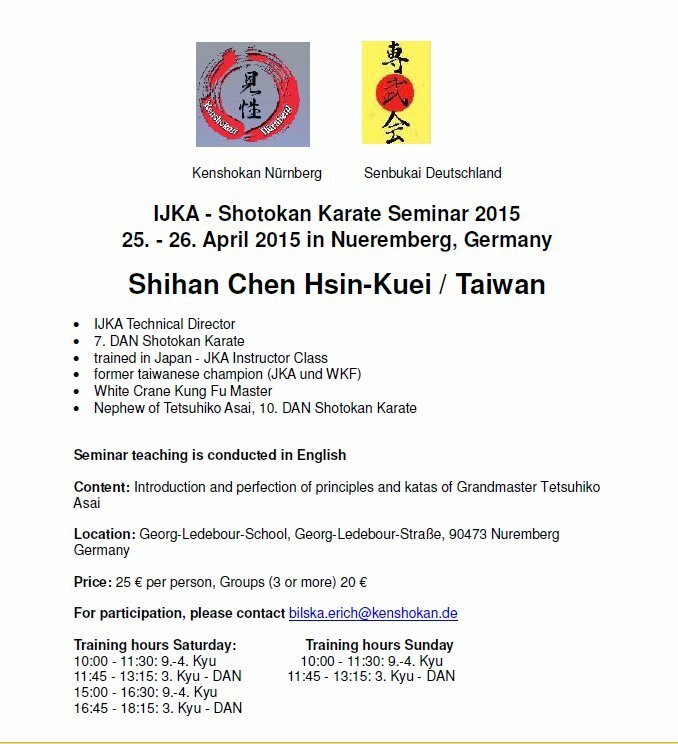 Those who do not belong to any karate organization can participate in the seminar after registering for a Soke IJKA individual membership. Please also note that after a successful registration, you can apply and receive training anytime at Taiwan Sohonbu Dojo Tetsuhiko Kan. The new karate created by Master Asai is not limited to one style, but adopts kata forms that fit in all schools of karate and relates to many martial arts. 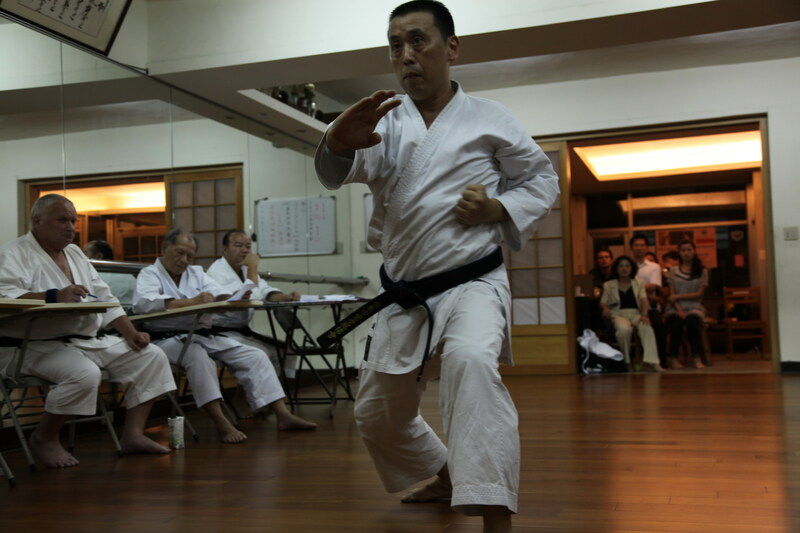 He noticed that many people hurt their legs and hips practicing traditional karate and this led to his development of karate that does not injure the body. For example, the method includes stretches that incorporate breathing control allowing the muscles to stretch gently and this has resulted in karate that can be practiced safely by all karate lovers, regardless of their age, for a lifetime. Technically his karate forms unconventional karate techniques. For example, it includes new forms such as Tenshin (turning over), Shinko Hoko (direction of movement), jump, Muchi Ken (the whip fist) and others, and these encompass all forms of offensive and defensive techniques. 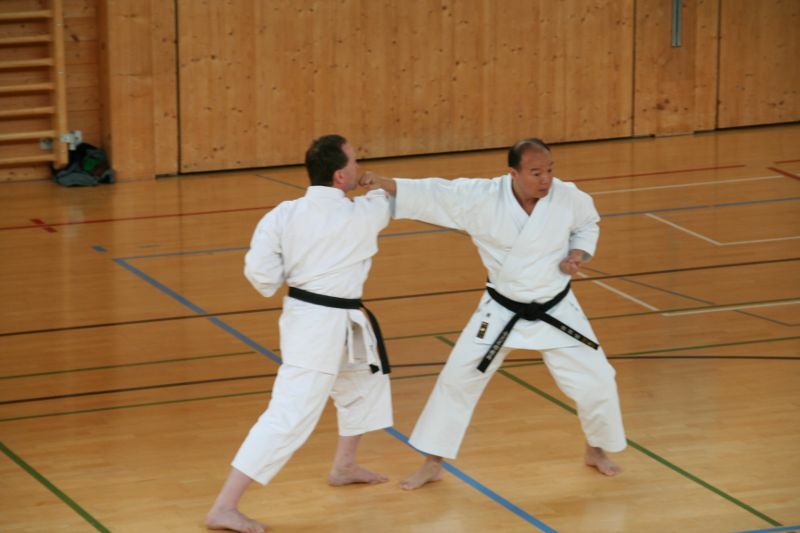 A basic kata for learning offense and defense in Maai, using the pillar and a moving leg. A basic kata that allows easy shifting of waza while turning the body, by mastering the rotation of hips. A basic kata that allows easy shifting of waza with effective sequence of foot movements, by mastering footwork. Kakuyoku (Crane Wings) jutsu for offensive and defensive waza. It incorporates the movements from White Crane including flying, jumping, walking, diving, swimming, standing on one leg, and wing movements. It makes joints more flexible, allowing a smoother delivery of waza. A jutsu for mastering the color and form (momentum) of flame, and the control of heat. Mastering the concept of fire, including the elasticity of the body, and pressure imposed by Qi. Incorporates movements of wind into taijutsu. A jutsu for mastering the concept of wind, by understanding the wind power that arises in many parts of the natural world and the wind pressure of a whirling storm. 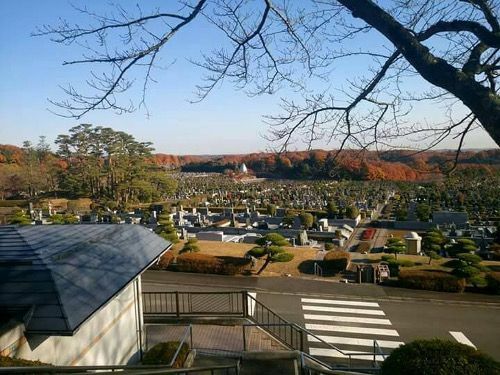 A training jutsu that incorporates jumping and tenshin that follow the movements of falling leaves, fluttering and dancing in the wind from the branch to the ground. A training jutsu for offense and defense using both arms to simultaneously perform uke and attack in one flowing movement. Leg techniques with lowered hips. Various leg techniques and training jutsu with focus on leg tendons, relaxing and contracting of legs. A jutsu for mastering the concept of waves for offense and defense, incorporating the ebbing and flowing, swirling, and rise and fall movements of waves into movements of hand and arms, and tenshin. 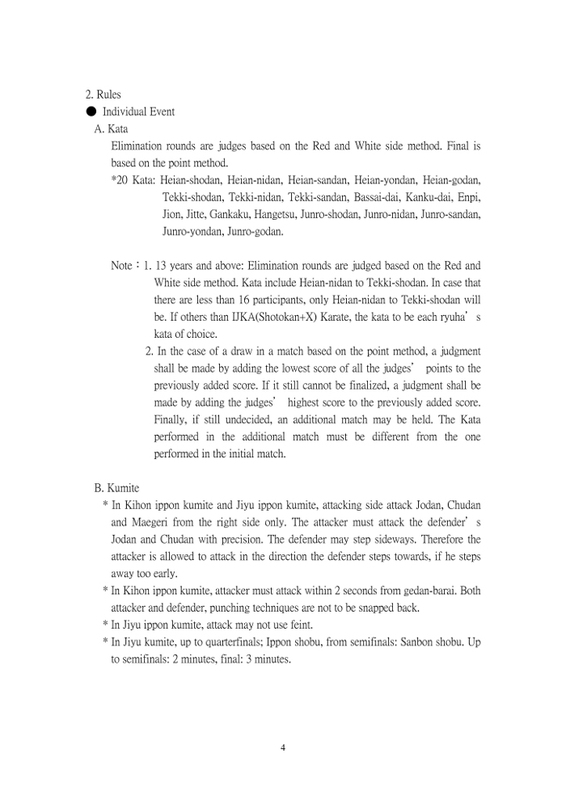 Heightened waza of Meikyou (clear mirror) kata. Dan examination and certification must be carried out according to provisions set by Soke IJKA Headquarters. 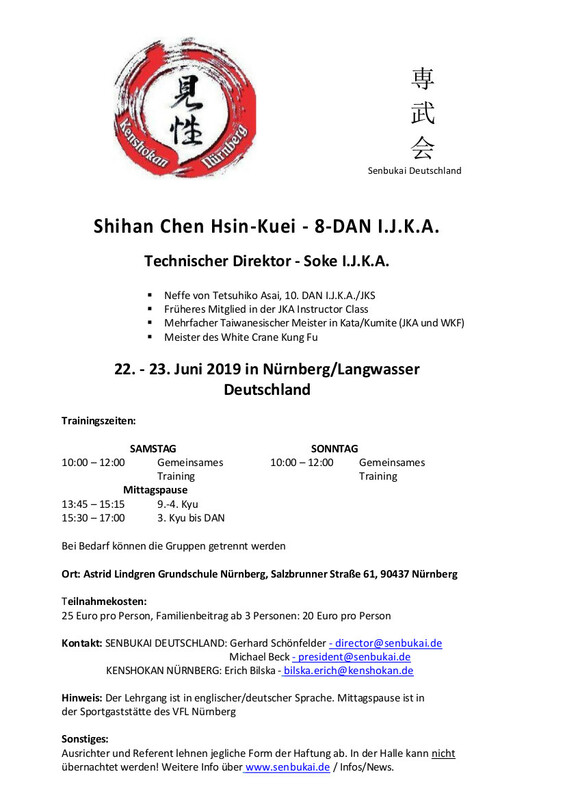 Instructors who are not approved by Soke IJKA Technical Office cannot teach in the name of Soke IJKA at a workshop or seminar. 縲�Mr. Otto Riedinger (Germany) are to consult and jointly decide on the future operation of the region. 縲�They are to report the outcome to Soke IJKA Headquarters. The Soke will support their decision. 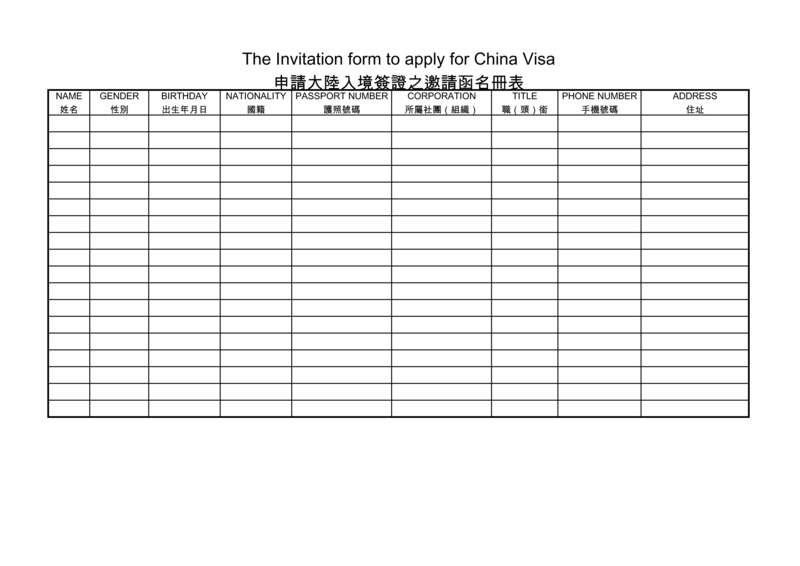 縲�縲�Individual memberships are to be categorized into two groups. 縲�縲�which is the same as the regular membership, and the other is the supporter membership. An applicant who says hasn窶冲 practiced karate for the last two decades is wondering if the applicant could take 3 dan and 4 dan examinations at the time of the trial for the SOKE IJKA membership. It depends on the applicant experience and skills, and the decision will be left to the Head of Technical Office Mr. Chen. Make the terms consistent, and use 窶彡ommittee.窶� Make necessary changes on the website. 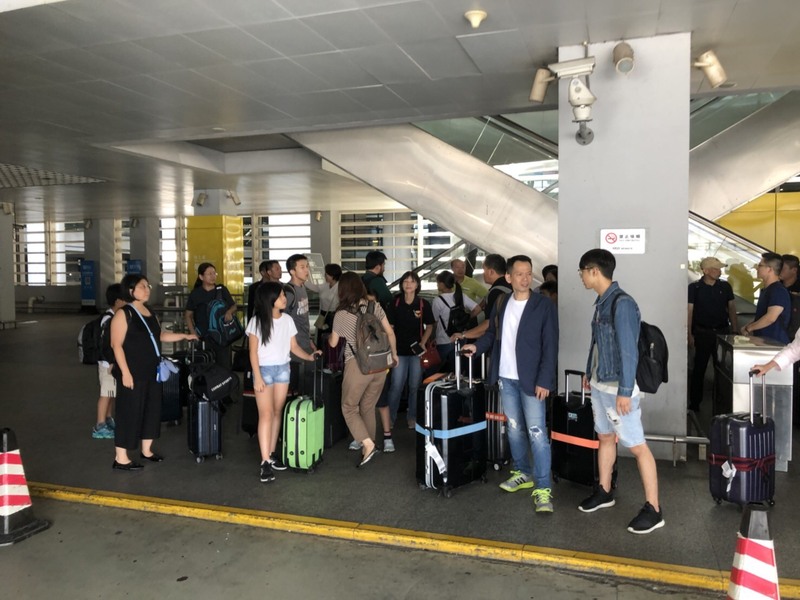 Behind them from right; Global Instructor Chou,Chih-Wen, Note-taker Chia Hao Liu, Global Instructor Toshiyuki Kidokoro, a Board member Liang Hong-tao, ) Global Instructor Ji Bang-yen , Soke IJKA President Keiko Asai, Taiwan IJKA Head of Global Section Lin Maw-tsun. Far back sitting down: IJKA Shuseki Shihan Chen Hunt-tsung, who is overlooking the meeting. Inside and outside of Japan, without belonging to any organizations, there are many people who continue to be devoted in the practice of karate strictly for the pure love for it. IJKA has started accepting these people and membership is growing, with individuals including former students of Master Asai. The first to join IJKA in this way was Akiko Onishi, and the second to join was Hoshiyuki Satomura, with the third being his brother Shogo Satomura. Hoshiyuki, now a father to two children, along with his brother started training when he was three years old while they were still in nursery school. The fourth to join was Masato Nagahiro, and the fifth was Shou Yamamoto, who both looked up to Master Asai. We will introduce more members soon. There are 2 classes, Class A and Class B, for the individual membership. In Class A members are illegible for learning Asai Karate and taking dan exams. 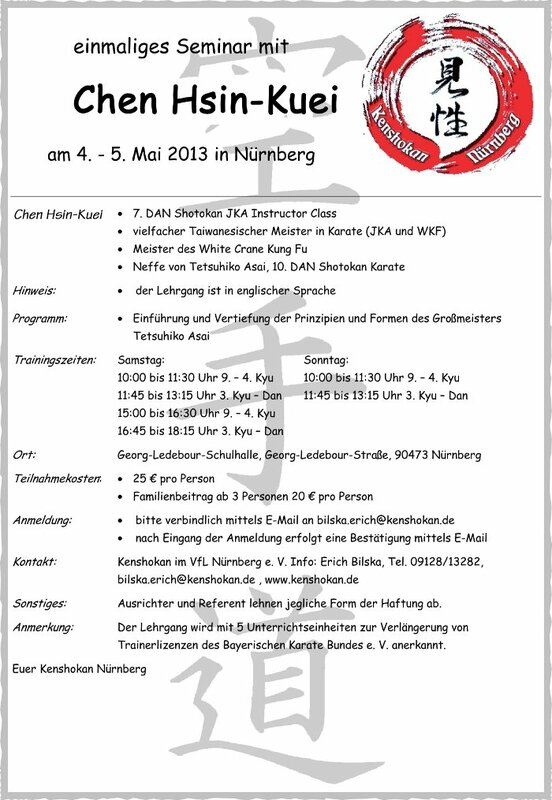 Please see the page for more details 縲係e Now Accept Membership Application from Independent Karate Practitioners縲�. Class B is open to those who had taken a hiatus from karate and also welcomes total beginners, who agree to support activities of IJKA. 窶弩hen Master Asai passed away in 2006, teachers in Taiwan succeeded after him and they have been teaching Asai karate since. 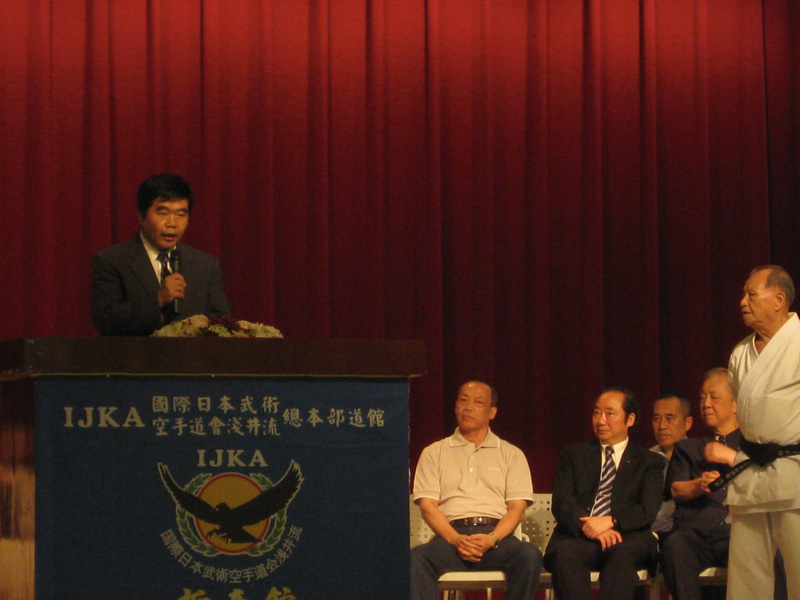 Then in 2010 on March 8th, we officially succeeded IJKA. 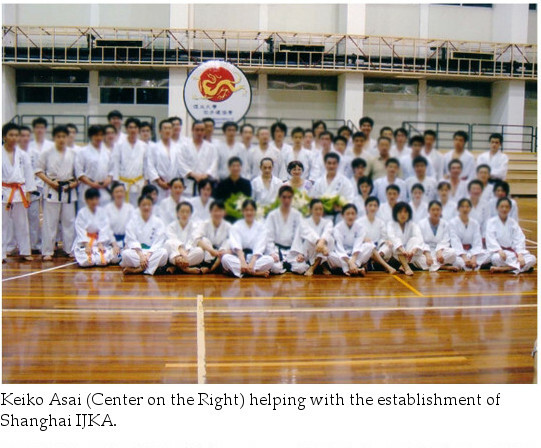 We didn窶冲 suggest you join IJKA as JKS and IJKA were both established by the same Master Asai, and karate practitioners should be able to choose what organization they want to be a part of. I just wanted to tell you this today. 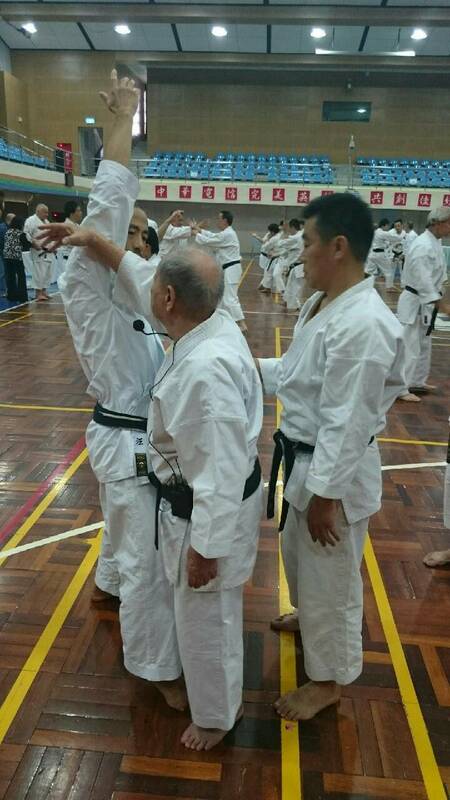 What we learned was a very characteristic Asai karate (*1) developed by Tetsuhiko Asai Shihan. 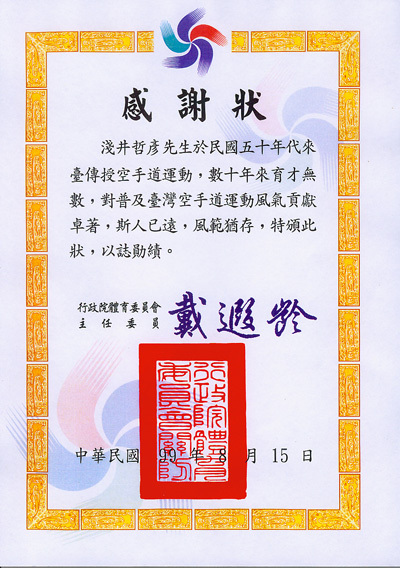 In 2004, 窶彜hoto PE窶� officially joined Asai karatedo. IJKA immediately responded by setting up the instructors with Chen Shihan as the main instructor, and started teaching us the karate techniques. I would like to briefly explain the reason and the background behind my decision to join IJKA. Thanks to Mrs. Asai窶冱 arrangement and support from some sponsors, myself and a few others were able to have the opportunity to meet with Master Asai in Shanghai, and participated in the karate training organized by the group established by Master Asai. 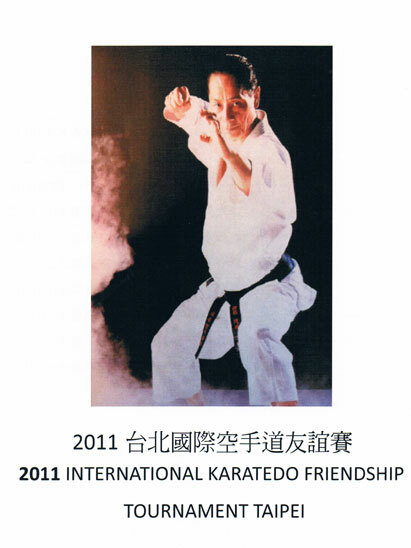 Master Asai appointed Chief instructor Mr. Chan Hontsung as our karatedo instructor. I was very thankful to both the late Master Asai and Mrs. Asai for their consideration. 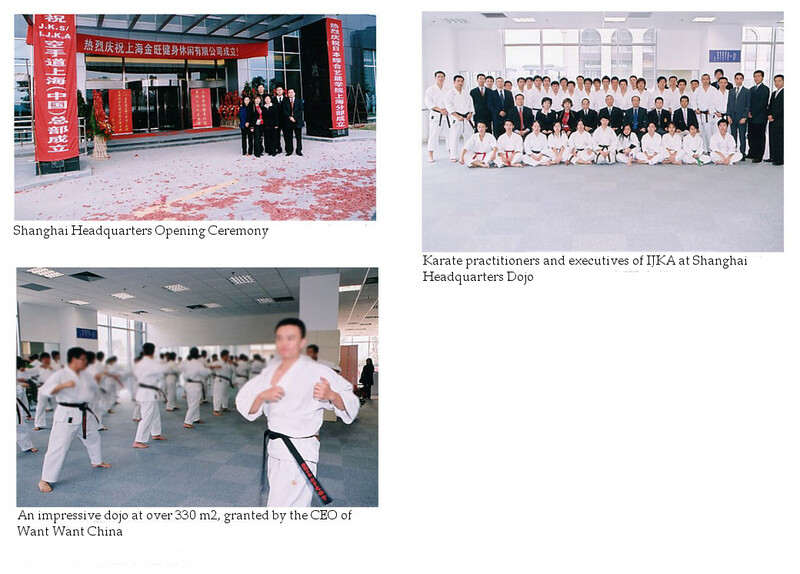 Master Asai then started up JKS and IJKA China headquarters and a Shanghai branch. After Master Asai窶冱 passing, we continued training and maintaining our organization, under the guidance of the master in Taiwan. 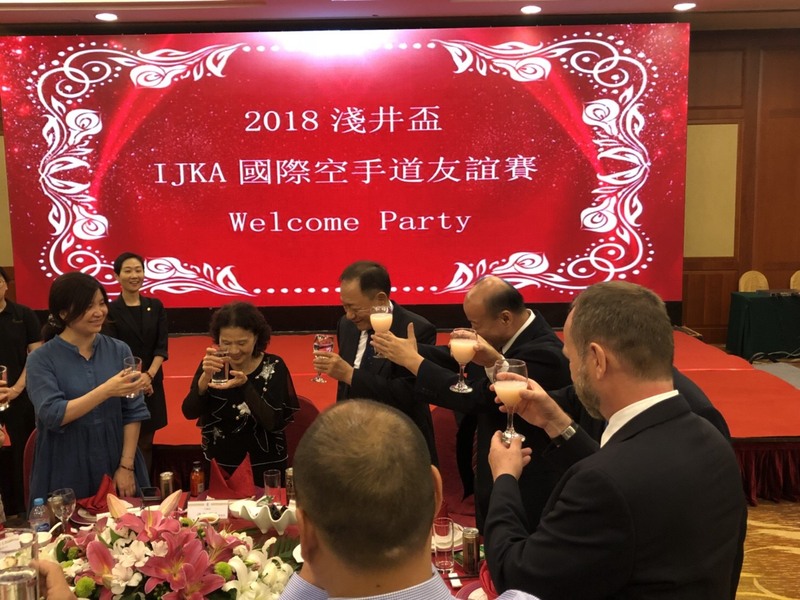 During this period, we stopped receiving contacts from IJKA China headquarters and Shanghai branch. We really didn窶冲 know what the situation was at the time. In 2011, the masters in Taiwan left JKS. They didn窶冲 tell us to follow them and also leave JKS. Naturally, we ended up inheriting the JKS China headquarters and Shanghai branch, and received approval from JKS General Headquarters. I myself became the person who was responsible for JKS China Headquarters. Between 2011 and 2016, I personally put everything towards the development of karate. 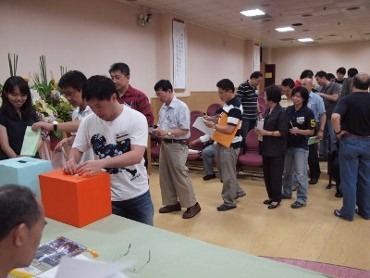 During that period, JKS-China used to host international training seminars and dan examinations every year in May. 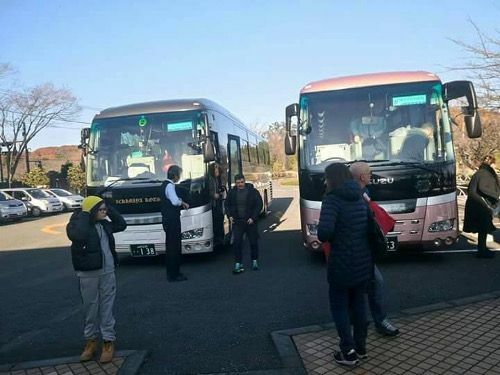 At the same time, I used to take our members to Japan every December to join the training seminar hosted by the Japan JKS General Headquarters. I also personally kept in touch with the masters in Taiwan, which I thought was only natural. When we joined a seminar by the Japan JKS General Headquarters again on December 3rd 2016, the masters from the general headquarters stated to me clearly that my personal relationship with IJKA had caused the suspension of the Chinese headquarters membership. I told them right then to not mix official and private matters. However, JKS General Headquarters claimed that even personal relationships are in danger of being used to put JKS at a disadvantage. 1. Those who have already acquired dan and membership are eligible to contact the general headquarters directly and apply for a branch membership. 2. Many organizations have hostile relations with our organization. The members of JKS are not permitted to participate in any of the activities hosted by these groups. I personally respect the decisions made by the masters from the JKS General Headquarters. When I returned to Shanghai on December 5th, I announced to all the JKS members found in the boundaries of China the decisions. At the same time, I declared that JKS-CHINA has been shut down. Since then, I did my best to close down the organization smoothly. 3. I will leave JKS. I applied for a membership with IJKA one month after I officially left JKS. During the month, I did not ask anyone publically to come with me, or join any organization. During this period, for various reasons, countless slanderous comments were made toward myself and to my organization. I still strongly hold onto the feelings I used to receive from Master Asai. 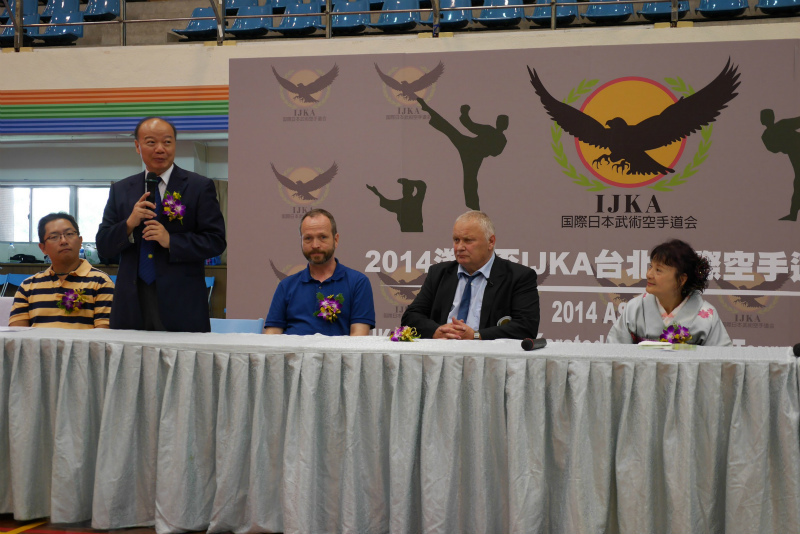 縲�縲�The two members above are appointed as the official assistant for IJKA Europe Head of instructor, Bruno Koller. 2. Ji,-Bang -Yen is appointed as a global instructor working under the Global Instructor Committee. 3. We hereby declare the establishment of Global Instructor Committee. 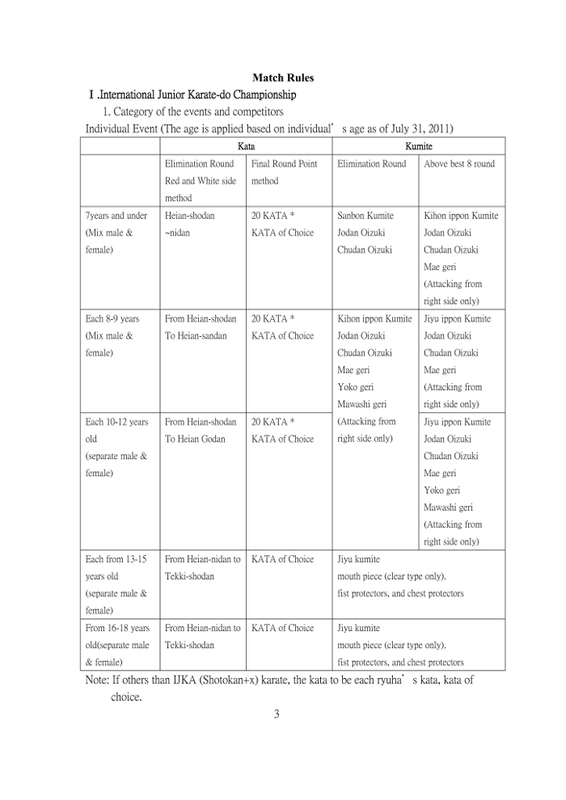 According to these emails, there are many karate lovers , who quit karate at some point in their lives because of some personal reasons (such as work, studies, marriage, health issues, etc.) but have come back to it. Furthermore, these people do not intend to join any karate organizations; they simply want to keep practicing, including the katas created by Master Tetsuhiko Asai, and acquire the skills. 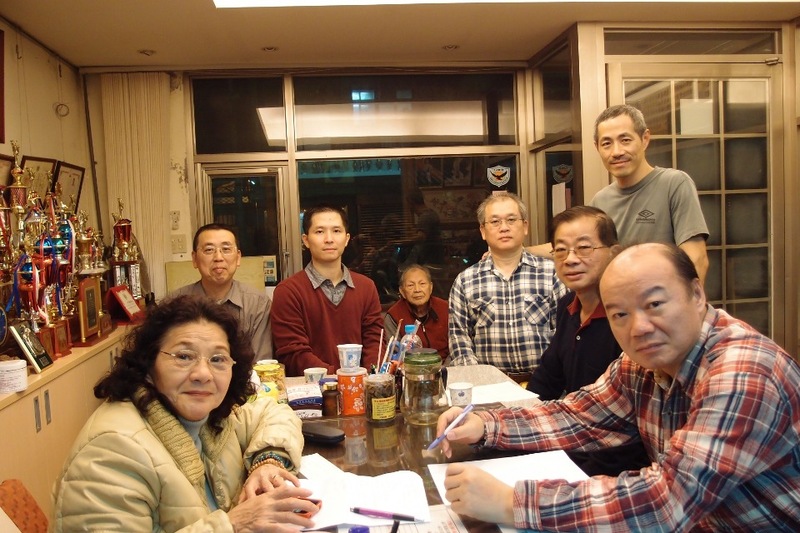 For that reason,SOKE IJKA has decided to accept those individuals who don窶冲 belong to any kind of organizations, and allow them to join us in training. Master Asai was not concerned about what schools or ryu of karate people practiced, so the admission to SOKE IJKA is decided regardless of their schools. The admission is limited however, to those who love karate and has healthy mind and body. Preparations for the movie 窶弋he Story of Tetsuhiko Asai (Draft)窶� are well underway, and its production is scheduled to launch this May. The theme of the movie has been finalized: it focuses on how the late Master Asai introduced and spread karate in Taiwan, and how he came to be known as the 窶拉ather of Taiwan karate." 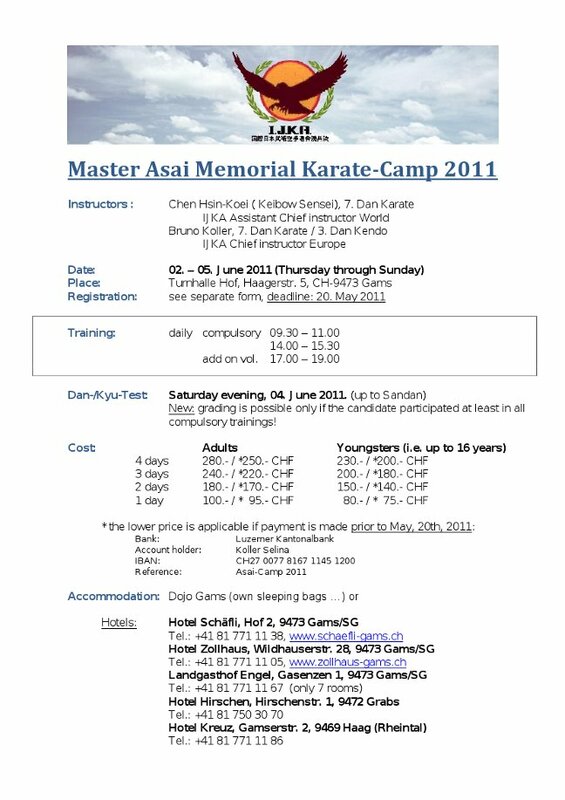 Or email the application to: info@ijka.jp"
This year will mark the 10th anniversary since the passing of Master Asai. 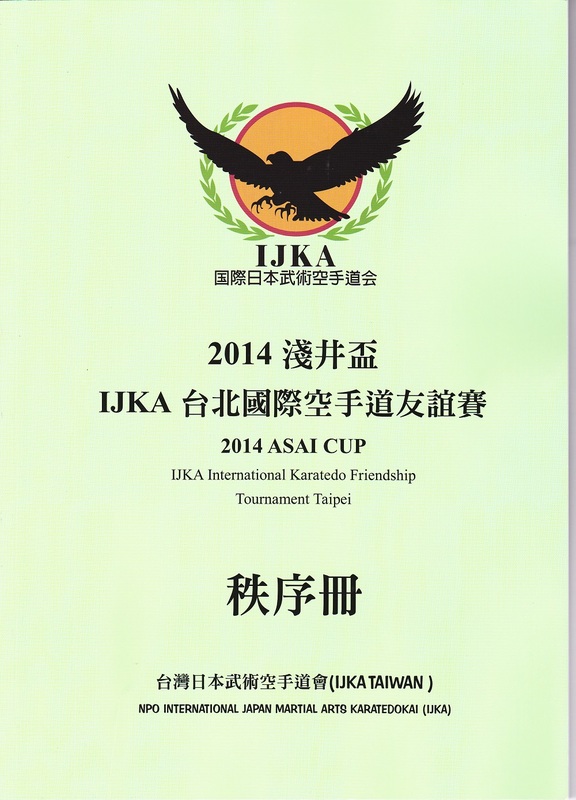 To commemorate this event, this year窶冱 IJKA Asai Cup International Friendship Karate Tournament will be held in Taipei, Taiwan. The dates have been decided as October 15thand 16th, and this took into consideration the typhoon season and children窶冱 school schedule. 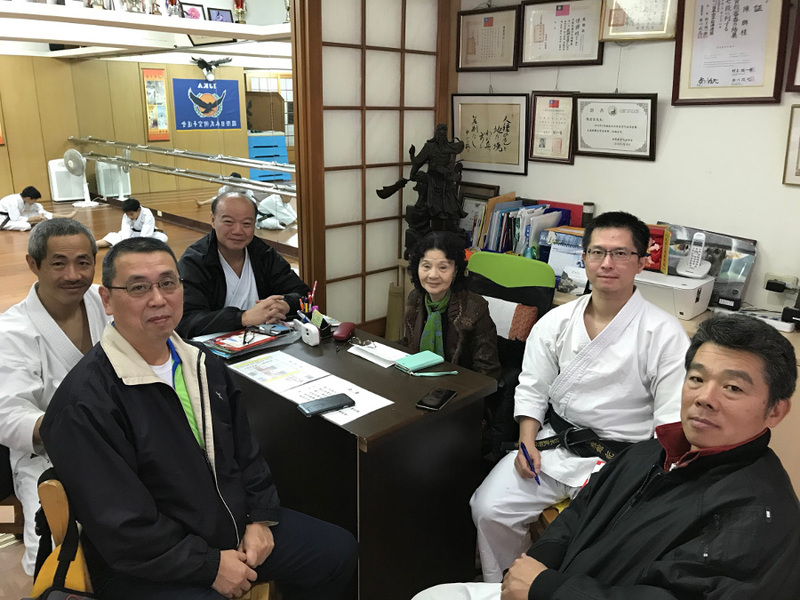 The decision was made at the meeting (held on January 8th) attended by IJKA Soke, Shuseki Shihan Chen hunt-tsung, the technical office, and the head of the technical office Chen Hsin-koei, instructor Mr. Toshiyuki Kidokoro, Mr. Wang Ju-yu, Mr. Chou, Chih-Wen, and the director in Taiwan. The location and the dates were later agreed to by other global instructors such as Mr. Otto Riedinger, and Mr. Bruno Koller. 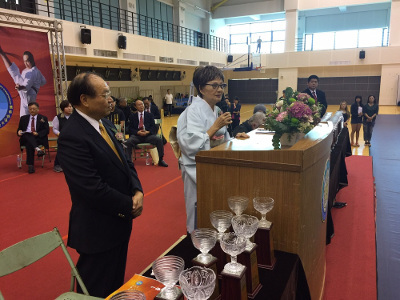 On December 20th 2015, President IJKA Soke Keiko Asai visited the IJKA Taiwan Honbu Dojo. Every students was training hard and their enthusiasm filled the room. Every students was training hard and their enthusiasm filled the room. Many students come as a family. The two students at the far end are a mom and dad. It was only the daughter at first, but as the dad was dropping off and picking up his daughter at the dojo, he decided to join himself. Then the mom joined. They are both university professors. During a break, the sister, who has more experience, was kindly teaching a younger one. 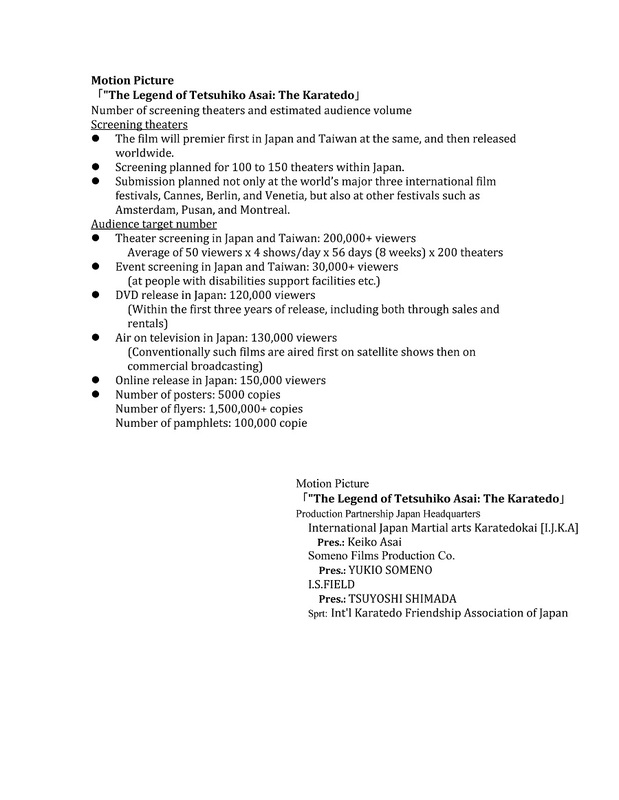 窶弋he Legend of Tetsuhiko Asai Karatedo窶� Film Production Finalized! 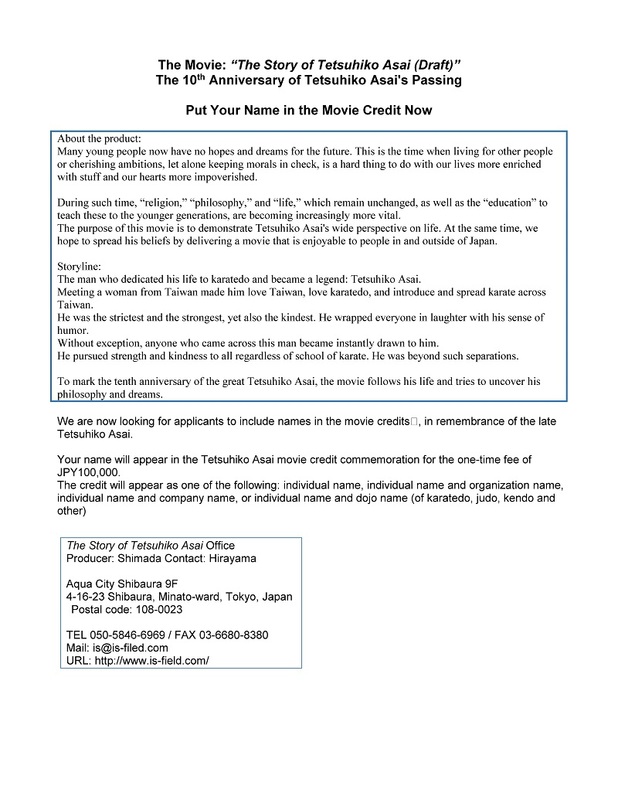 for the production of a film about the legend of the late Master Asai's karatedo. The Department of Public Information in Taiwan extended generous support to the film crew, and released the news to the major local newspapers. 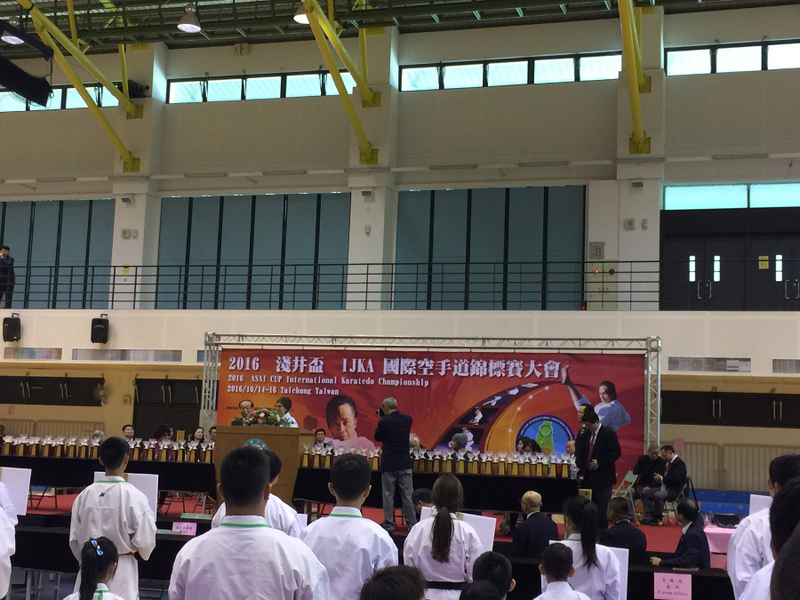 Taiwanese karatedo athletes have been showing outstanding results at international tournaments. At the root of this is the great master of the Japanese karatedo, Tetsuhiko Asai. 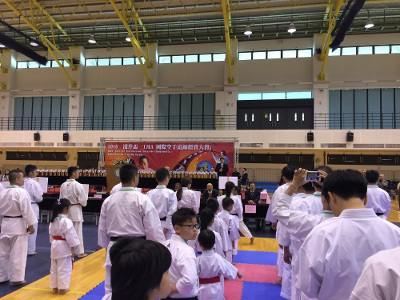 Close to 80 % of high-performing karate athletes from Taiwan are either Asai's pupils, or second generation pupils. 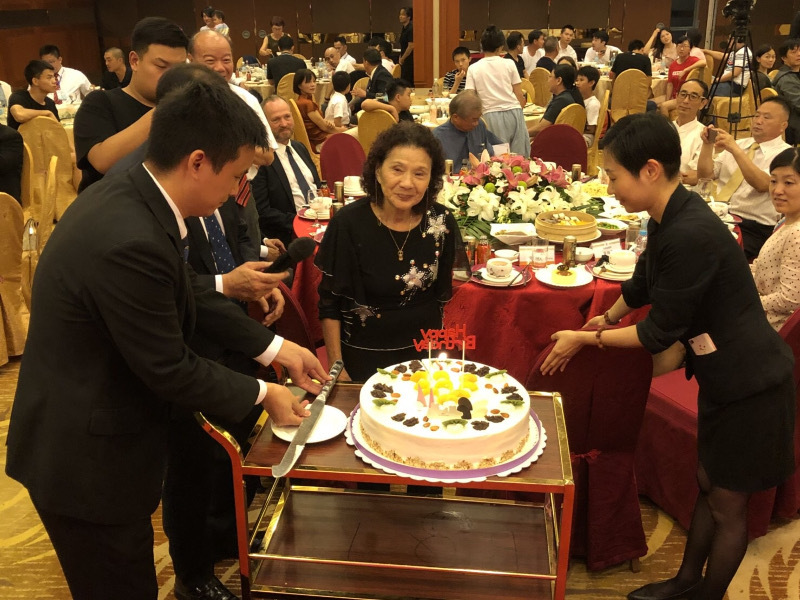 His wife, a famous Taiwanese celebrity, Keiko Asai, is nowplanning to start production of a film to celebrate the great legacy that her husband left with us. The Department of Public Information has announced that it would extend its full support to the production team. From 窶徃irls self-defense窶� to 窶很arate shiharadori,窶� these were all created by the great master Asai through his tireless training. 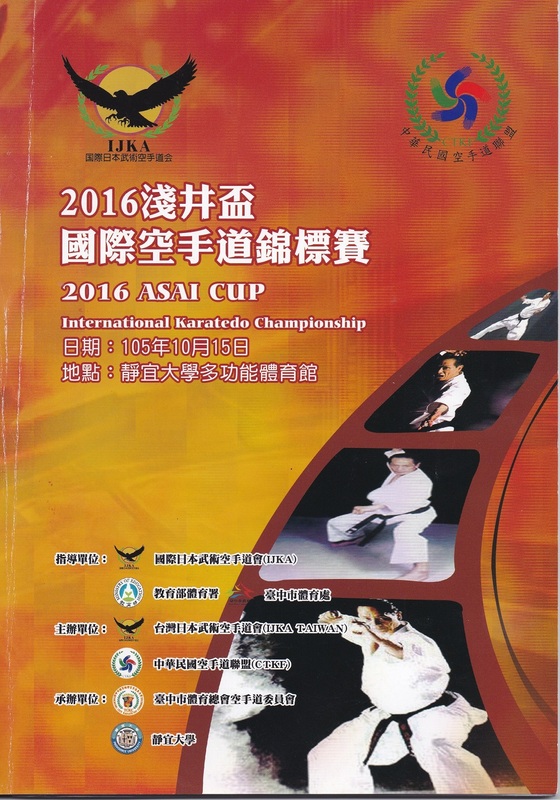 As mentioned, 80% of star Taiwanese karatedo athletes have inherited Asai karate. Master Asai, who recognized the good physique of the Taiwanese and their natural talent for martial-arts, established the first dojo in Taichung in 1964. This did not stop karate from spreading. His technique requires speed, and it's known to deter opponents before they can make a single move. 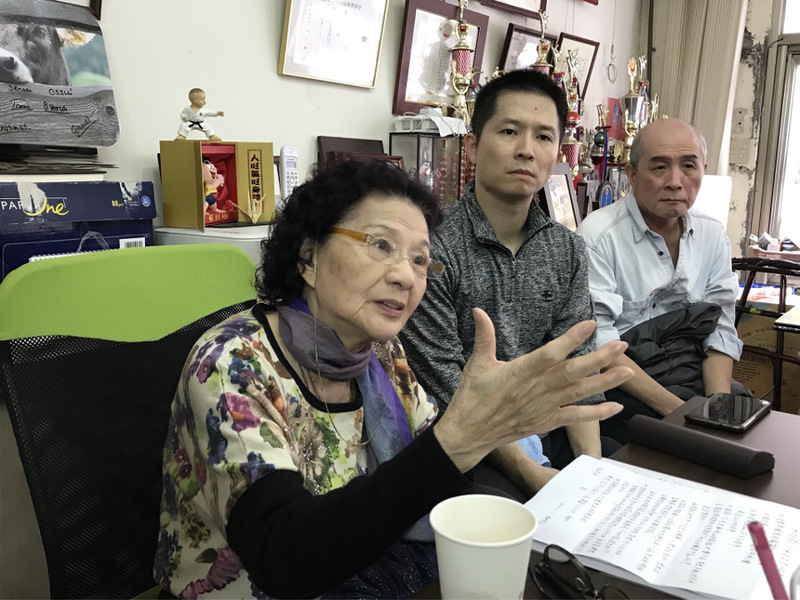 A native of Taipei, Keiko Asai is about to launch production for the movie 窶弋he Father of Taiwanese Karatedo: Tetsuhiko Asai,窶� to commemorate the late master Asai's accomplishments, and to document the development of Taiwanese karatedo. She spent a few days in TAIWAN with the film producer as well as the director, to research the historical background of the 1960's. 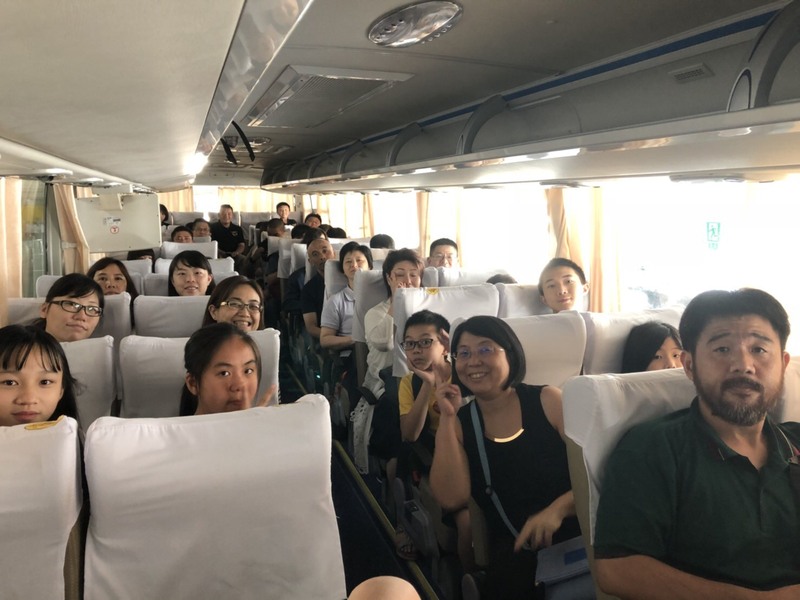 They also went location scouting at places like the elementary school affiliated with National Taichung University of Education and National Taichung Girls' Senior High School. The filming will officially start next year, including auditions for cast members. 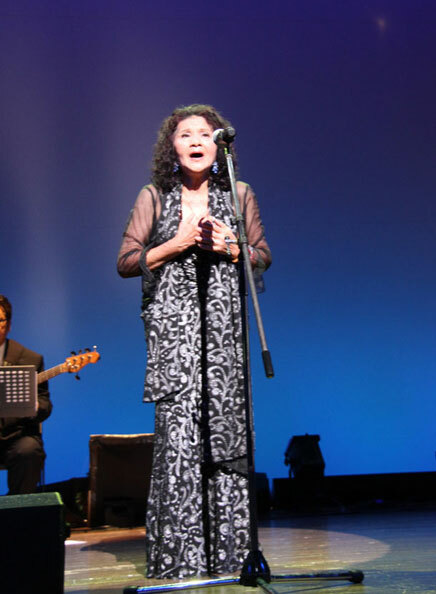 Keiko Asai (髯ｳ諱ｵ迴�) was born in 1940. She later became a star actress at the Taiwanese movie company 荳ｭ螟ｮ譏�逕ｻ莨夂､ｾ. She also appeared in many movies and TV shows in Japan, which eventually led her to meet and marry the Japanese karateka Asai Tetsuhiko in 1963. She then moved her base to Japan. 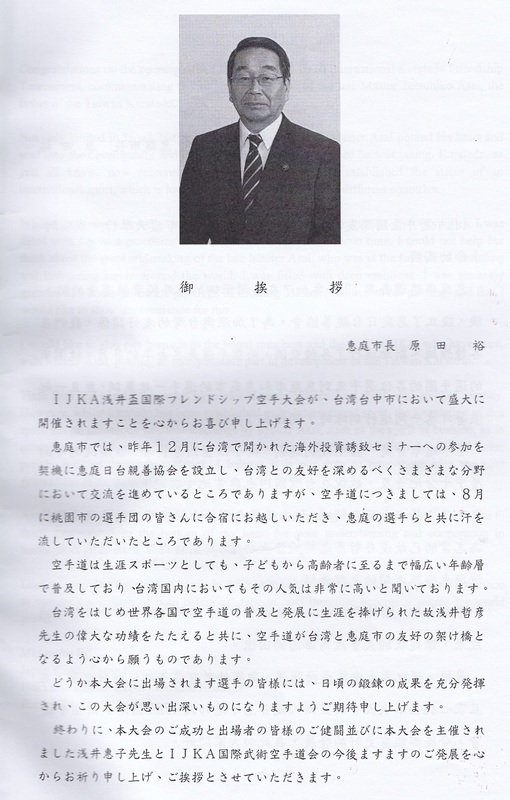 According to the Department of Public Information, Mr. Asai officially introduced Japan's Shotokan karate to Taiwan in 1964 and was crowned the title of 窶徼he father of Taiwanese karate.窶� Mrs. Asai supported her husband with establishing dojos across Taiwan, as well as in Hawaii, Hong Kong, Germany, Switzerland, Sweden, Denmark and Shanghai. 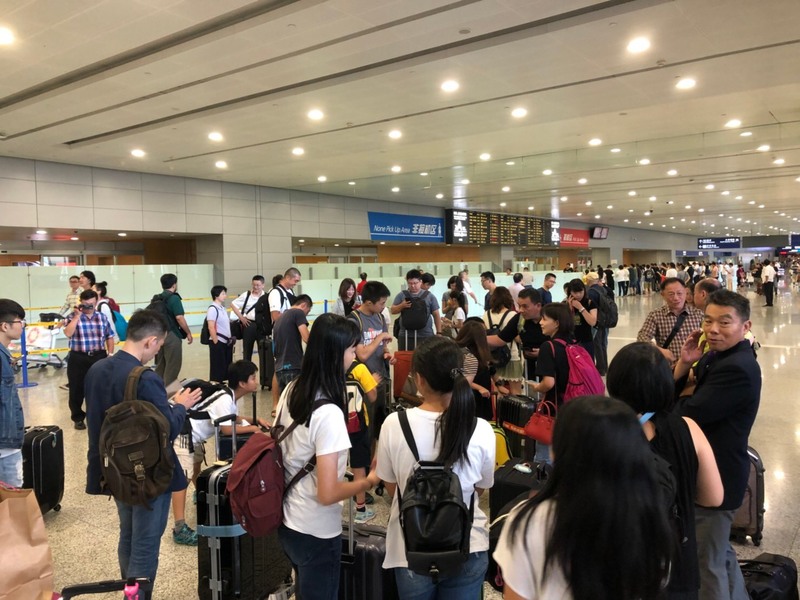 When I returned from Taoyuan to my hotel and finally caught my breath, I sat there and felt a sense of relief wash over me. I've been trying my best to do something for Japan and Taiwan, but this time it seems like I can really help Eniwa city of Hokkaido Japan and Taoyuan city of Taiwan, and both seemed happy about the project. The last day was spent in Taichung This is the city where I was born and raised. It's also the birth place of Taiwanese karate, so the whole crew is very excited about the visit. 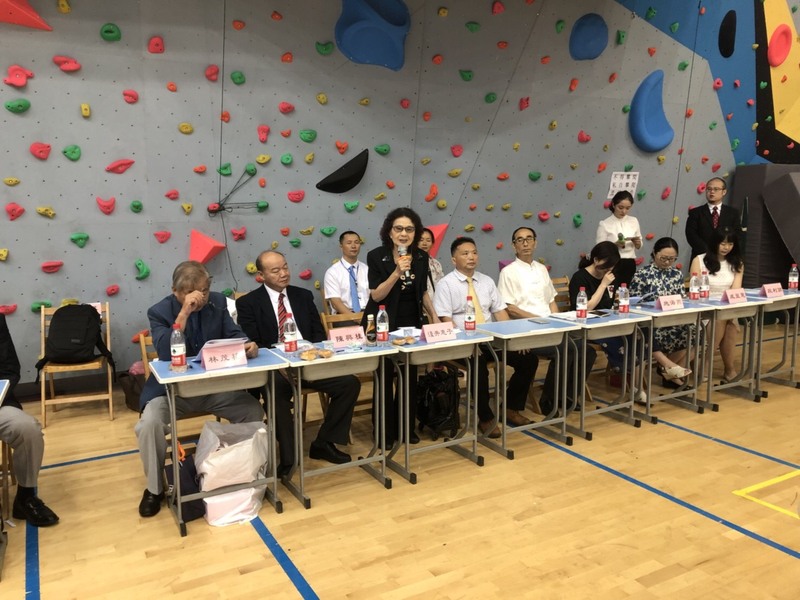 As I wrote in my blog on June 15th, when I first visited the city with Someno-san, Mr.Fang (謌ｿ迹樊枚), the director of the Department of Sports, and Mr. Lin (譫礼ｧ玖成), the director of the Department of Public Information, both from the municipal government, hosted us very courteously. I was hoping to meet them again, but our correspondence at the end of September told us that they were too busy. I would've liked to delay our TAIWAN visit but our movie director, who is also a very busy man himself, couldn't reschedule the trip, so even though I couldn't arrange a meeting with the officials, we came to Taiwan on October 11th, as originally planned. So, initially we had no plans to visit Taichung, but we got a surprise call from Mr.Fang on 13th asking us if were in Taiwan. I told him yes, and he said they would be waiting for us on the 14th. The time was up to us. Our film producer Shimada-san, director Shimomura-san, a secretary, and I hopped on a bullet train and headed to Taichung for a ten o'clock meeting. government building, and then guided us to meet Mr.Lin. Mr. Fang made some time for us in his busy schedule, and joined the meeting. He even gave each of us a present. He kindly offered to support the film production in any way he could, so I asked him to contact the elementary school affiliated with the National Taichung University of Education for a permission for us to look around the school. This school is one of the most prestigious schools, and I thought it would be a difficult for us to enter. Mr.Fang said he would gladly help with these specific requests, and he called the school right away. Mr. Lin told us that he would help us with arranging the movie sets and other location-related matters, equipment, props, transportation, and staff. He then said that the government could grant a subsidy and that I should apply. We are so lucky to have these officials' understanding and their kind support. After the conference, Mr. Lin arranged us a ride and we looked around the city for about two hours including my school. This day was another day filled with pure gratitude. 縲� I hope you are well and healthy and everything is ok in Tokyo. event with a top class teacher who let us participate in his huge knowledge in Karate and Martial Arts. a member of the IJKA family. 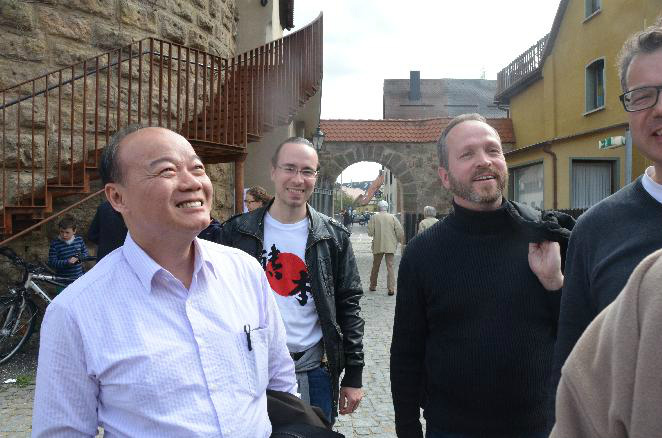 Please find enclosed a few fotos of Keibou Sensei's stay in Germany. Unfortunately i did not take too much pictures this time because I was practicing all the time. 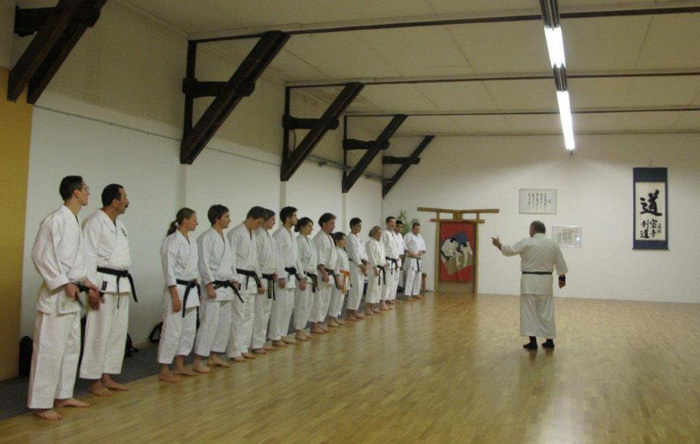 Keibou Sensei was teaching Tekki Nidan. taken during sightseeing around Nuremberg. 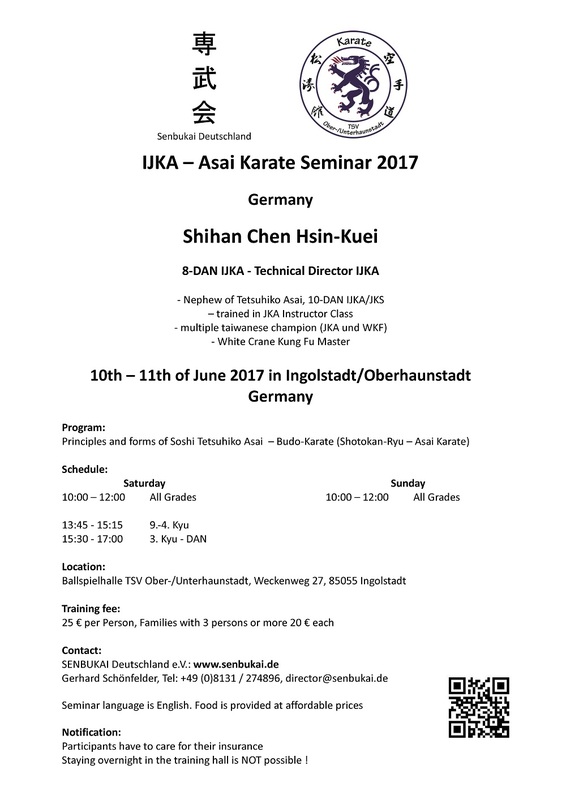 "Kenseikan Germany And Senbukai Germany Are To Cohost A Karate Seminar." 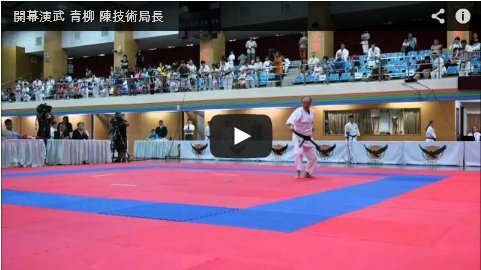 Footage: Embu of Bujyutu Karate with the global instructor Wang Ju-yu. 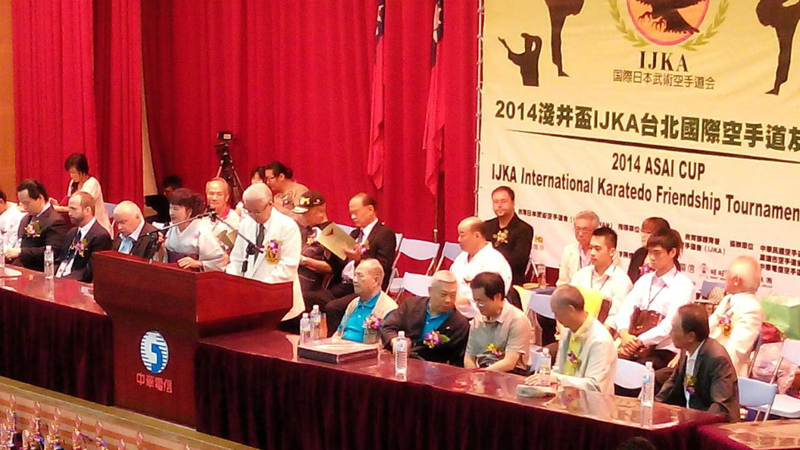 The participants agree to the Presidents proposal as to organizing IJKA along the lines of traditional Budo schools. 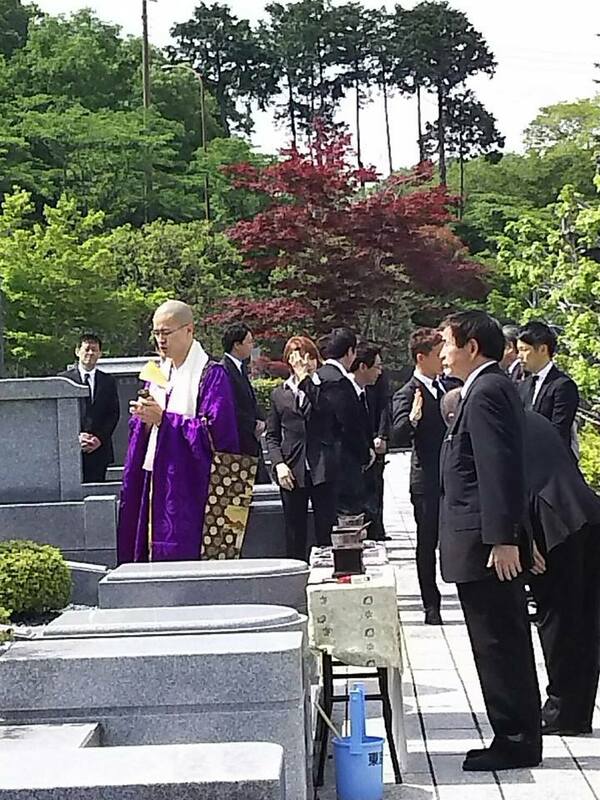 So from now on, Asai Tetsuhiko Sensei is Kaiso (Founder) and Soshi (Original master of the IJKA). As Founder, he is 1st Generation. 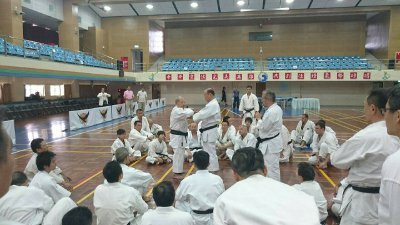 50 years ago, Asai Tetsuhiko Sensei came to Taiwan to teach Karate. He met his brother-in-law Chen Hunt-tsung Sensei, who was already a master of White Crane Kung Fu. They exchanged techniques and created the basic principles of what was to become Asai Karate. So Asai Karate as a martial art is a hybrid of Shotokan Karate, White Crane Kung Fu, Judo and includes useful techniques of other martial arts as well. The instructors will receive information from Mrs. Asai as how to create special Makiwara pads for daily training. Italy's IJKA global instructor, Mr. Formenton, agreed to host the next Asai Cup IJKA Karatedo Tournament and it was agreed by all meeting attendees. Instructor Toshiyuki Kidokoro, Wang Ju-yu, Chou, Chih-Wen. 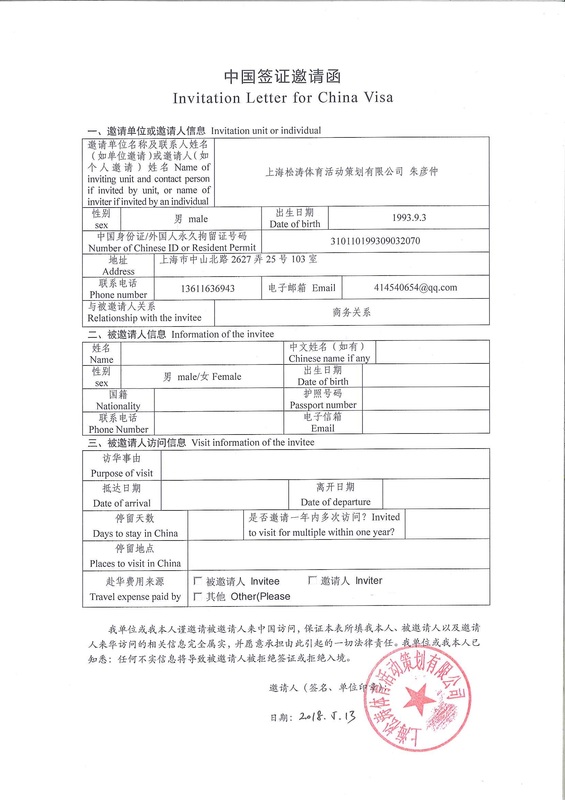 documents such as certificates and Passports. We are grateful to receive so many applications to join IJKA. However, we will be granting membership only after we conduct an interview with each applicant, in order to prevent the reoccurrence of the corrupt incidents that we saw in Germany and the US. This, we are taking a prudent approach to making our family bigger. 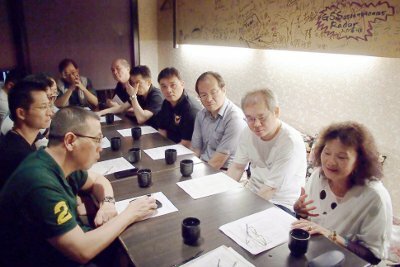 For those who are interested in having an interview, please consider coming to Taipei, Taiwan for the Second International Friendship Karate Tournament in September, where you would have a chance to meet with the IJKA Chief Instructor, IJKA instructors, Director of IJKA, and other board members. 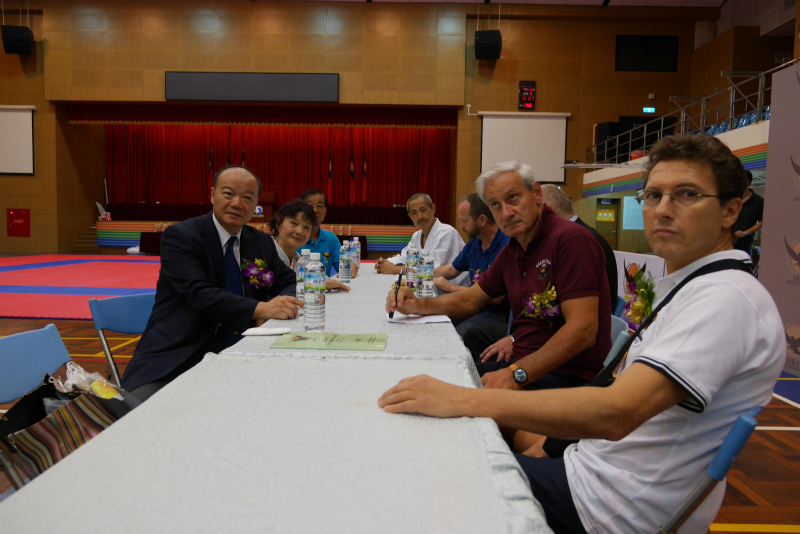 For those who are interested but not able to come to Taipei, we recommend meeting with Bruno Koller (IJKA Europe Region Head), Otto Riedinger (IJKA Germany Chief Instructor), or Giuseppe Formenton (IJKA Italy Chief Instructor) for the interview. As a countermeasure against the individual member who stole the IJKA's logo and applied for patency, we submitted an official objection to the German Patent Office with some supporting documents to show the use of the logo in the past, including documents from the 2011 International Karatedo Friendship Tournament and pictures from the karate seminars in Italy and Switzerland where the head of technical office Mr. Chen Hsin-koei was coaching. 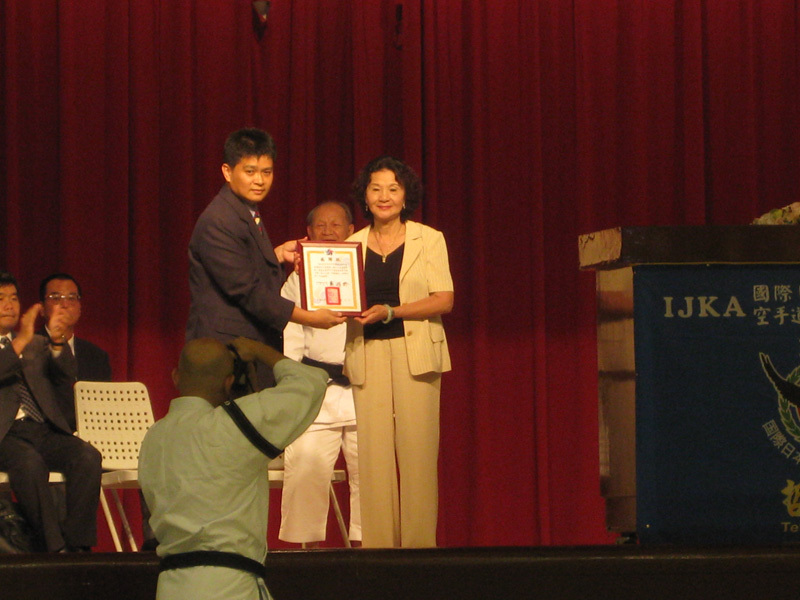 The individual also issued a dan certificate without being qualified as an official IJKA examiner. For that reason, we expelled this member and posted the announcement on our website. The tournament was initially planned to take place in Italy along with technical seminars and qualification exams, but for technical reasons the event had to be postponed. For that reason, we will hold the tournament in Taiwan in March/April this year. The preparation for the event will move forward once the President contacts member countries, such as Italy, Switzerland and Germany and other country members, for confirmation and ensures that the schedule works for everyone. The President is actively promoting culture exchange between Japan and Taiwan, from Tokyo. The group she leads currently mainly focuses on music, art, culture and martial arts, but karatedo will be added to the list going forward, and she is now recruiting participants. This way, she hopes to strengthen the ties between Japan and Taiwan. 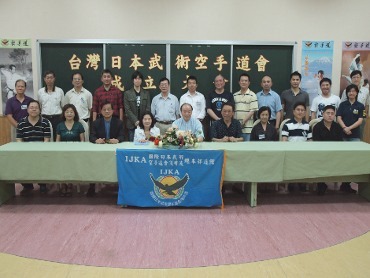 Upon receiving agreements from core country members, the IJKA has decided to hold the event at Chunghwa Telegram Co.,Ltd. Zhong Zheng Hall Gymnasium in Taipei. For the details of the event, please see the announcement from Taiwan Honbu Dojo. 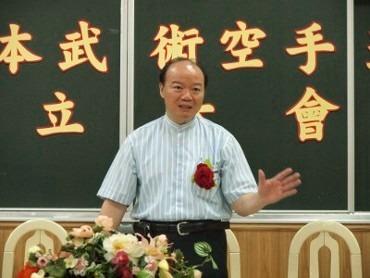 Mr. Formenton said that 窶彈the karateka of late is not very reliable and think only about power, money and Dan. When I read this email, my eyes were filled with hot tears. This is the core of Karate Spirit and therefore Bushido. even if it leaves him alone. This is the essence of our Master Asai's IJKA Karate. Other details are to come after the President receives agreements from member countries. We will keep you posted. You used Master Asai窶冱 picture and IJKA logo without permission. 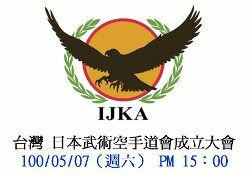 The current IJKA窶冱 official logo was designed by Master Asai, and made after much practice and many months. Dozens of sketches are still kept with care, and since there are too many to share, I would like to introduce three of his logos with you here. and they are said to be keeping watch on evil. People respect the bird for its graceful flight and dignity, despite the bird窶冱 loneliness. For that reason, Master Asai placed a picture of an eagle with the IJKA name, with the spirit that he too would watch over IJKA and protect it. I also helped, as his wife, for deciding the final design, including the color placements. We made dozens and dozens of designs and spent many days finalizing the logo. Goshi Yamaguchi sensei, who is the son of the late Gogen Yamaguchi, the founder of the International Karate-do Goju Kai Association, sent us Gogen sensei窶冱 legendary karatedo DVD. The late Master Asai was close with Gogen sensei, and even after Gogen sensei窶冱 passing, Master Asai kept a good rapport with his son, Goshi sensei. More than once Goshi sensei sent congratulatory gifts to the karate tournaments Master Asai hosted. On numerous occasions I accompanied Master Asai to visit Gogen sensei, and saw the two talking and laughing so happily. He was also very nice to me. So I think it is not surprising that when I watched the video my heart was filled with emotion. 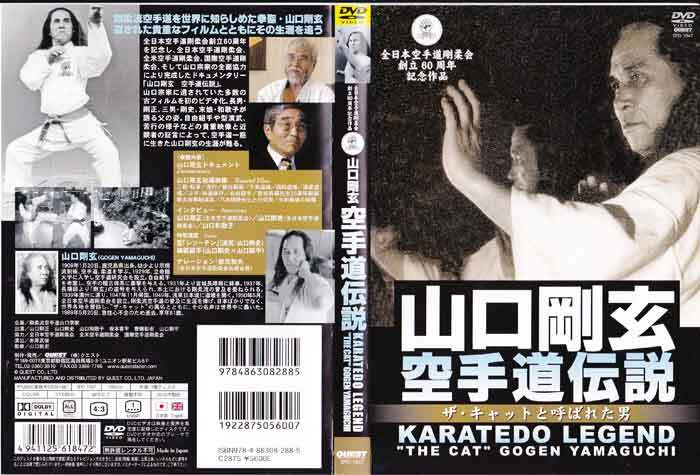 I wish to share with everyone this great DVD and the legacy Gogen sensei left for us. Unfortunately, because of copyright issues I am not able to post the video, but the DVD is now available, and anyone who wishes to watch it can order a copy from below. Dan Grading Heats Up at IJKA Taipei Honbu Dojo Tetsuhiko Kan.
On June 30th, the annual kyu and dan examinations were held at IJKA Taipei Honbu Dojo Tetsuhiko Kan. Kids trained hard without break for this event over the past year. They were filled with anticipation and showed powerful karate. The Dojo was bursting with excitement, and they touched the heart of the observers窶�. The examination went on until late in the evening. We will unify the IJKA logo globally to the one that does not include the word "Asai-ryu." 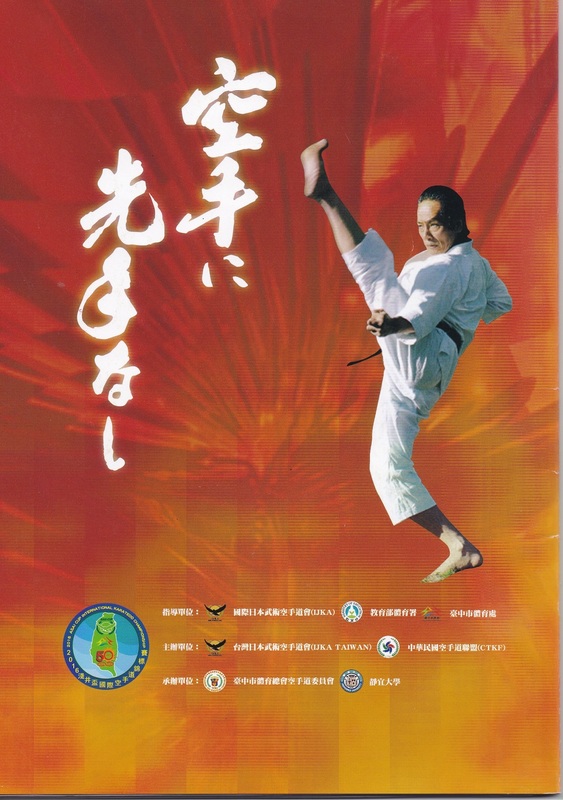 The reason for eliminating the word "Asai-ryu" from the organization's name is because Master Asai himself did not want to insist on one particular style. Considering this, we will not restrict our group only to "Asai-ryu." You may however still call it ASAI KARATE. Instructor Committee, Kyu and Dan Review Committee, and Tournament Judge Committee. the judge, the referee, and the dan test examiner must possess. * Follow the already laid out policies for the instructor qualification. 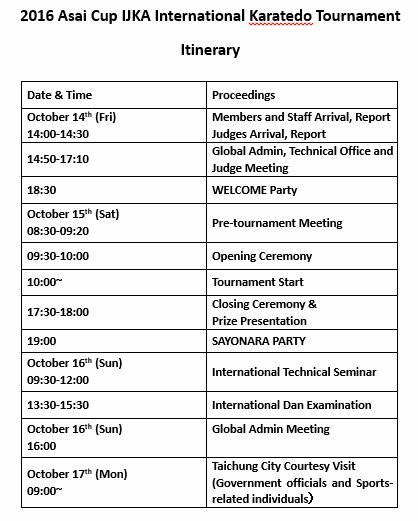 * The tournament judge qualification is to be decided upon the Head of Technical Office and the Chief Instructor窶冱 approvals. * The judges will be categorized into three ranks: Global, Regional, and National. 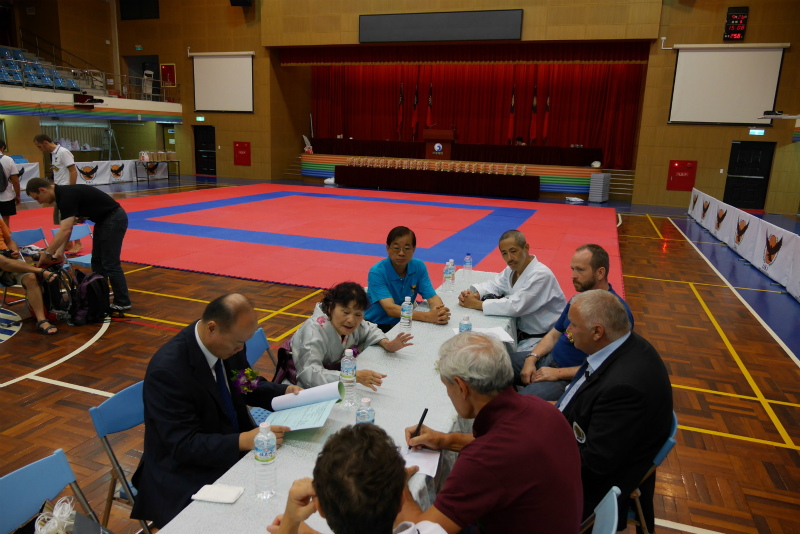 Assign assistant judges in order to train members for becoming tournament judges, and prepare to meet the demands for judges at next year窶冱 international tournament in Italy. * Make English names for judges and assistant judges consistent. * Establish a policy that candidates for tournament judges must have experience in Kumite. Mr. Chen (Hsin-koei)窶冱 talk on the original concept of IJKA karate and instruction on the techniques, as well as his demonstration fights were very good and easy for everyone to understand. They helped the seminar participants understand what everyone was saying about the differences in technique, sophistication, and intensity in IJKA Asai Karate and other karate styles. Comment from Otto sensei from Germany on criteria for members having a role in IJKA organizational activities There are many regional groups in Europe, and since IJKA is still a young organization, and since having seminar is a good way to promote the group, we should not set up a criteria for that. 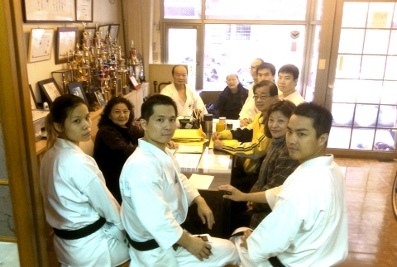 For qualifying members for dan examiners, instructors and tournament judges, we must be careful in their selection. Regarding the international friendship karate tournament in Italy ? We are not able to move the matter forward at this point since the person in charge of the event, Mr. Formenton, unfortunately could not attend the meeting, but he said in his email that he is intending to meet with Mr.Chen in September at the Italy seminar to discuss the details with him then. 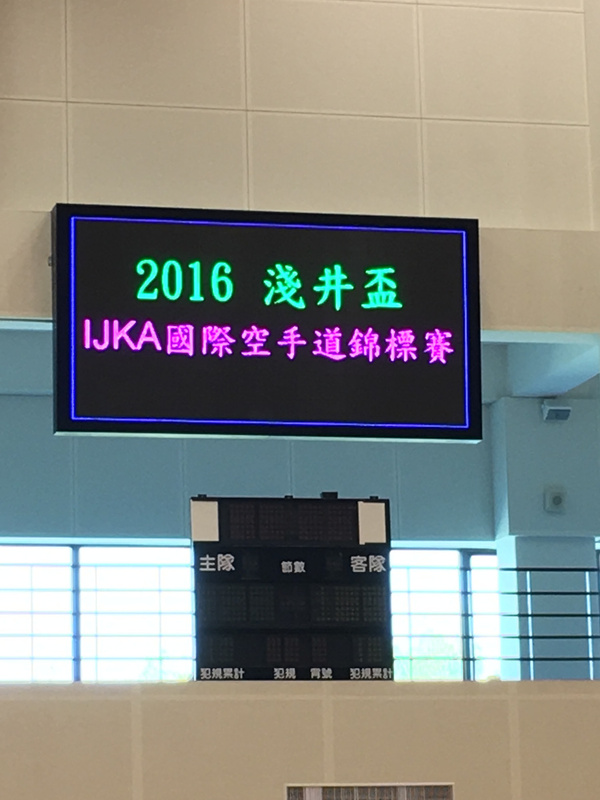 Every member should follow the updates on IJKA website to know the organization窶� s activities. Also, when you receive an email from the Japan Headquarters, please reply as swiftly as possible, so that the Secretariat does not have to send another email to make sure the first one is received. A short message such as 窶弋hanks for the email. We will reply soon窶� will suffice. * Everyone agreed. About qualification credentials and membership fee payment for applicants wishing to join IJKA. Membership applicants must submit documentation on his/her karate background such as certificates, in order to carry out the administration process more smoothly. In order to reduce the bank-processing fee on both sides, the membership payment must be done through Pay-Pal in Japanese yen. The appointment letters for each of the organization窶冱 positions are being made in both Japanese and English, with Mr. Lin Quanzheng窶冱 support. Make the IJKA logo consistent across countries. * Ms. Selina asked if they could add the sky to the background, but Mr. Lin did not accept the change. 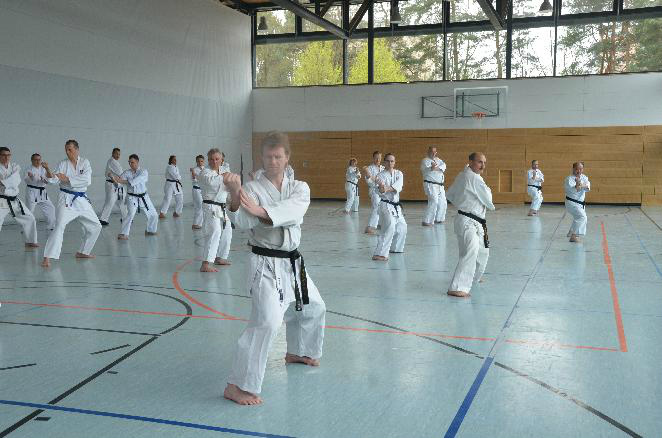 We have received pictures from Special Karate Seminar Germany that took place in Nuremberg on May 4th and in Munich on May 5th as well as from Master Asai Memorial Camp that place in Europe Honbu Dojo in Switzerland on May 9th. 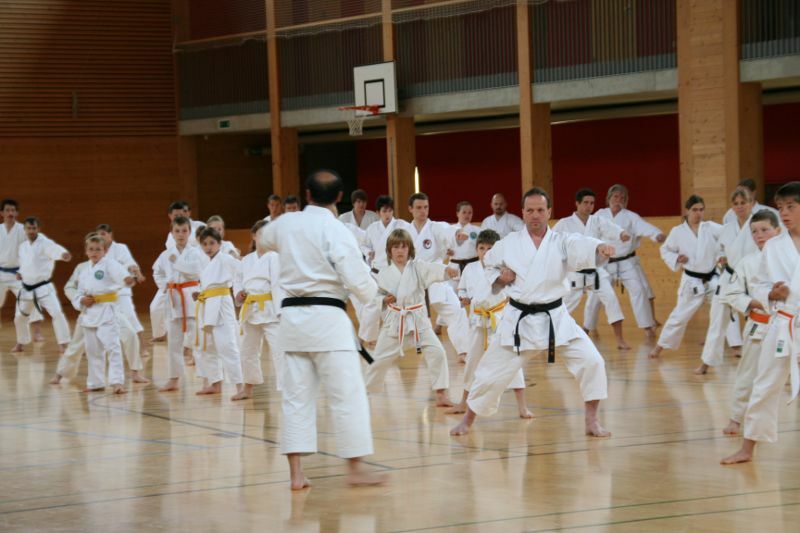 Photos from Special Karate Seminar in Nuremberg, Germany. May 4th. 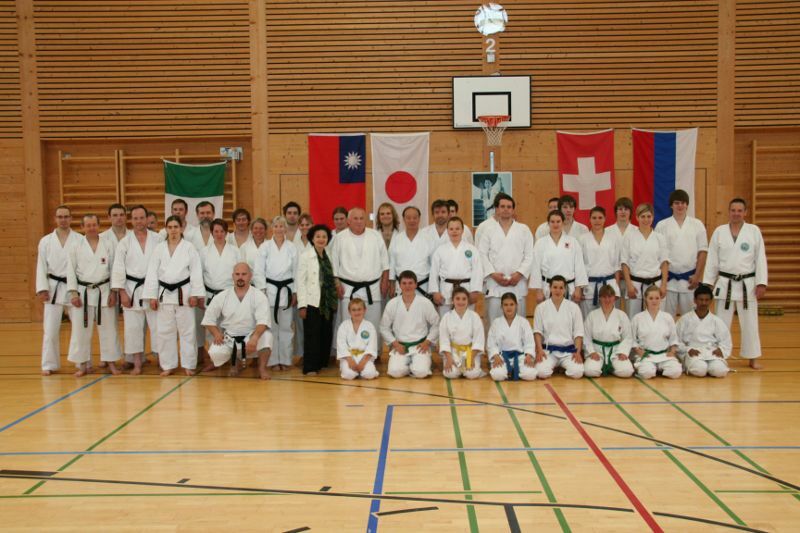 Photos from Special Karate Seminar in Munich, Germany. May 5th. 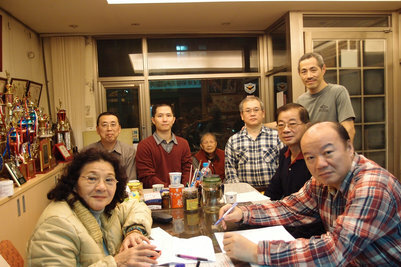 Section Chief of IJKA Main Dojo in Taipei. gathered from different regions in Germany. 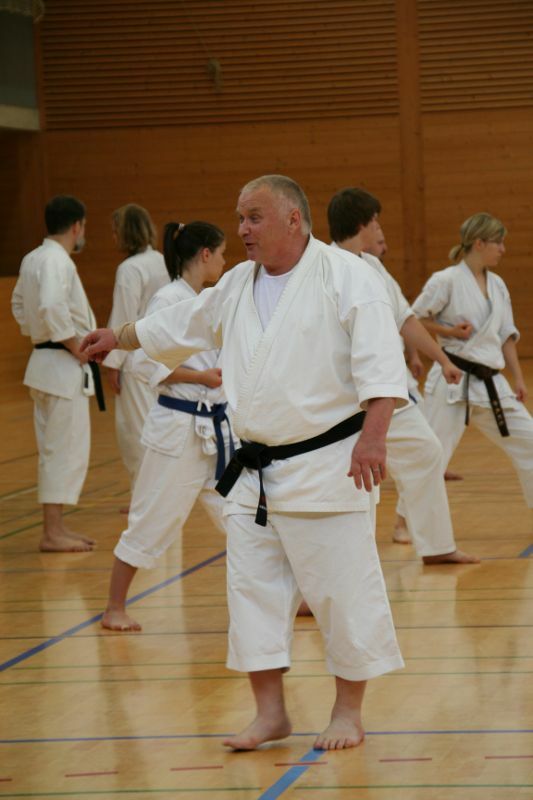 German instructor Mr. Otto who has been to Main Dojo in Taipei. and spread karate throughout Taiwan. and the Head of the Technical Office. The demonstration triggered great excitement from the participants. 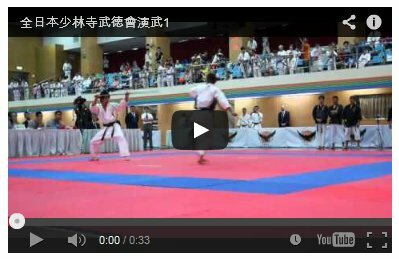 like punching, pushing and throwing that are all derived from 窶廳oma窶� technique of the White Crane Fist. The participants seemed to be both shocked and very intrigued by these techniques. they could block attacks or throw out the opponent with such ease. 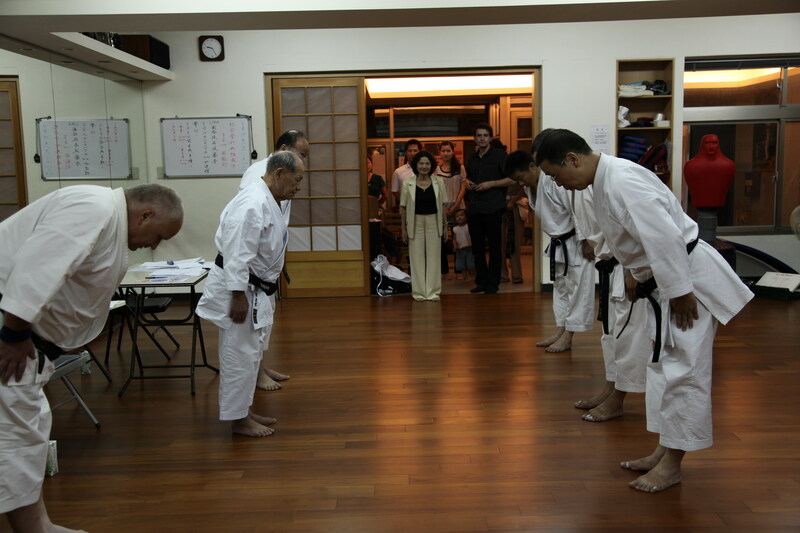 After the training, the participants solemnly paid their respect to the instructors. people taking photos or asking the masters for their autographs. were dubious about. 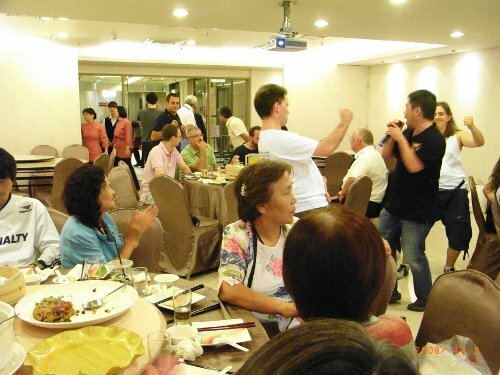 The dinner was buzzing with talks about Master Asai and the White Crane Fist. Many of them revered Maser Asai and Mr. Chen Hunt-tsung, whom they had never met, as the martial arts gods. 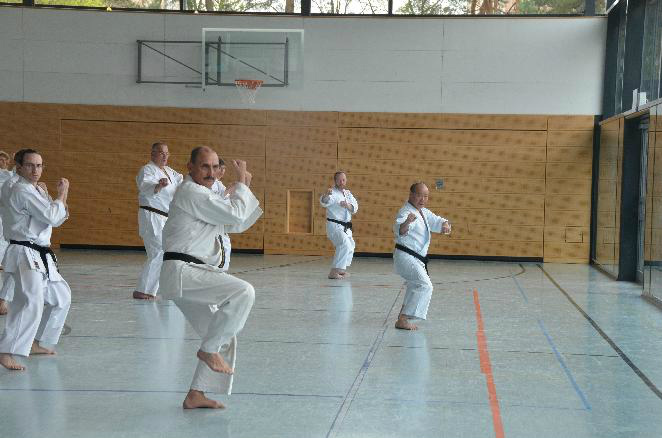 Mr. Otto and Mr. Gehard have wide networks and many karateka friends, and are passionately spreading karatedo in their regions. and is resolved to continue accurately practicing what he learned. He is also a gentle and kind instructor to his students. Mr. Otto窶冱 translation work and the fact that he has been teaching his students with great care played a big role. hope that our disciples and students of karate know that our training environment is supreme and that we are extremely lucky. 縲�縲�縲�縲�縲�縲�縲�縲�縲�縲�縲�縲�縲�縲�縲�縲�Lin maw tsun from Germany. On May 6th, the second day of the technical seminar in Germany, Mr. Lin sent us a report on the event. the banquet. Their movements were also better and smoother. and extract the 窶廚hi窶� from inner muscle, instead of simply using brute force. delighted to know that the hand rotating routine they did in warm-ups could turn into a powerful move. Especially those who were training in combat style were excited. After the training, all the students went to Head of Technical Office Mr. Chen and asked for his autograph, thanking him vigorously for his lessons. they must show respect for the great masters. The Main Dojo and the Japan headquarters will bear some of the tournament cost. Italy Country Head has been notified via email. Currently we are waiting for their progress report on the tournament preparation. Meeting minutes are posted on IJKA website, so the member countries should follow the updates this way. When members receive a certificate or any other type of documentation from the headquarters, they must notify the headquarters by signing the receipt and sending it back to headquarters. 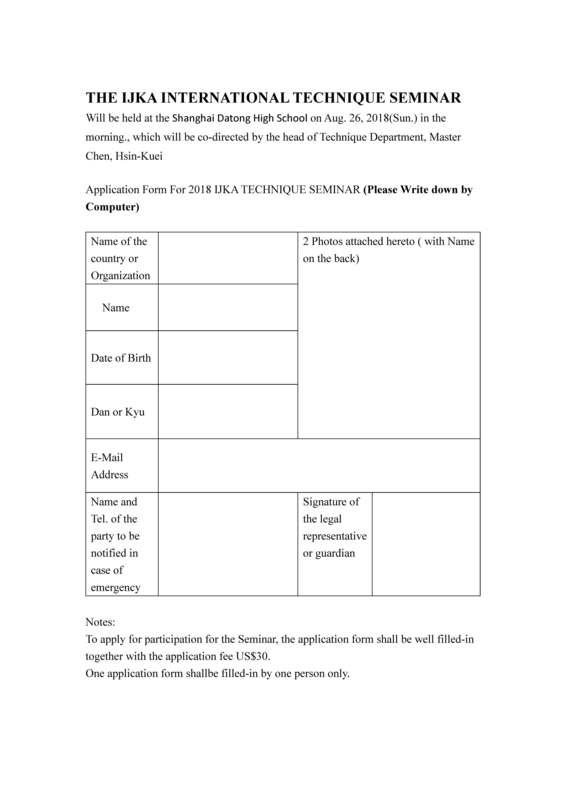 About verification of the qualifications and the background of those applying to become an IJKA member we will request them to send official certificates and other documents for Technical Office to evaluate. The membership will be issued once the office approves the application. Dan registration fees and other fee payments made to the headquarters must be in Japanese Yen. 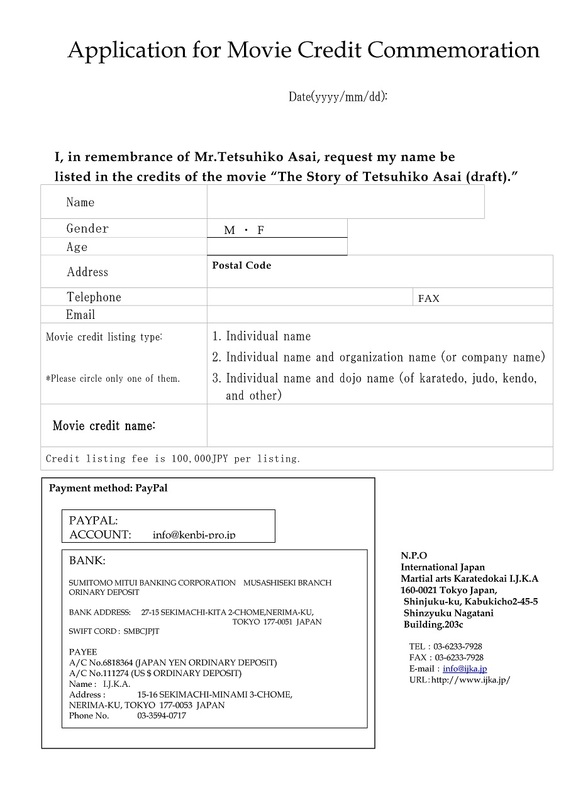 IJKA now has opened a Paypal account. Each member country should also open an account for the ease of payments. Issue an official letter of appointment for each position in the organization Under the logo, the document will be written in Japanese then English to follow. It will be crafted by Global section, and issued by the general headquarters in Japan. The term for each position will be two years with possible reappointments. Issue Karate Passport with membership cards. The fee will be 2500yen. 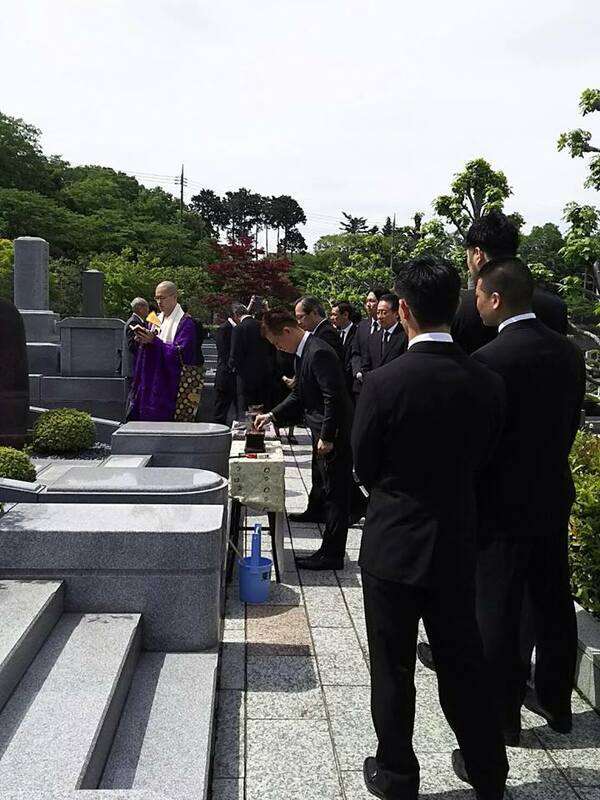 This is to carry out the wishes of the late Master Asai that he left with Mr Naito. 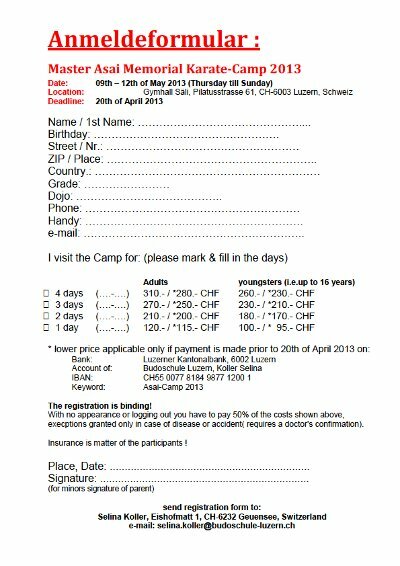 There are currently applications for the individual membership coming from England, Germany, India and other countries. 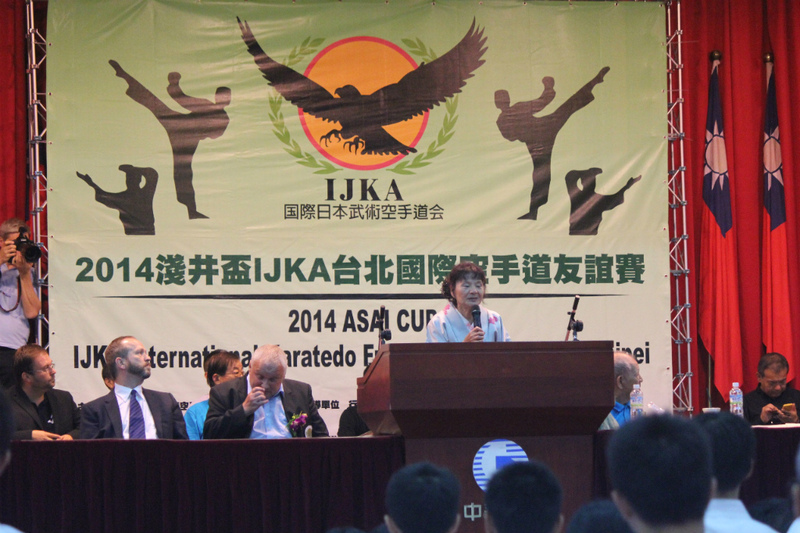 IJKA will help fund the World Cup Karate Tournament that will be hosted by IJKA Italy. The IJKA general headquarters and the main dojo will actively aid the event to lighten the economic burden of the host country. This will include the preparation, scheduling, financially aiding the food and accommodation costs, and co-hosting events such as workshops, dan examinations and demonstrations. 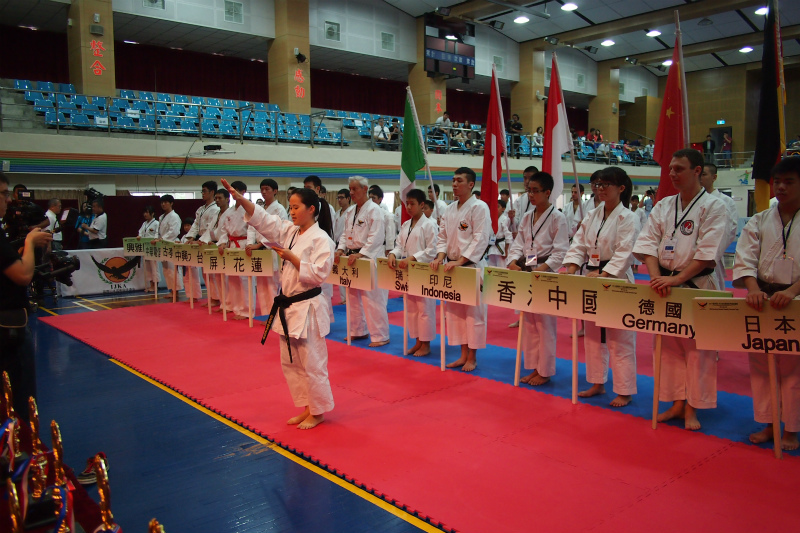 Make the timing of the international karate tournament flexible so as to allow each region host karate events more freely. Start holding global meetings through Skype. This will save the energy and the cost of the President commuting between Japan and Taiwan, and allow her to see the leaders of member countries that will be greatly helpful in having better line of communication and the opportunity to nurture rapport. 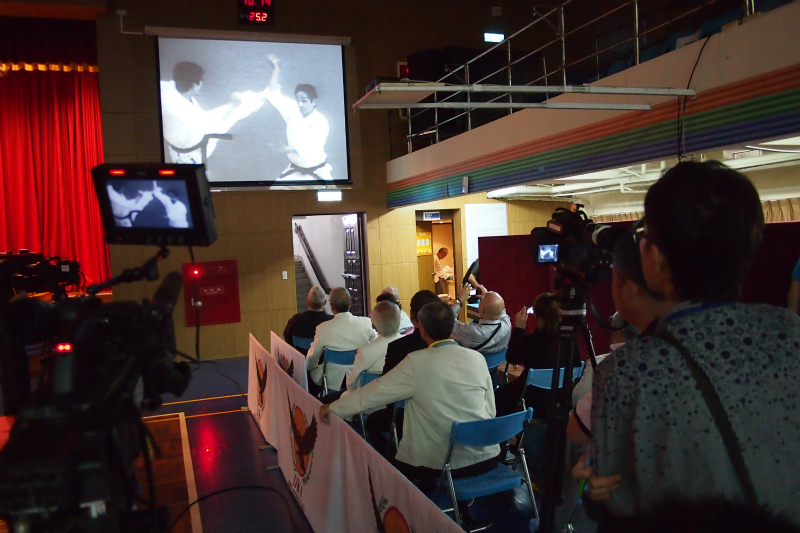 The main dojo is to take video footages of practice scenes and technical demonstrations, and make them accessible for the general public through social media such as Youtube. The President Keiko Asai will add a comment here, which could not fit into the meeting agenda due to a time constraint. 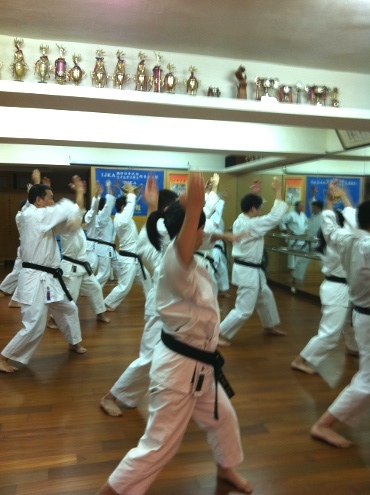 Karate Passport will be issued only one time, so the membership fee will be 2000yen from the second renewal. Replacement of a lost Karate Passport will cost 500 yen. Once you receive the certificate from headquarters, sign the receipt, and send the scanned image of the receipt back to headquarters. The membership fee must be wired to headquarters from the applicant's name, otherwise the head office will not be able to recognize whom the certificate is for. When transferring the membership fee, the name of the recipient must be IJKA, otherwise the office will not be able to retrieve the funds. 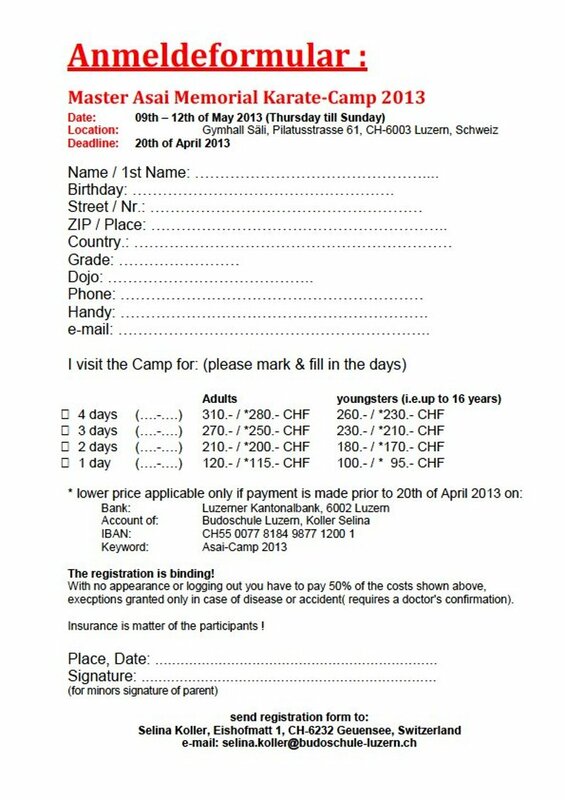 IJKA Karate Passport will be issued from the general headquarters along with the individual membership card. In doing so, we will increase the individual membership fee from �ｿ･2,000 to �ｿ･ 2,500 (what was originally �ｿ･3,000). The 2nd IJKA Karate Camp Italy was held in Lignano Sabbiadoro (Udine) from September 14th to 16th, hosted by Mr. Formenton Giuseppe. It was a smaller group this time, limited only to those with black or brown belt, at Mr. Formenton's request. 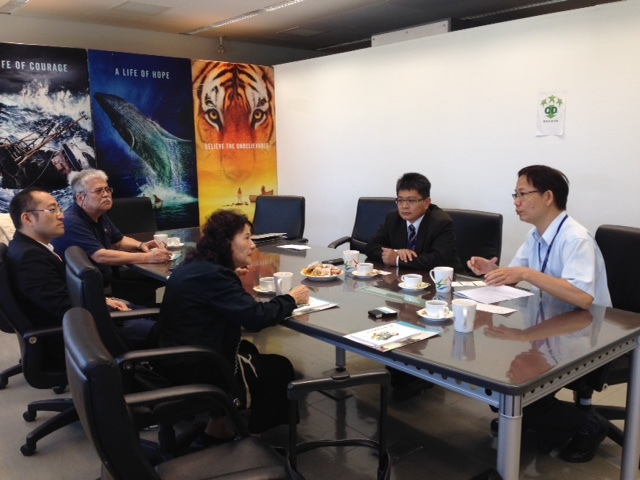 Technical Office (Taiwan) holds administrational joint meetings to discuss public matters. Here is the report from the latest meeting. the general headquarters in Japan asks the regional headquarters to provide information about the applicant. 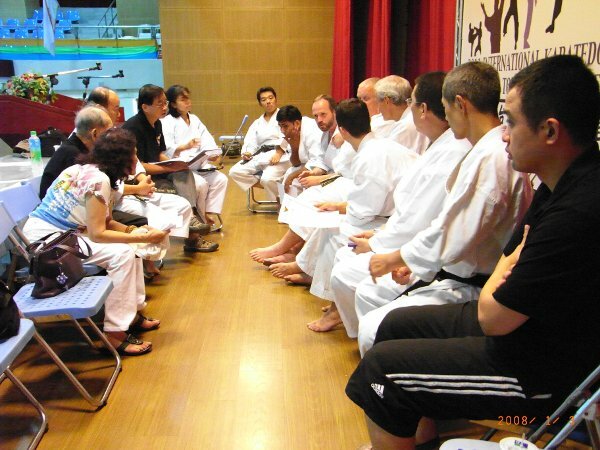 branch dojos in their home countries and in neighboring countries, and their role is that of a facilitator, and does not symbolize authority. The Technical Office will lay out more detailed policies in addition to the policies on dan evaluation and admission process that are already posted on the IJKA website. 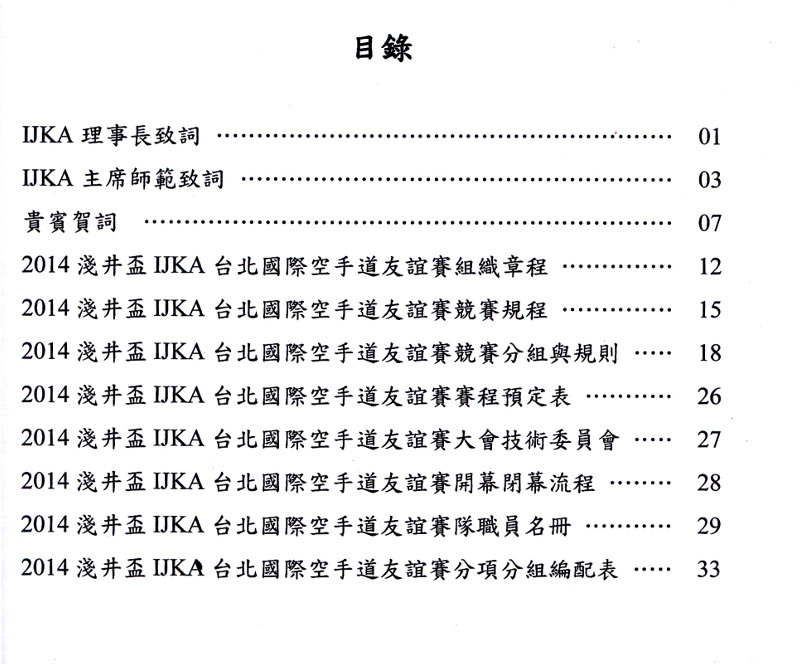 Make sure the Chinese language used on IJKA certificates and organizational names translated from English are consistent. Head of Technical Office is to obtain an approval from the President for new documents and translations. 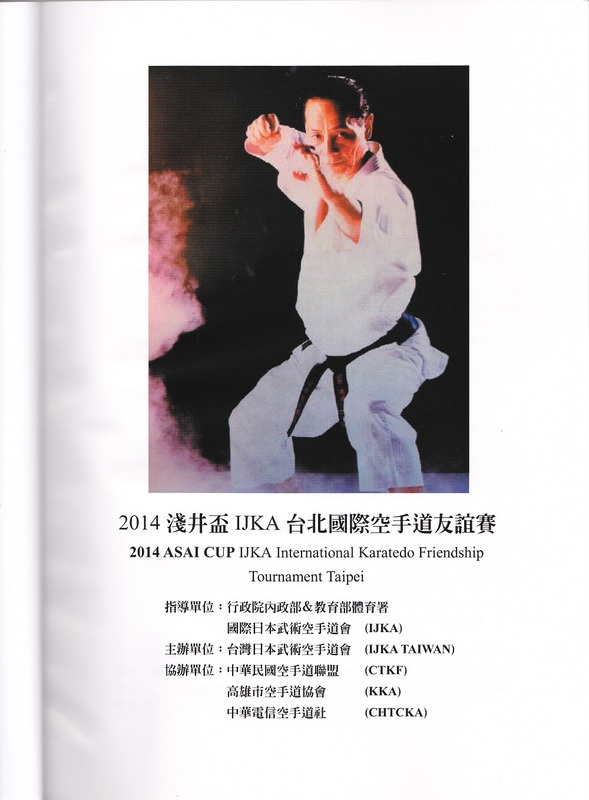 IJKA will issue a Karate Passport to follow the wish of the late Master Asai. 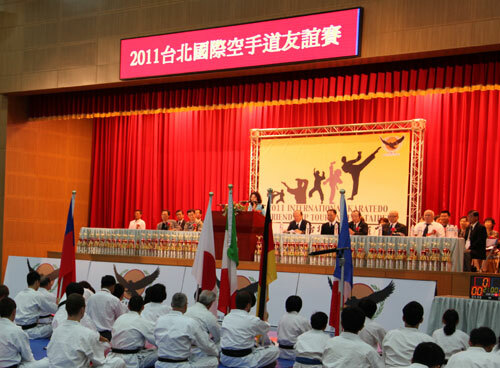 Members from Taiwan will join the International Karatedo Friendship Tournament in Italy scheduled in 2013. 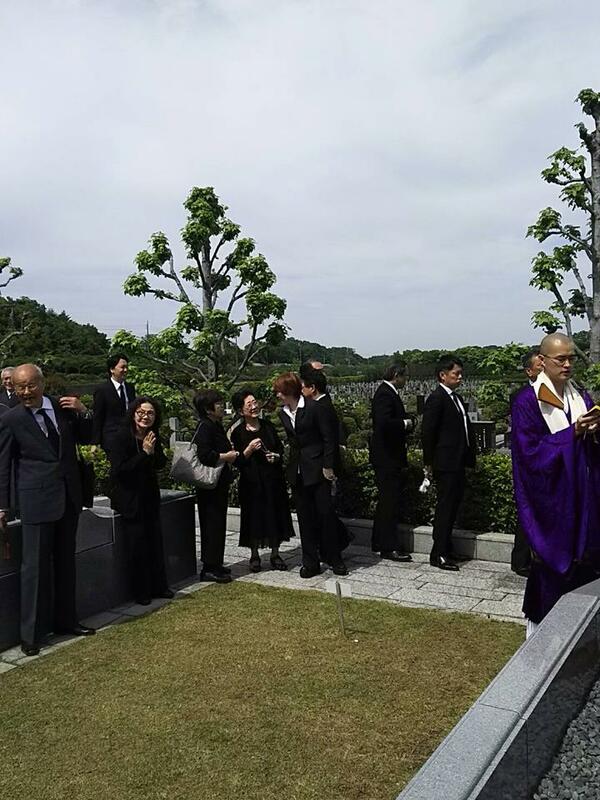 Late Master Asai Memorial Concert 窶廡lower Banquet窶� In commemoration of the late master Asai窶冱 7th anniversary of his passing, we held a flower qigong concert, 窶廡lower Banquet,窶� at Kanack Hall in Higashi Kanagawa station in Yokohama City. 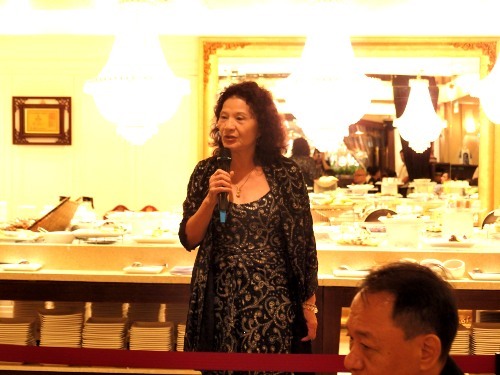 The event was hosted by International Qigong Kenbiso and Kenbi Production, both headed by Mrs. Asai. 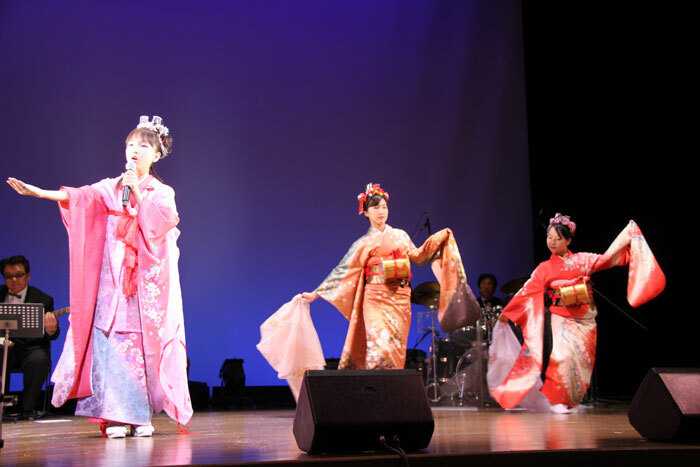 It was co-hosted by Gekkan Music Star and NPO group Japan Children窶冱 Song, Dance and Theatre. The morning and evening programs were both a great success. 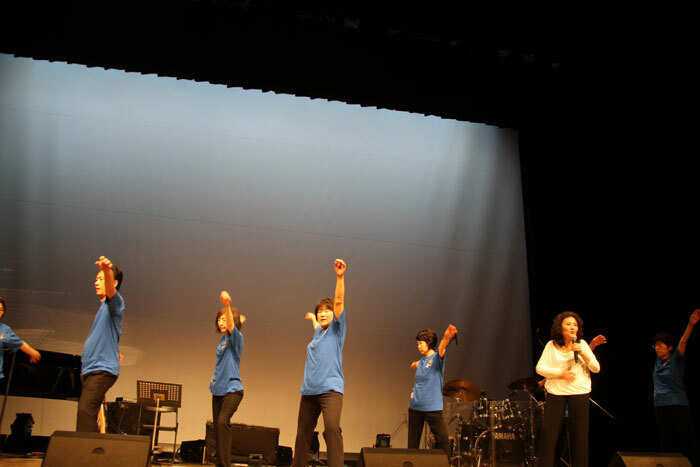 The compilation of Qigong, the flower qigong, which was performed for the first time in Japan, received positive feedback due to Mrs. Asai窶冱 passionate lecture, despite initial audience confusion about the unfamiliar concept. Needless to say, songs by Japan Classical Songs and the nationally famous Duke Aces had a great response. 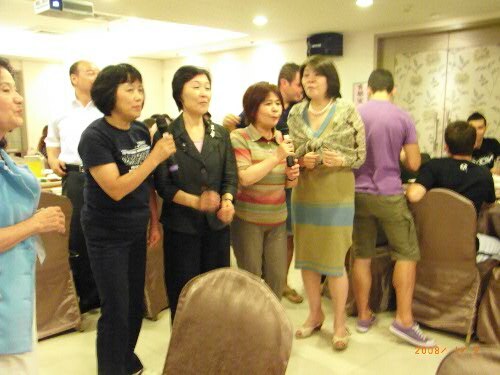 Mrs. Keiko Asai teaching qigong breathing method, concentrating qi in 窶彭antian窶� wishing for people窶冱 good health. There are 7 dantians in the human body, and the one that is found under the stomach, the 窶徑ower dantian,窶� is said to be 窶徼anpo窶� (the treasure part of dantian). The location also corresponds to male and female reproductive organs and it is sometimes called 窶徠ikai (sea of qi)窶� as it collects life energy, or 窶徭eiden (field of sexual energy)窶� as it concentrates sexual energy. Focusing on the area during exercise helps concentration, relieves stress and helps prevent dementia, as it relaxes the cerebrum. It is also said that it can help stabilize breathing, enhance kidney functions and therefore help prevent incontinence, and help with re-energization. 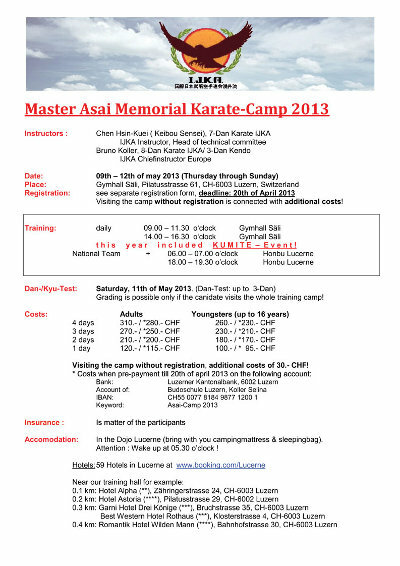 Mr Bruno plan to hold a meeting after Master Asai Memorial Karate-camp 2012 for international KARATE Tournament in Italy 2013. 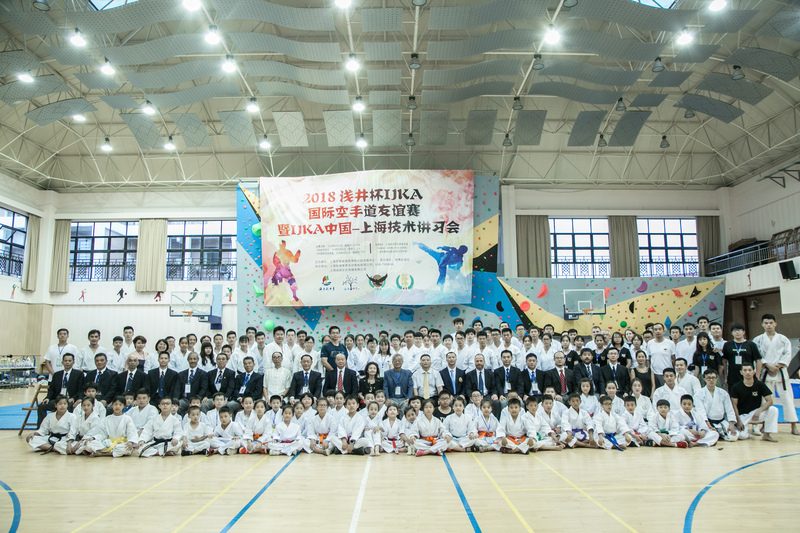 繝ｻ For the International Karatedo Friendship Tournament that will be held in Italy in 2013, IJKA will have an invitational tournament towards the end of the year for the Taiwan team. The preparatory committee for the tournaments will be formed in March to further discuss the details. 繝ｻ IJKA members with a titled role and is announced as such on the IJKA website will be presented with a formal appointment letter from the general headquarters, both in Japanese and English. 繝ｻ IJKA member countries that wish to invite an instructor from the technical office must submit a request form to the general headquarters. 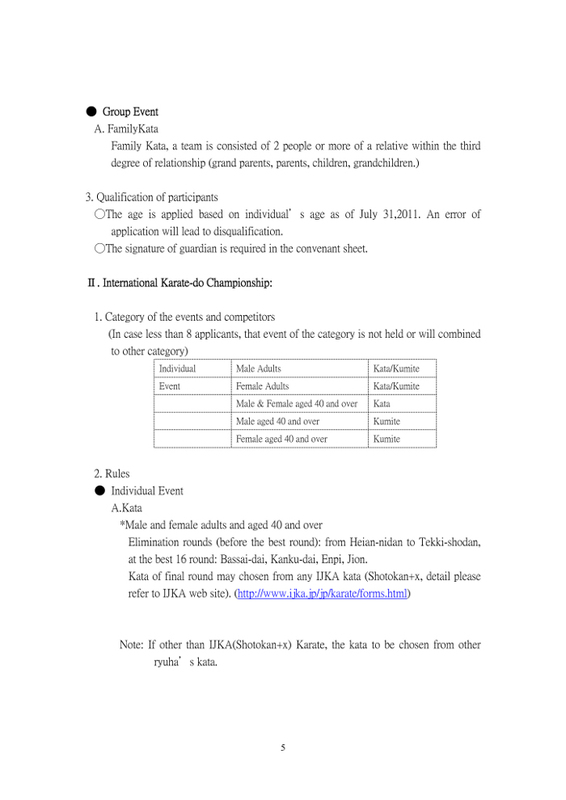 (The request form is posted on IJKA website.) Once the request is approved, an instructor of any origin and an instructor of European origin will be sent to the requesting country. Including members in Asia. 繝ｻ When a member dojo/country hosts a training workshop, and other events, the member is to promptly report to the general headquarters before and after with some details and digital images. The report and the pictures are to be posted on IJKA website. 繝ｻ Member countries are to communicate frequently and strive to support each other. 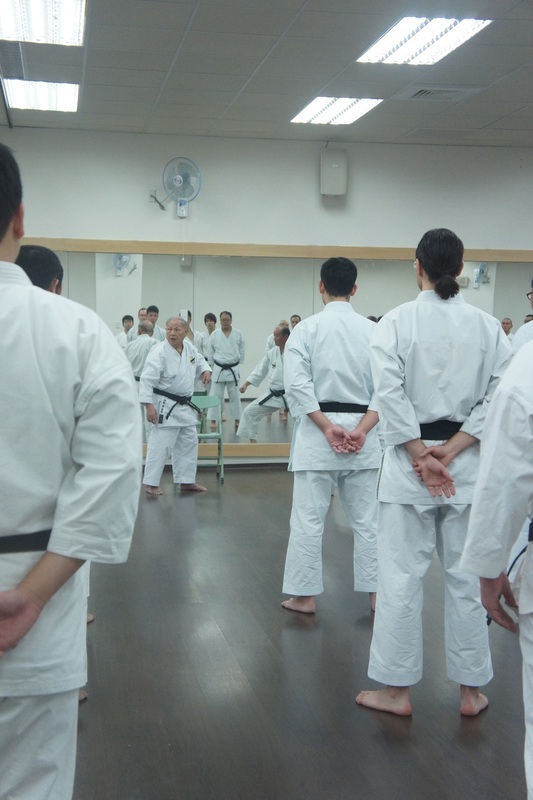 繝ｻ In view of the current world recession, and that IJKA is a non profit organization that wishes to make it easier for those who love karate to join us, we have adjusted the brunch anuary membership fee from \15,000 yen to 10,000 yen. The change is announced on the website. 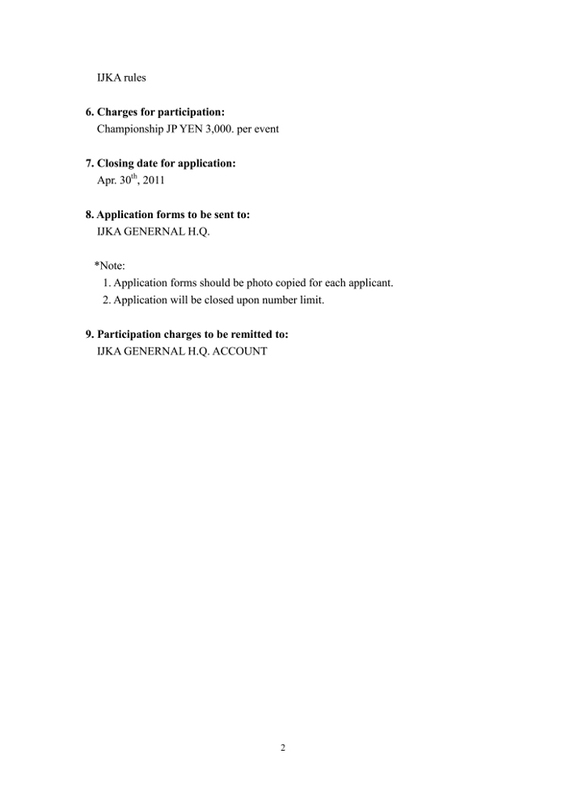 繝ｻ The post for the 窶廩ead of International Affairs窶� will be formed within the IJKA Administrational Office. 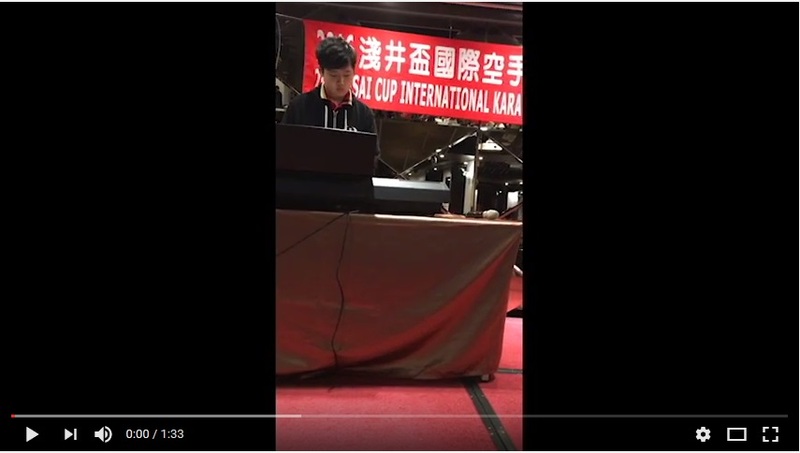 繝ｻ When a new topic article is posted on the IJKA website, members of Taiwan Main Dojo, the Tetsuhiko Kan, is to translate the English version of the article into Chinese. 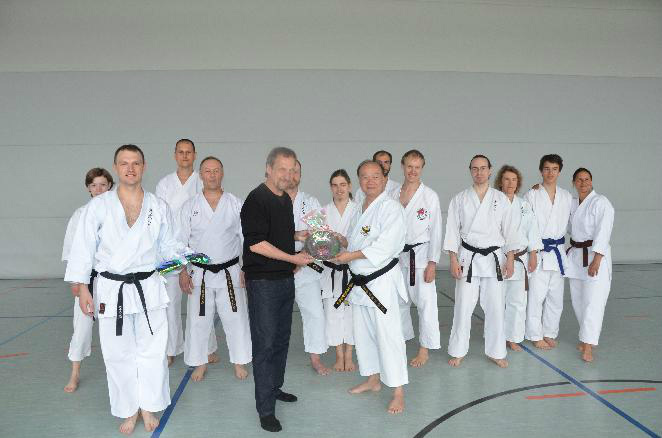 The European Main Dojo celebrated its grand opening early this year on January 21st. Mr. Koller reported the exciting event: It was a memorable day for us and all the people who participated in the event - I am so happy to report that we had such a wonderful event. 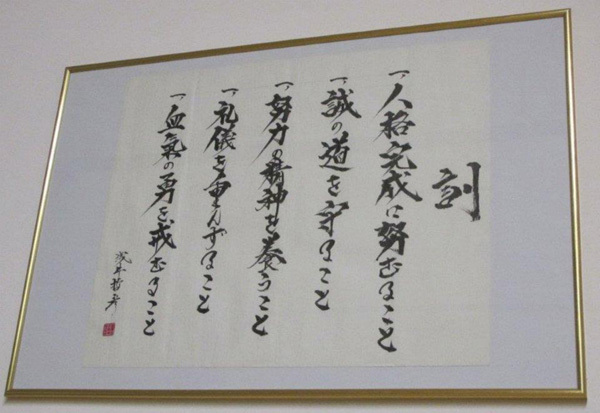 A Dojo-kun hand-written by late Master Asai was presented to the dojo by the president of IJKA, to celebrate the opening of its European main dojo. 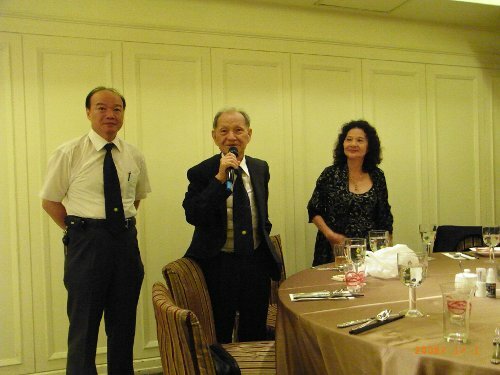 Dan certification for Mr. Koller, who passed the 8-dan examination in Taiwan on August 7th, 2011. 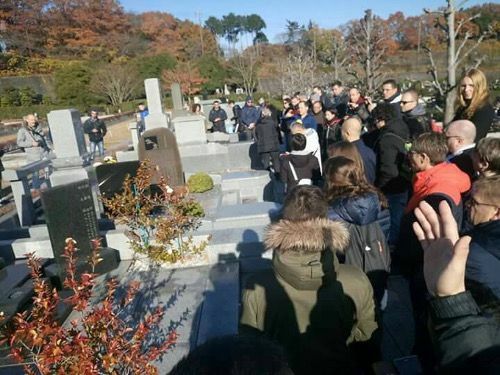 The technical seminar held in Lignano Sabiadoro, Italy from November 24th to 27th last year drew over three hundred people, where people trained passionately under Mr. Chen Tsin-koei, the head of Technical Office of IJKA, who attended the event from the Taiwan Main Dojo. 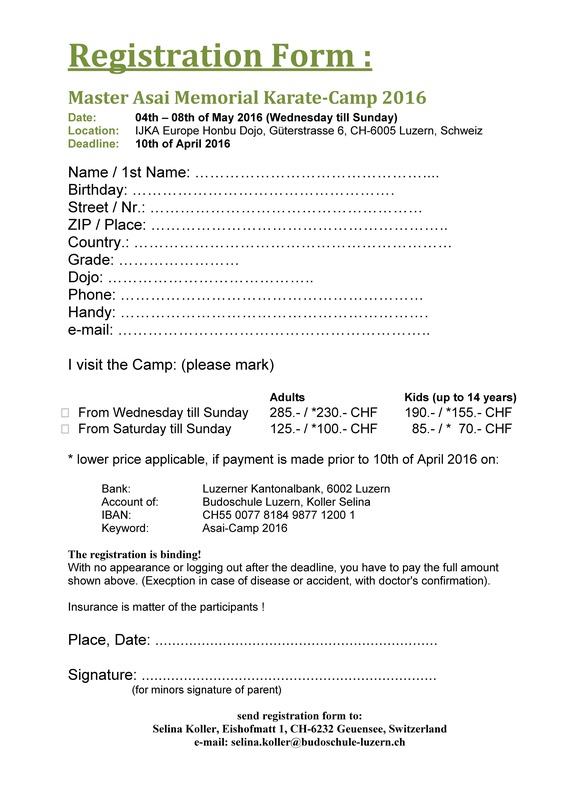 International Japan Martial Arts Karatedokai (IJKA) Italy Dojo hosts a karate camp from November 24th to 27th at LIGNANO SABIADORO in Italy. The branch manager Mr. FORMENTON GIUSEPPE won the championship at the IJKA International Karatedo Friendship Tournament that took place in Taipei August 6th of this year. On August 7th, he was nominated at the IJKA international administration meeting for the IJKA technical office global instructor by the group's president, Keiko Asai, and received unanimous approval. 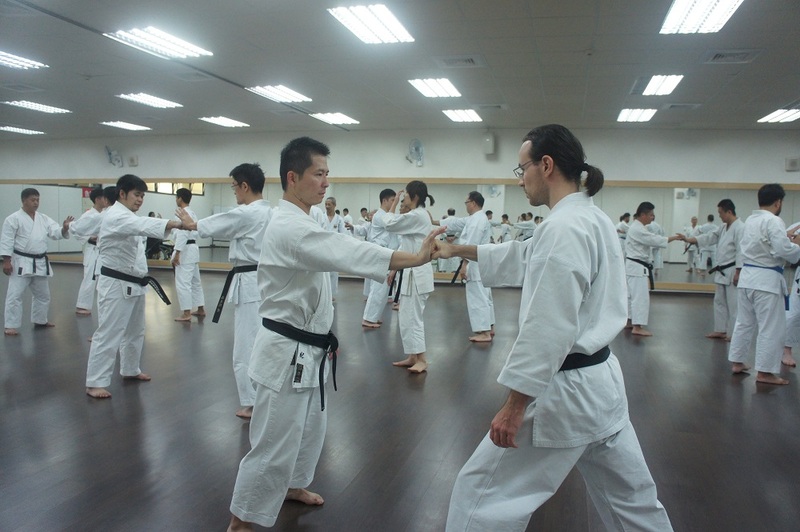 The head of the technical office, Chen Hsin-koei, will be sent to the dojo from the main technical office to train the new global instructor. 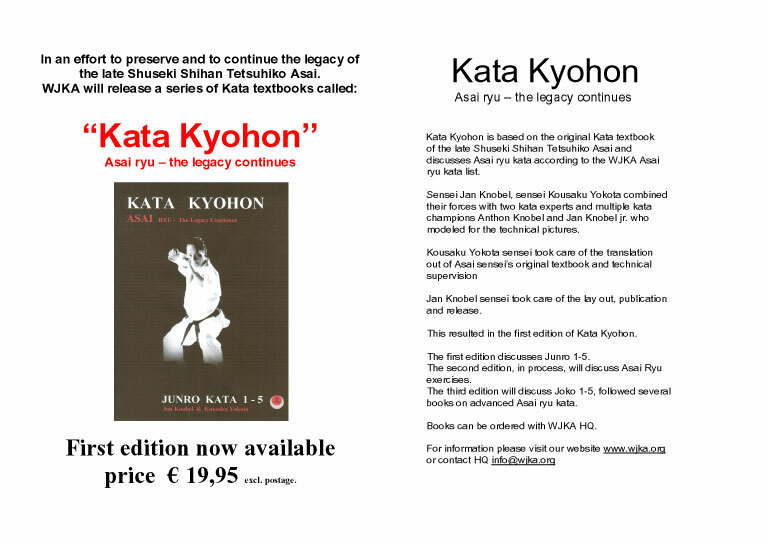 The statement by the legal successor of Master Asai as to the "Kata Kyuhon"
we are very pleased to learn that the students and disciples of late Master Asai are popularizing the "New Karate", which is created & developed by Master Asai with his whole life in the world. None of them send any notice and tried to obtain the consent from me prior to the publication. This has constituted the disrespect to Master Asai. As known on the world, Karate is not just concerned about the physical techniques,the promotion of the inside sprit is rather more important. Above all, etiquette and respect are the most important lessons of karate, and the fifth DOJOKUN of KARATE is saying "respect others". That is common knowledge in the karate world. 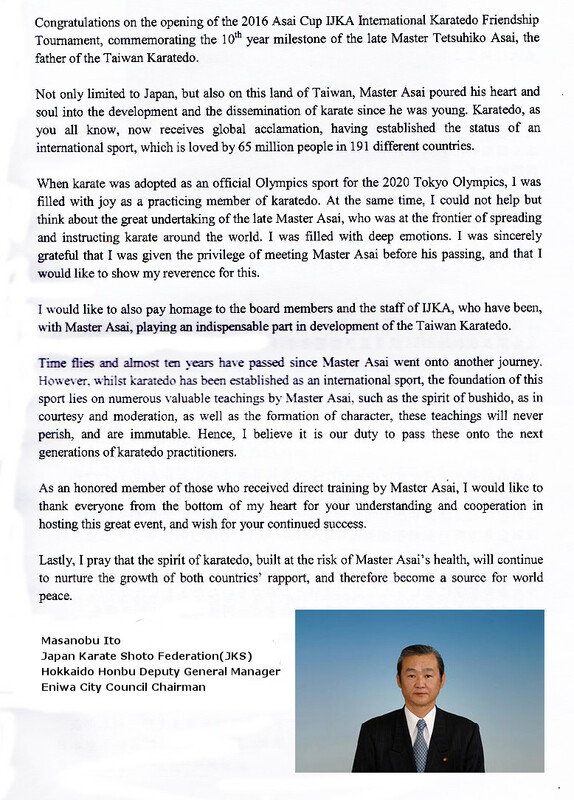 We do love to see more and more people learning Mastar Asai's karate and feel honoured that people are interested, but we would also like to see anyone who wishes to publish Master Asai's karate and portrait, please send a formal notice and request to me Keiko Asai. Your sincerity would be returned by a gift of Mastar Asai's memento and certificate of acknowledgement, as a token of good faith and gratitude. A public announcement and words of encouragement will also be posted on I.J.K.A's website. 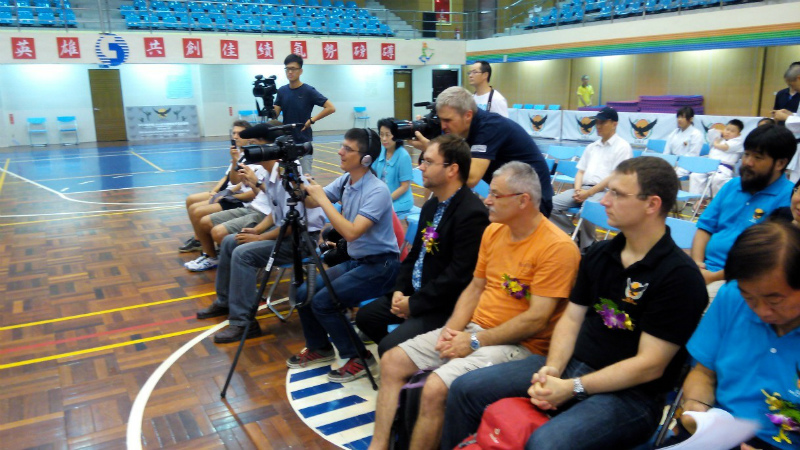 The judges for the tests were: Head of the Technical Office Chen Hsin-koei, Mr. Bruno Koller, and Mr. Toshiyuki Kidokoro. assisted the event with starting commands and administrational paperwork. 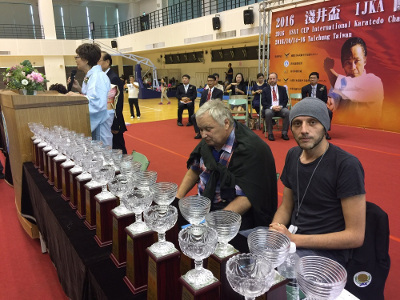 From 4dan, Chief Instructor Chen Hunt-tsung joined the judges despite his illness. Staff from the Japanese administrational office also joins in on the world famous song "Sukiyaki." And the party continued into the night窶ｦevading the painful goodbyes. 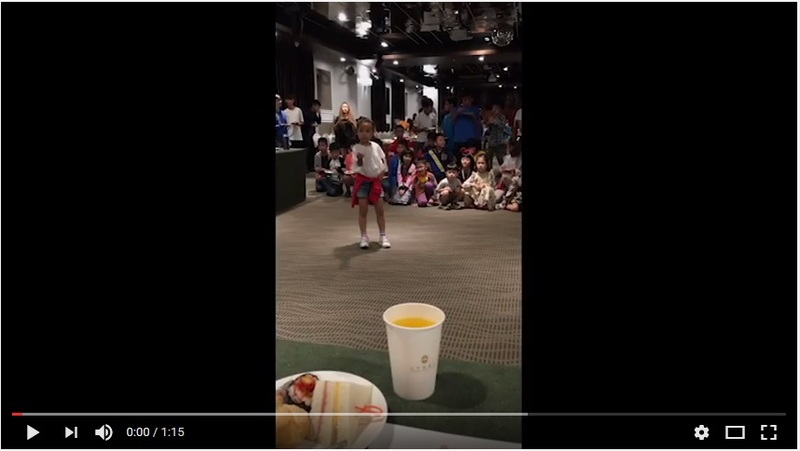 Demonstration from 縲�驗ｭ譛昜ｿ雁�育函縲�髯ｳ譚ｱ辣ｧ蜈育函縲∝ｱ�蜷磯％縲�蜻牙▼譁�蜈育函縲’or Iaigiri-do縲�邇区ｭｦ髮�蜈育函縲｛r Aiki-do brought an additional excitement to the tournament, and the event closed with a huge success. 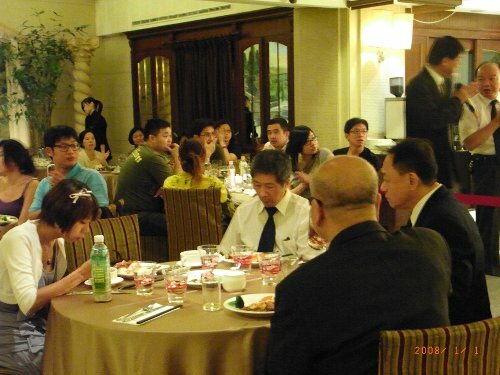 Welcome party hosted by Mr. Tsai Eng-Meng, the Chairman and CEO of Want Want China Holdings. countries joined and had a chance to meet other members. The evening soon became a great success with everyone having a great time. They stayed at San Want Hotel from August 5th for 5 days. During that time, they were constantly impressed by the service the hotel provided that we don't normally see in Japan. Everyone was excited and could not stop complimenting: "Their breakfast is just perfect!" "Love the daily delivery of fresh fruits!" "The apples taste sweeter.
" "Look at the art collections in the hotel!" "Look at the gorgeous chandelier!!" "I am addicted to the complimentary coffee and Want Want snacks given out at the lobby!"窶ｦetc. Their praise continued in Japan telling each other they must go back. 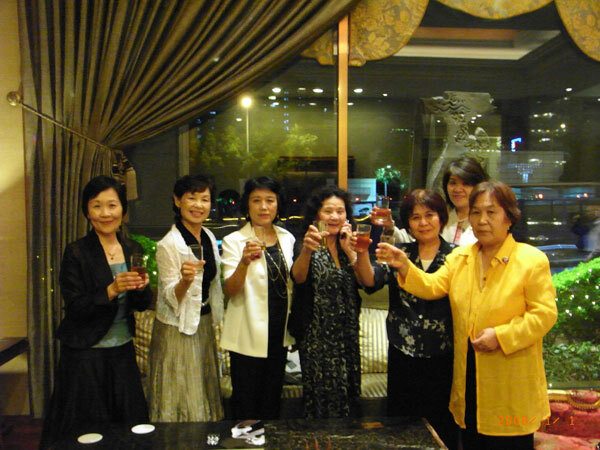 Mrs. Kinase told her friends about the hotel, and apparently they are actually planning on another trip! Want Want. Everyone had a great time at the big and elaborate party. With the permission from the Taiwanese government, IJKA-Taiwan was formed at an organization meeting in Taipei at 闊井ｺ懷嵜荳ｭ with Mr.譫鈴鞄豁｣ leading the meeting. 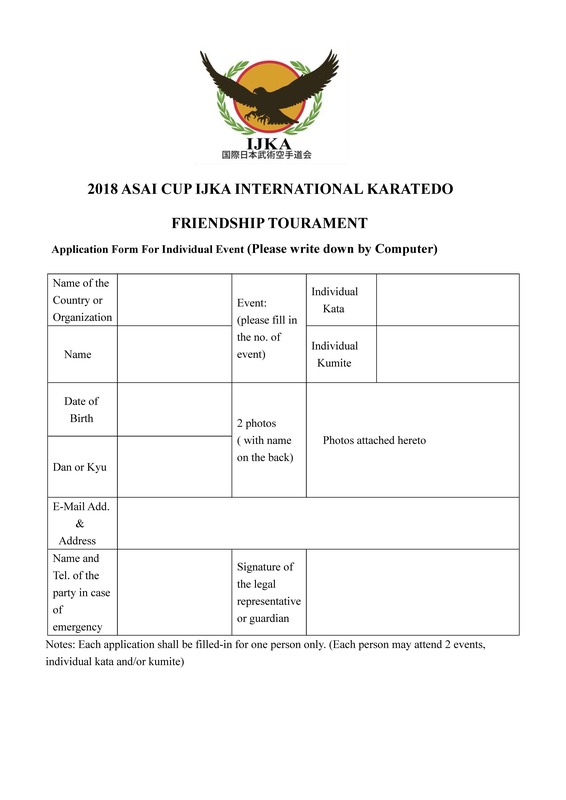 For those who are interested in participating in the International Karate Friendship Tournament, please fill in the registration form (Download) and send it to us via email. 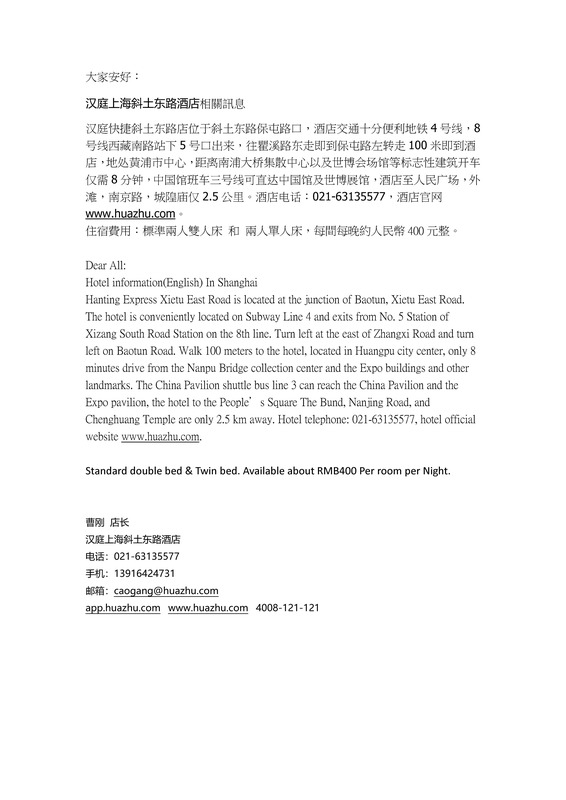 We will arrange your stay including airport shuttles and hotel accommodations based on the information. In order for people to obtain a higher rank, IJKA has currently advised its members to refer to our website on the exam details as to what each rank entails, and encouraged them to practice according to the criteria. This is all on the website. Any opinions? If the technical performance at the exam is deemed appropriate for the aimed rank by the technical judges, including Chief Instructor, then that is what counts. In accordance with Master Asai窶冱 system, people with enough practice years can try out for two ranks at the same time. Any opinions? 1. It should only be limited to those who have practiced hard during the practice years. 2. It should only be limited to those who continuously practiced during the entire duration of the practice years without break. 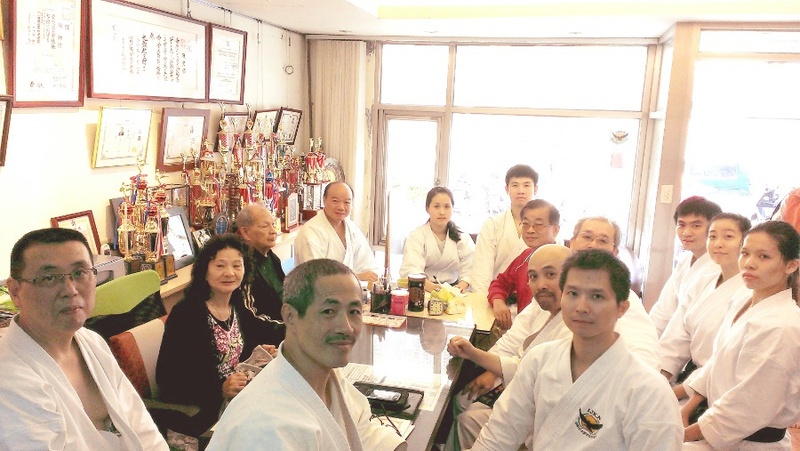 In order to realize the principle of Master Asai: 窶廢veryone窶冱 Karate窶� and 窶廢veryone窶冱 IJKA,窶� IJKA has been accepting various people with long karate background and who have been devoted in mastering karate. 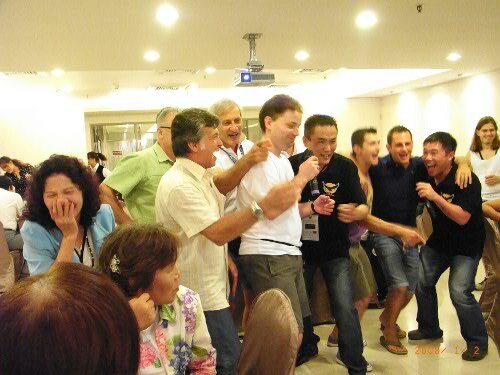 As an example, the karate techniques of a particular person from Italy who participated the memorial camp in Switzerland held last year were shown to be excellent, and was also recognized by Assistant Chief Instructor Chen Hsin-koei and we will endorse him as a new member of the Instructor committee, when he comes to participate in the Friendship Tournament in August. There is also another person from Russia, who I will introduce to you all and recommend him as a new instructor. 繝ｻ All logistic teams will be fully engaged in the preparation from April. 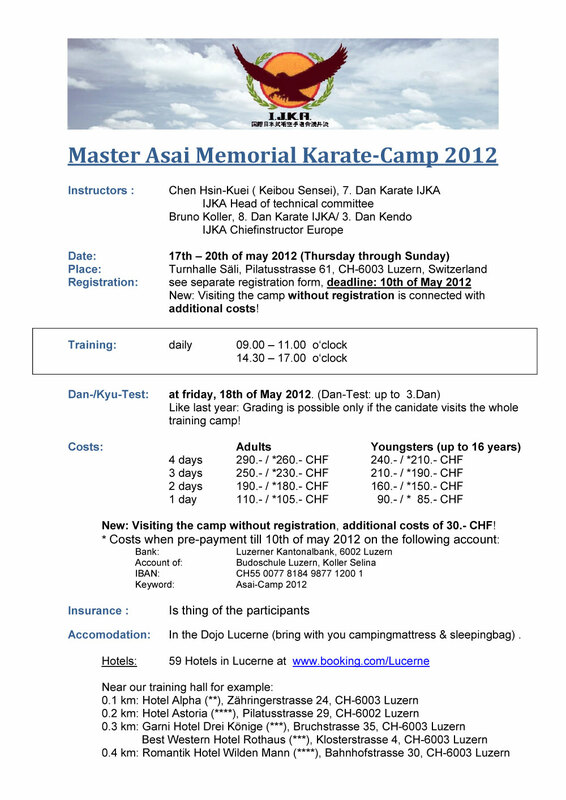 Asai Memorial Karate-Camp in Switzerland. 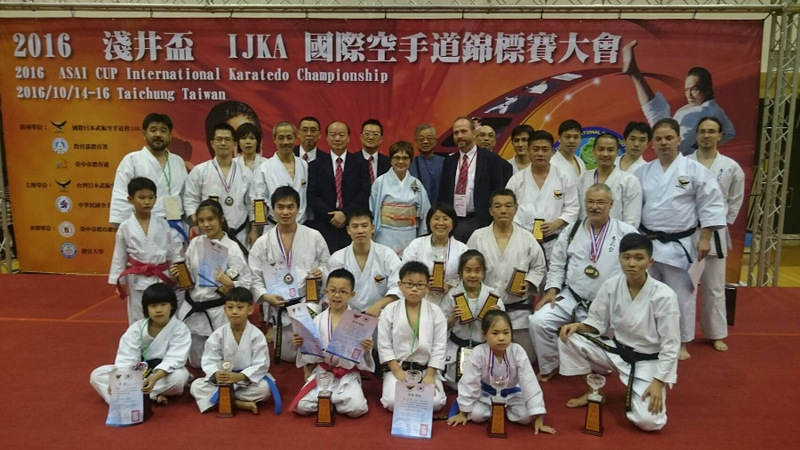 A dan promotion examination is to take place on August 7th in Taipei, Taiwan, one day after the IJKA International Friendship Tournament. For those who are interested in taking the exam, please check the dan criteria posted on our website. There is more chance of passing the test if you start practicing now. 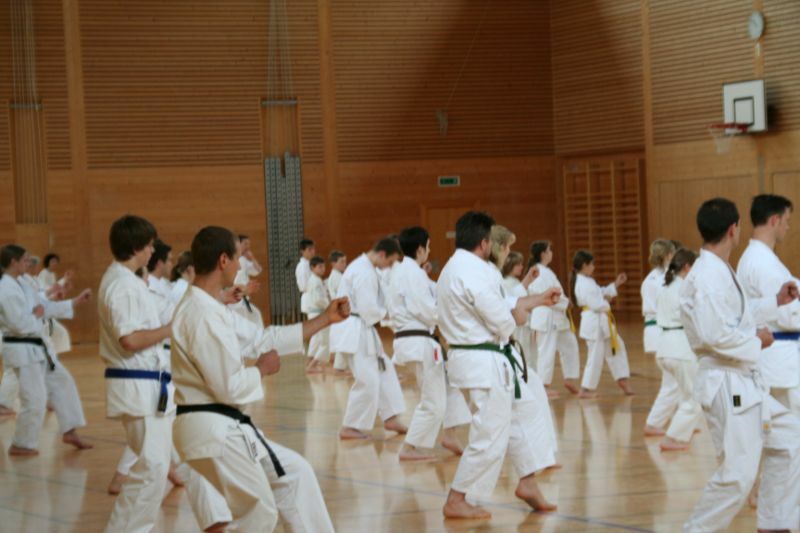 Also, in accordance with Master Asai's system, if you have enough years of karate experience you are able to take exams for two levels at one go, so we advise you to practice for the next two levels. For example, if you have 2dan and have been practicing for 6-7 years without taking a dan exam, and if you pass 3dan test at the August 7th dan promotion exam you are qualified to take the test for 4dan there as well. We are planning to hold the INTERNATIONAL MARTIAL ARTS FRINDSHIP KARATE TOURNAMENT on August 6th this year, in Taipei, Taiwan. The government of Taiwan is also supporting this event. Following the late Master Asai's principle that "people who love karate should respect and learn from each other regardless of nationality, style or organization they belong," we welcome people who are from many different organizations and practicing different styles of karate. 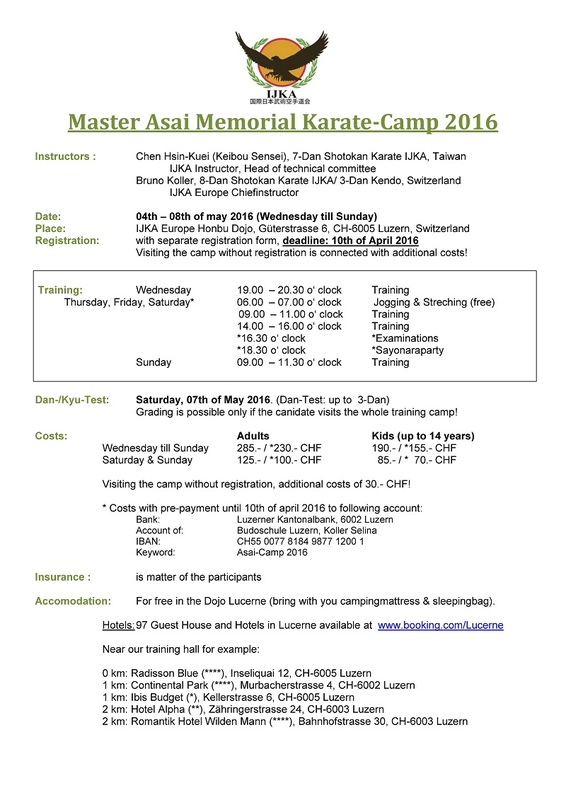 If you have practiced karate with Master Asai before, and are now in a different organization or your own organization, we welcome your participation in our tournament and to commemorate the late Master Asai. "Friendly organizations and individuals," and return it via email. Tournament Venue�ｼ咾hunghwa Telecom Co.,Ltd. 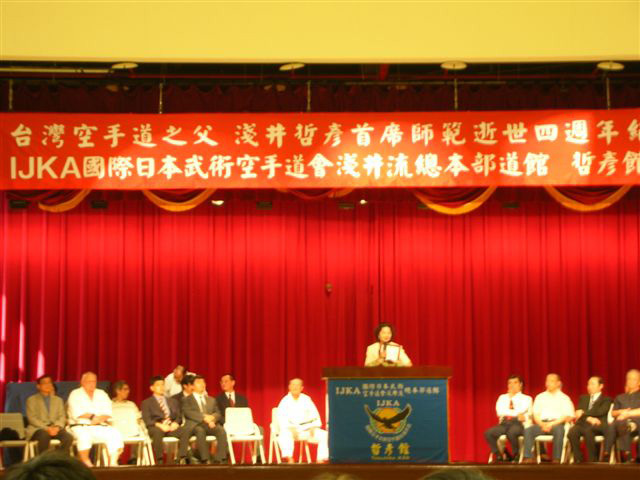 Zhong Zheng Hall Gymnasium, No.42, Sec.1, Jen-Ai Rd. 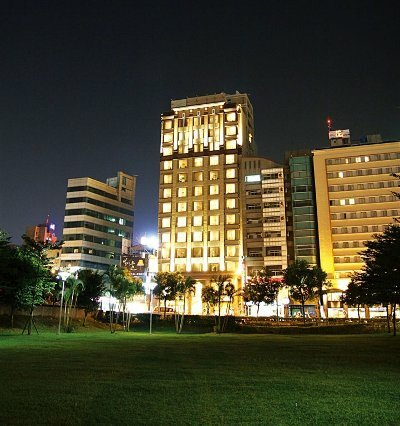 Taipei, Taiwan, R.O.C. 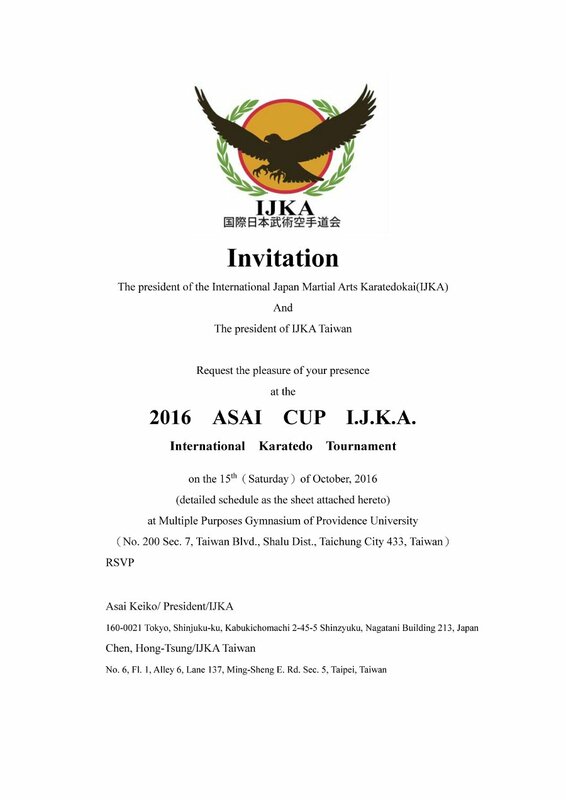 Tournament Objective�ｼ啜o strengthen the relationship with the participants and to become united in spreading Asai Karate. - The first round of applications will be closed at the end of January, and number of participants determined. - There will be a second round of applications that will be due the end of February. \5,000-~\7,000,for one night for Hotel Fee. 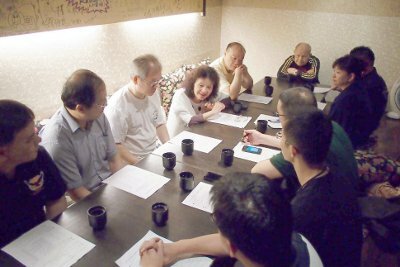 - For the next preparatory committee meeting and any other meeting to be held in the future, the style of a "network meeting" is more desirable (President Mrs. Asai) to allow other country members to participate, to carry on Master Asai's vision of "everyone's karate." *Target participants: Regardless of which organization people are from, welcome anyone who learned karate from Master Asai or support Master Asai's karate. *Encourage exchange between different types or martial arts such as Kendo, Iaido, Jodo, Shaolin Kung Fu, etc, at the tournament. * Filming should be strictly prohibited without permission. * Issue certifications upon completion of the seminar. *It was agreed to set up the "Instructor Seminar System" from 2011 to develop instructors in each member country. People with certifications of 2-dan or higher with IJKA can apply to participate in the training. 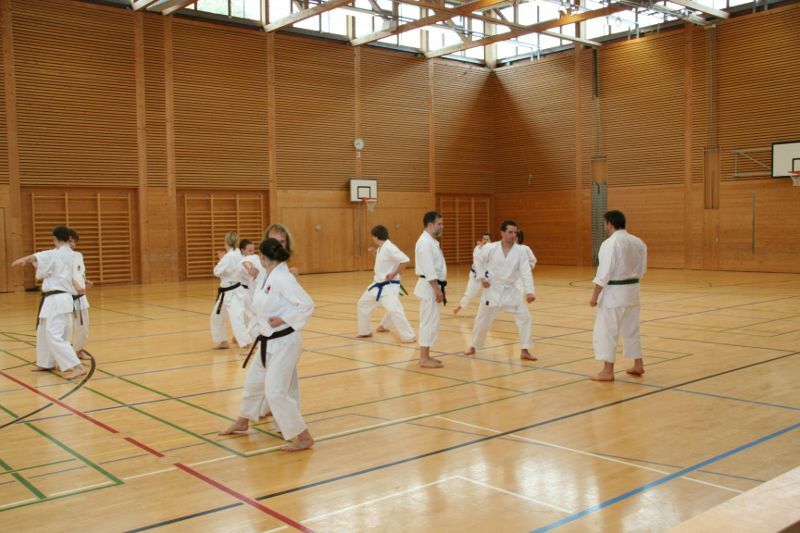 *During the preparation period of the 2011 Friendship tournament, IJKA will make the utmost effort to communicate the objectives of IJKA and continue to work in unison with karate enthusiasts to carry on Asai Karate. *IJKA is a non-profit organization. 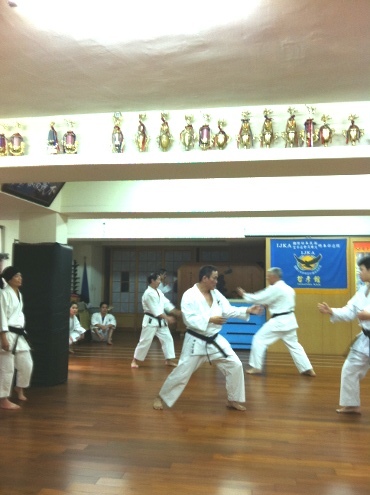 Master Asai did not certify any of his students in any country as a Shuseki縲�instructor . 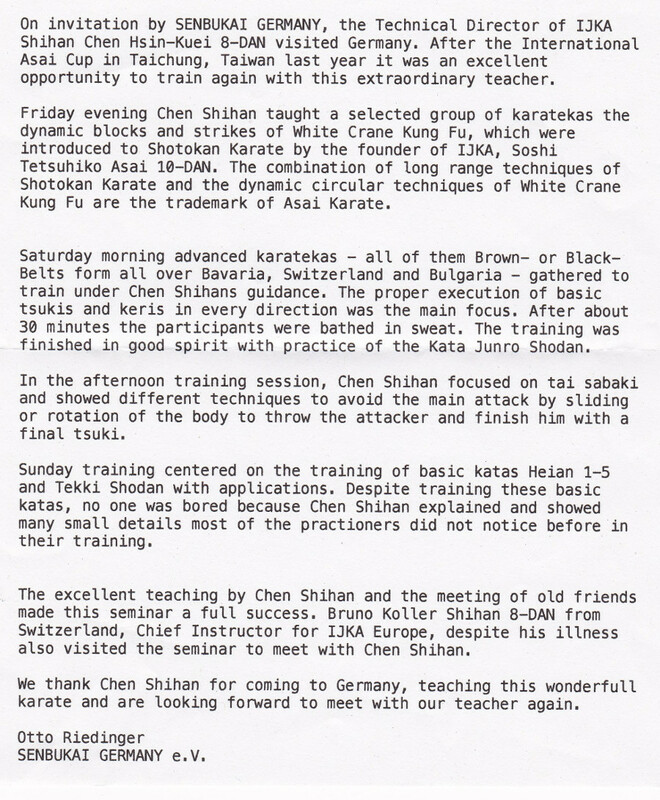 Master Asai was never a Shuseki sihan for any karate organization outside of Japan other than IJKA. 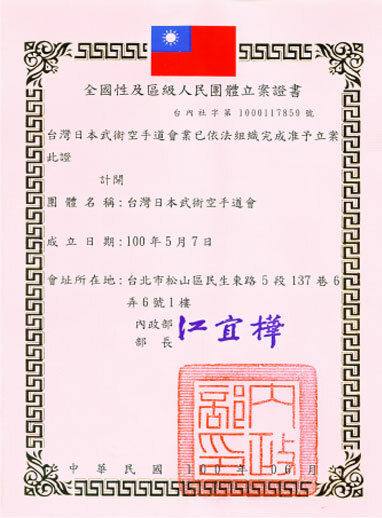 Using Master Asai窶冱 name and forging his seal and certification is strictly prohibited. 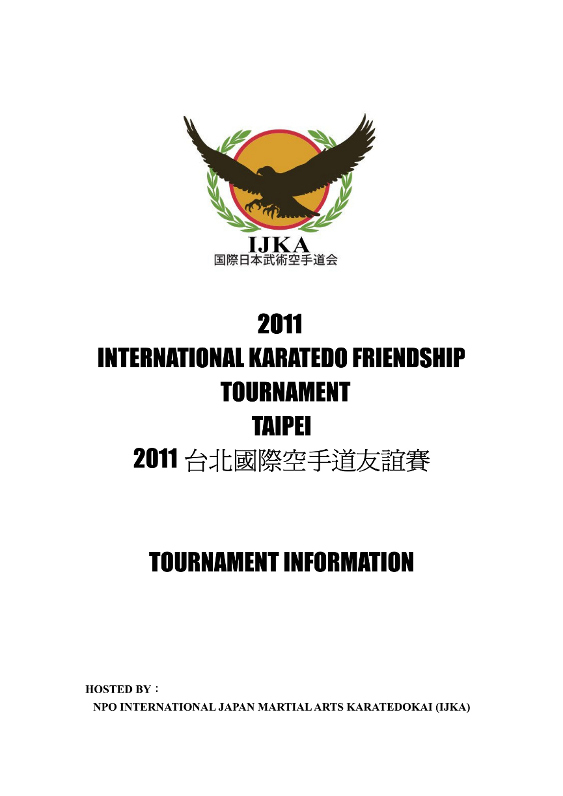 1) We will hold an IJKA縲�General 窶亙ntanational Friendship karatedo Tournament窶� on August 6th, 2011 in Taipei, Taiwan. 2) We will hold another dan promotion examination a date close to the tournament. More details to come on the website, so please stay posted. 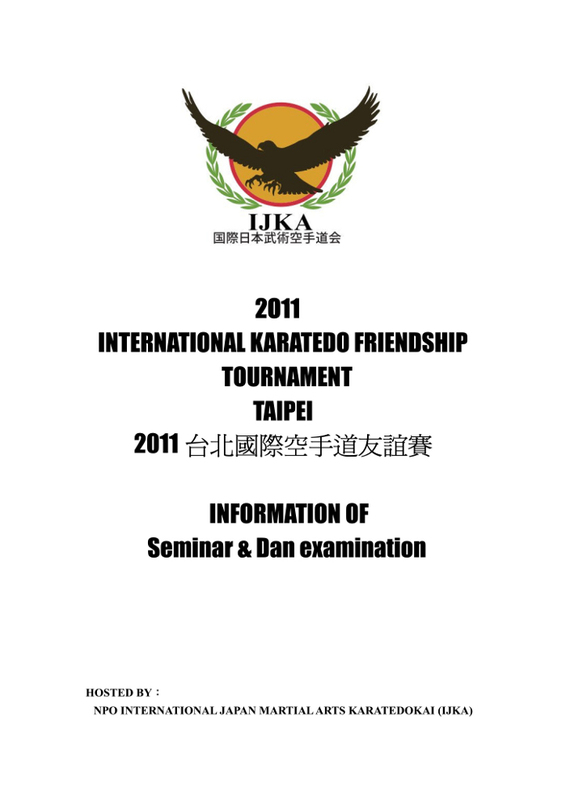 3) IJKA General Friendship Tournament and the dan promotion exam will be annual events, and the host country for the year 2012 will be decided after the 2011 tournament. 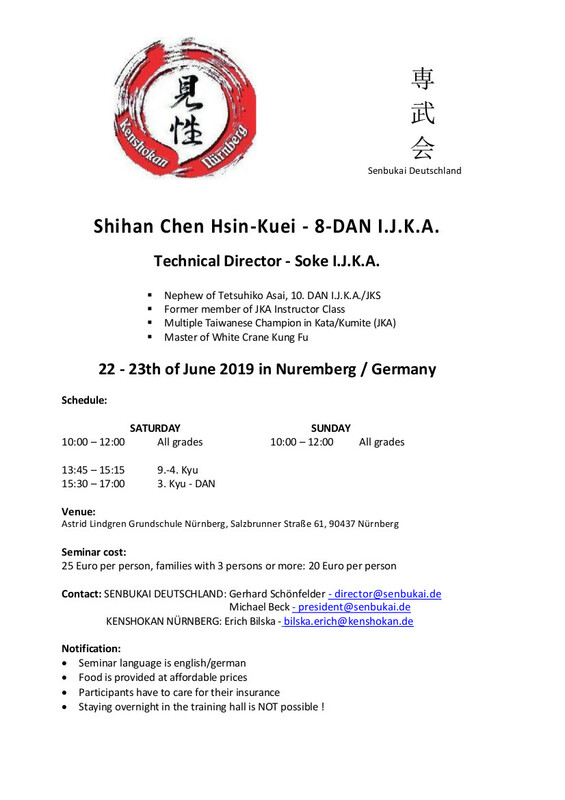 Aside from the annual tournament and the dan promotion exam, you are also able to host an IJKA seminar or a dan promotion test with nearby dojos by applying to the IJKA Technical Office to have an IJKA instructor come to your country. The hosting dojos will bare the cost of the event. For more details including costs, please email IJKA Secretariat. We do not transfer Dan certificates from other organizations or federations. 1. The switch over would take away from the initial dan issuer, and it would be disrespectful. 2. There is no appropriate methodology for transferring certificates from both the issuer and the dan holder that IJKA has no previous association with. Please store with care the dan you were given. 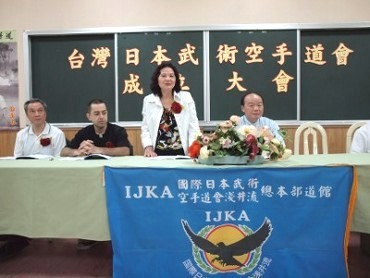 If you are interested in receiving IJKA certificates please try out at the dan promotion test scheduled to be held in Taiwan in August 2011. Details on dan evaluation can be found on our website. There is still almost one year left until the test, so practice hard, and we look forward to seeing you there next year. 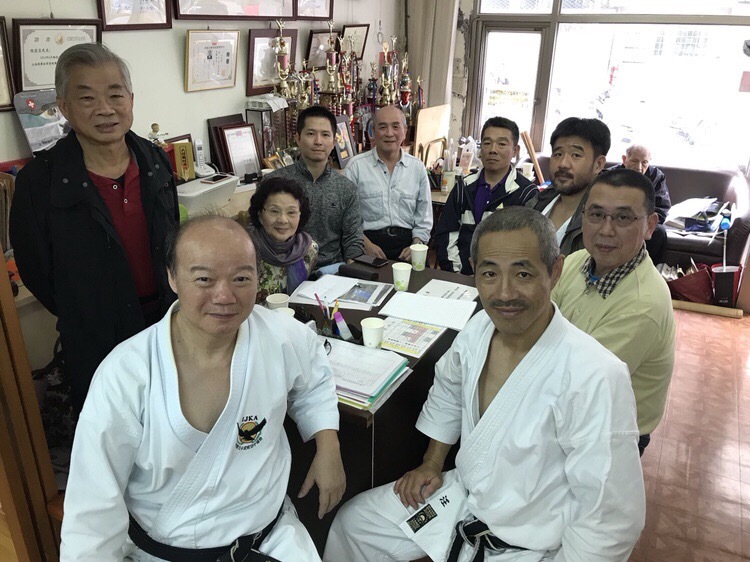 The Family of Mr. 雉ｴ蝠捺擲 Chosen as the Image for the Karate Song "Karate Family"
At the IJKA main dojo Tetsuhiko Kan, there were a number of families that were the perfect example of the karate song "Karate Family." This is something that has been nurtured over 23 years through Asai karate. 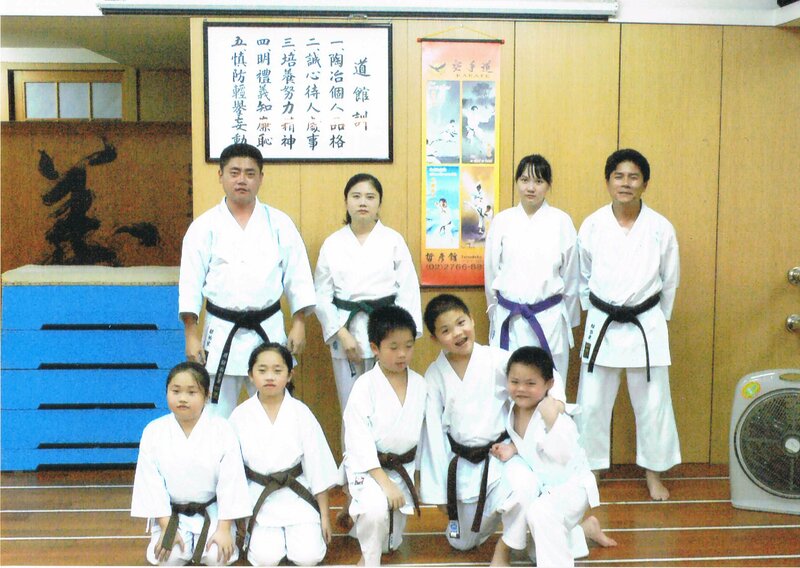 Mr. 雉ｴ蝠捺擲 joined the karate club at school when he was 16, in 1987, and started training under Mr. Chen Hsin-koei. In 1990, after acquiring Shodan, he took a break from karate. 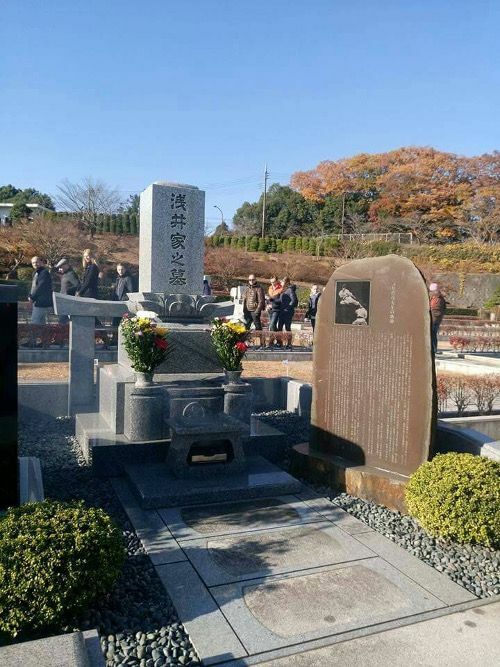 Then again in 2008, at the age of 37 and for the first time in 18 years, he re-joined Tetsuhiko Kan with his eldest son 雉ｴ螽∵�� (9 years old), his younger brother 雉ｴ諤｡螳� and his daughter 雉ｴ莠ｭ隲ｭ (8 years old), and his younger sister's twins 讌雁｣ｫ邱ｯ and 讌贋ｺ主ｫｻ (7 years old), 6 people all together. In 2010, his wife 譖ｹ閧ｲ闖ｯ (36 years old), his second son 雉ｴ螽∝ｻｷ (5 years old), and his sister 雉ｴ逋ｸ螯ｬ (37 years old) also joined, bringing the total number of Mr. 雉ｴ's family practicing hard at Tetsuhiko Kan to 9. Following the event, the international instructor committee meeting was held. Mr. Toshiyuki Kidokoro, who has just obtained his 6-Dan, was certified to be the instructor of the Technical Office of IJKA. Upon graduating from the university, he studied karate under Master Asai for 22 years. The Russian member Mr. G has been practicing Master Asai窶冱 karate for a long time, and has a career of almost 30 years in karate. He will be meeting with the members of the instructor committee for his instructor certification next year or possibly earlier. Members are looking forward to the occasion. IJKA runs like a family. Because of this principle, even from when Master Asai was alive we cared about the administration of each dojo and sought ways to minimize burdens on them. 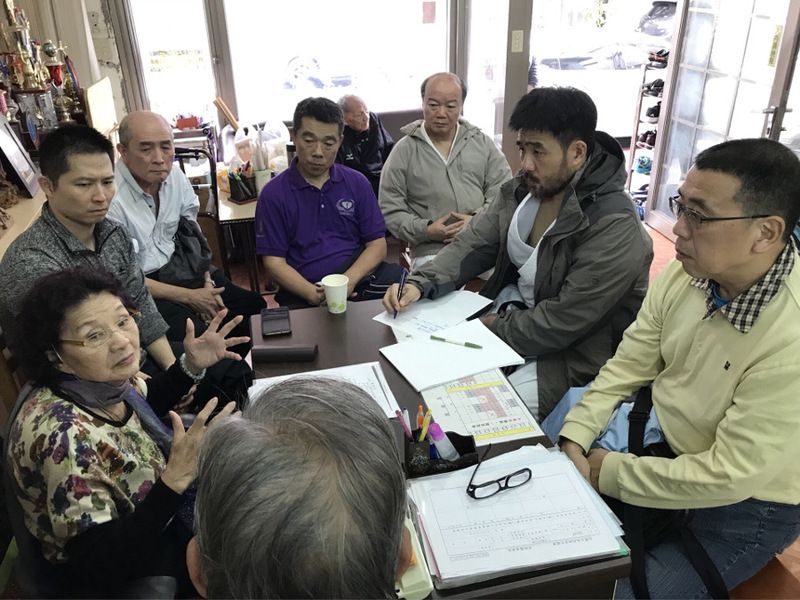 The director of IJKA, Mrs. Keiko Asai reiterated at the meeting that the organization would always consider ways that would benefit them all. In the spirit of the family organization, we must also care for the administration and the management expense of the general headquarters. Hence, from 2011 the fees of annual membership and such will be set in the currency of Japanese yen. The host region for the 2011 International Competition was decided. It will be announced with further details. 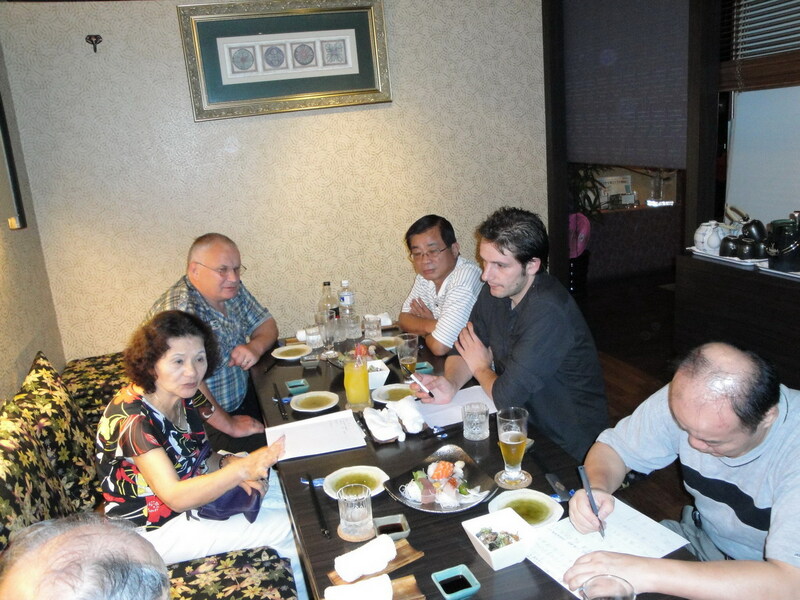 It was decided to establish a preparatory committee for the 2011 International Competition. 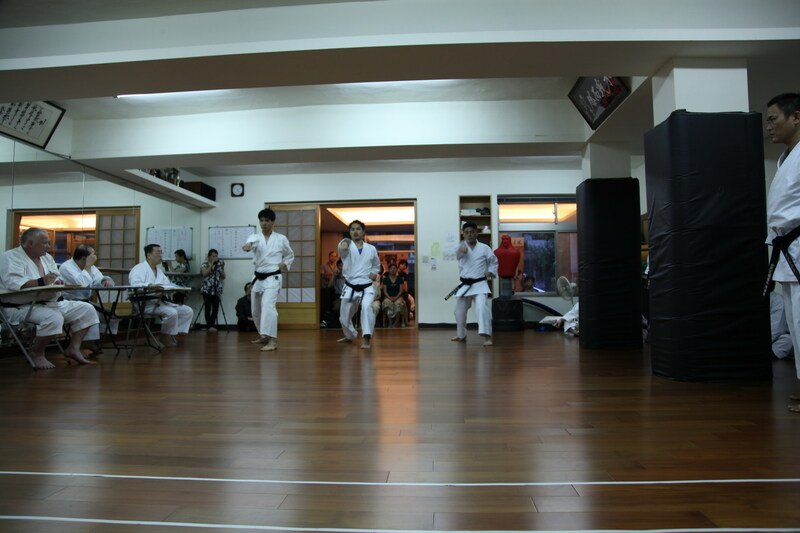 At the joint event, the students of the IJKA Taipei Main Dojo Tetsuhiko Kan showed enthusiastic demonstrations and this was followed by the Assistant Chief Instructor Mr. Chen Hsin-koei and the Chief Instructor Mr. Chen Hung-tsung窶冱 demonstration on the Asai Karate techniques, which filled the hall with excited applauses. 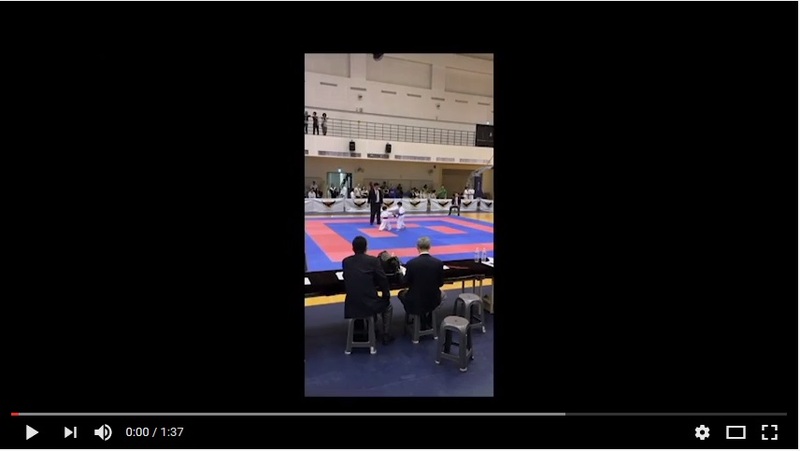 In order to showcase Asai Karate, the students窶� demonstrations included the Junro Shodan up to the 5-dan, to Joko Issei to Joko Sansei, the world窶冱 newest form of karate, captivating the karate practitioners. 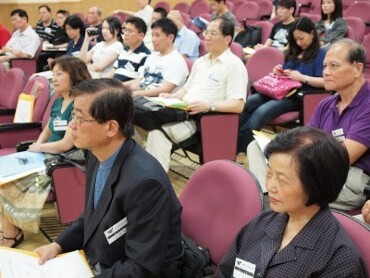 The disciples of Master Asai and their disciples came from all over Taiwan to participate in the event. Some saw old training mates for the first time in 30 years, others a little less; nonetheless a friendly atmosphere dominated the event. IJKA had the honor of having Mr. Rong Yee-jung as a guest from the Presidential Office, who gave a speech and celebrated the achievement of Master Asai. Mr. Fang Rui wen of the Sports Affairs Council under Executive Yuan, who by the order of the Minister Lee Chia-chin of the Presidential Office, presented a letter of appreciation for Master Asai. The event attracted much media attention and many interviews from local newspapers and TV stations were given. 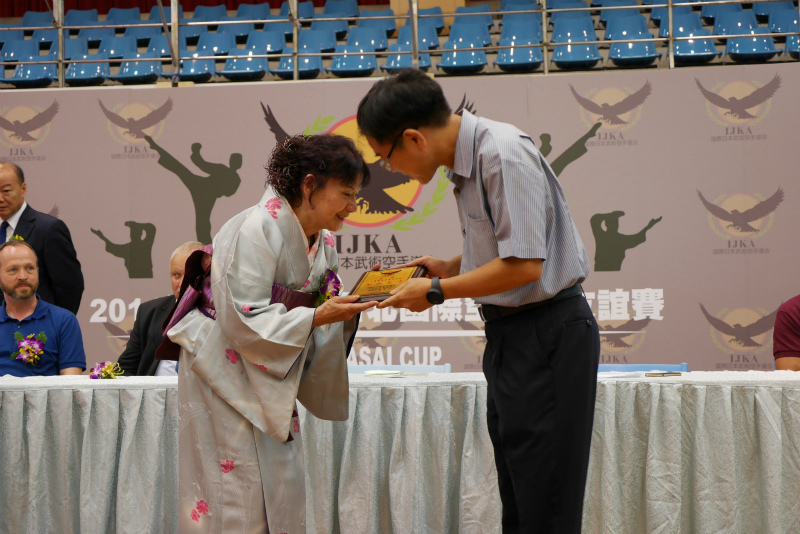 Moved by the reunion with Master Asai窶冱 desciples, Keiko Asai, on behalf of IJKA, gave the opening speech. After the event, a Dan promotion test was held, starting in the late afternoon until late that day. 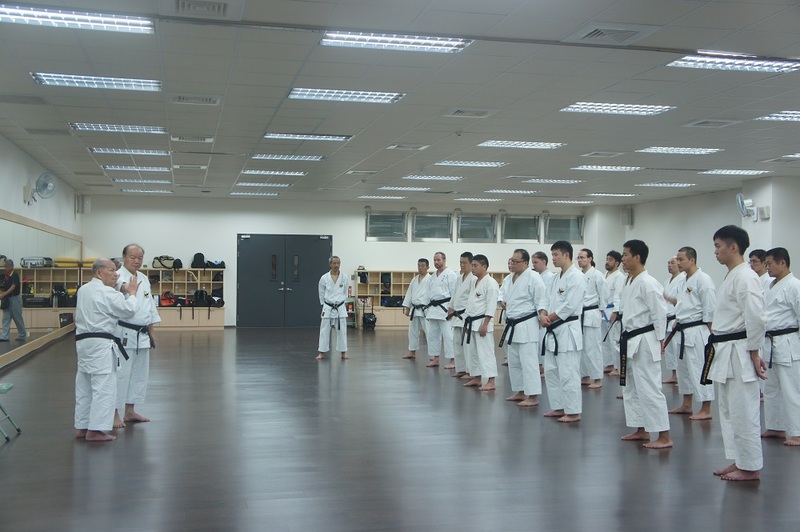 Abiding by the evaluation rules of Master Asai, Assistant Chief Instructor Mr. Chen Hsin-koei (7 dan) and Instructor Toshiyuki Kidokoro (5 dan) together evaluated 13 applicants for the Shodan and 3 applicants for the 2 dan. The evaluation for the next test was joined by Bruno Koller, 7 dan, (who came all the way from Switzerland) to evaluate 3 applicants for the 3 dan and 4 applicants for 4 dan. 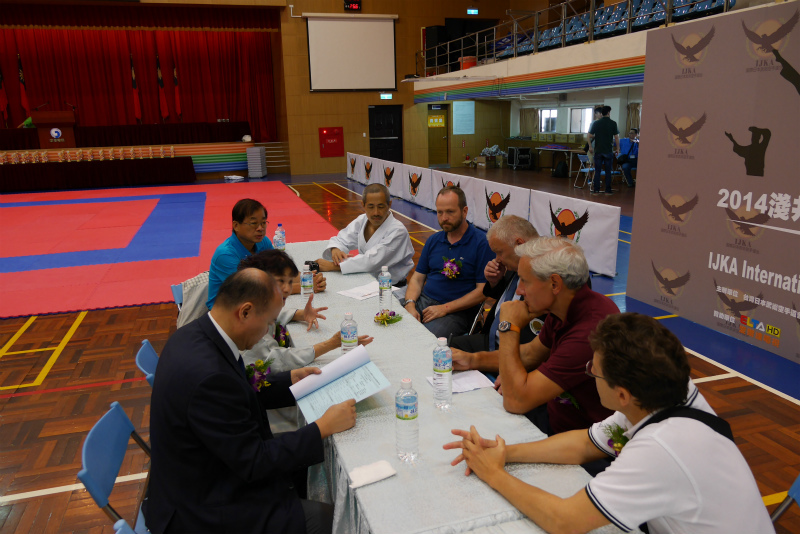 For the 5 dan evaluation, the Chief Instructor Mr. Chen Hung-tsung joined the other three judges. 2 applicants for the 5 dan, Wang Xu yu and Zhou Zhi wen, were thrilled to have passed the test, as they had been waiting for this for 7 years since the last test when Master Asai was still alive. The climax was the evaluation of the 6 dan for Mr. Kidokoro, who was well prepared for this test mastering all new techniques of Master Asai. Mr. Kidokoro trained hard under Master Asai techniques such as Tenshin (Body transfer), even with bleeding feet. The result of the test was a well-deserved pass. 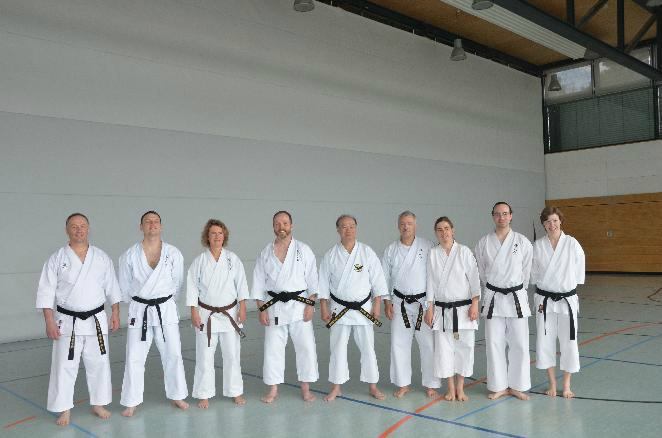 In total 26 applicants were evaluated for the dan promotion at the test. The dan promotion test ended after six long hours. 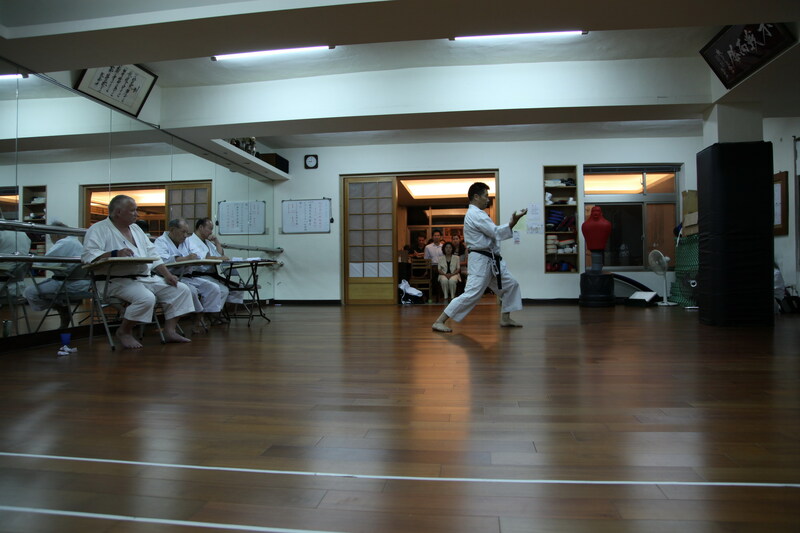 Tests were at the IJKA main dojo, Tetsuhiko Kan.
Late Master Asai had a strong intuition. As if he knew when his life was going to end, he had prepared many Dan certificates signing his name and sealing it with his hanko. He signed his name under Shuseki Shihan and left the official examiner blank. He told me: "When I'm gone, please look after IJKA for 3 years and if my karate is disappearing it is up to you." Since I accompanied him for close to 50 years, I understand very well the meaning of "it is up to you." It does not mean, "I entrust you the organization called IJKA," but "it depends on you to decide whether it is ok to let IJKA dissolve and Asai karate finish, or to inherit IJKA and do your best for the organization." It has now become his will. He said this not because of a legacy but rather it was his sincere wish to pass on his martial art - the karate that is not hurtful to body and can be practiced lifelong - to those karate-ka whom he loved: His disciples. We are restarting IJKA and issuing certificates with Master Asai's signature for Master Asai, those karate-ka who still did not join any other groups out of respect to Master Asai, and those who joined organizations but are keeping Asai Sensei in their heart. 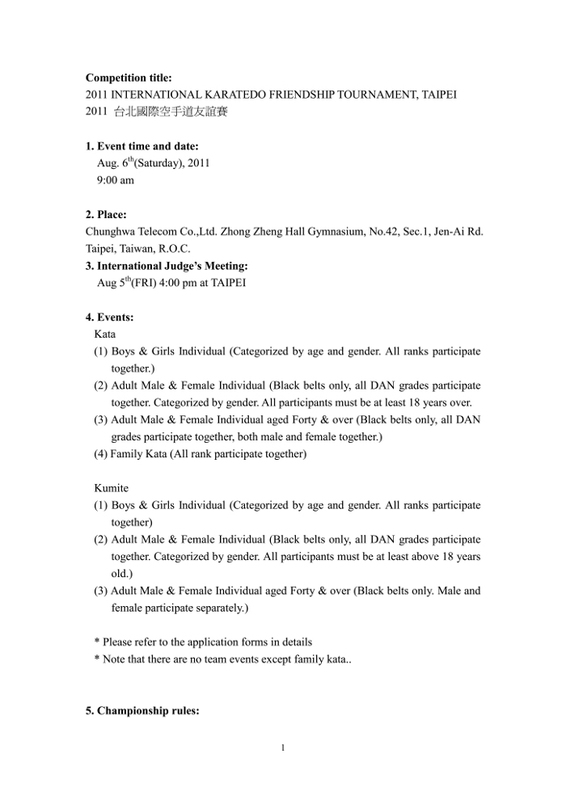 The instructors who judge the dan test will sign the blank space under official examiner. Master Asai kept a diary for close to 40 years, taking up dozenss of notebooks. What a surprise it was for me when I found them after he passed away. He kept a meticulous record of which country he had visited (and who came to pick him up), what he taught there and which Dan he certified to whom. 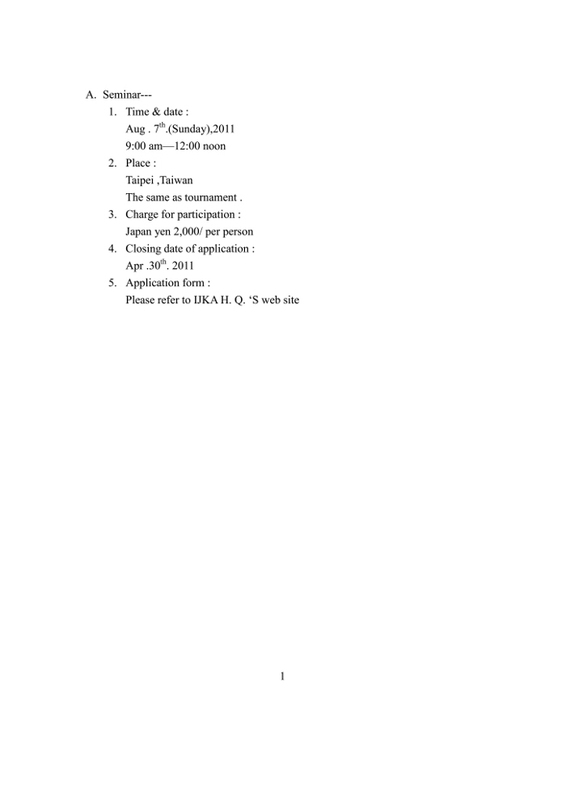 This will be the supporting document for anyone who needs to prove his/her IJKA high ranked Dan. 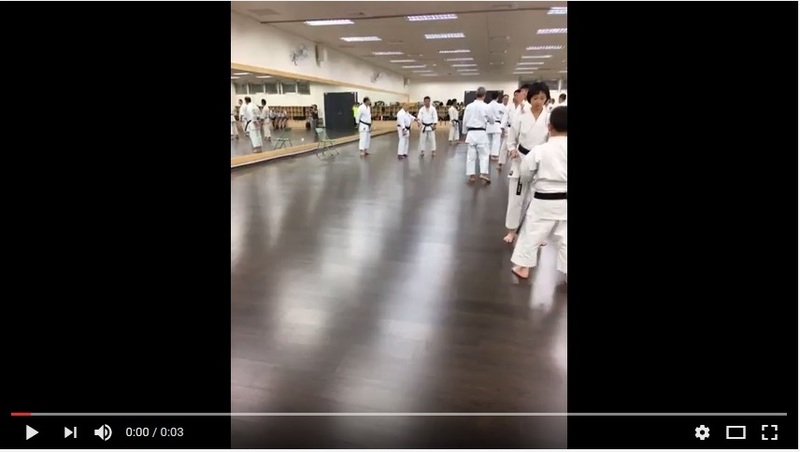 When I asked a person from another country what Dan he had, he replied 窶�6-Dan at my dojo, 5-Dan in the national rank, and 3-Dan in IJKA.窶� I think his explanation makes a lot sense. It would be incorrect to assume that 6-Dan at the dojo translates to 6-Dan in IJKA. Keep your Dan a Secret? 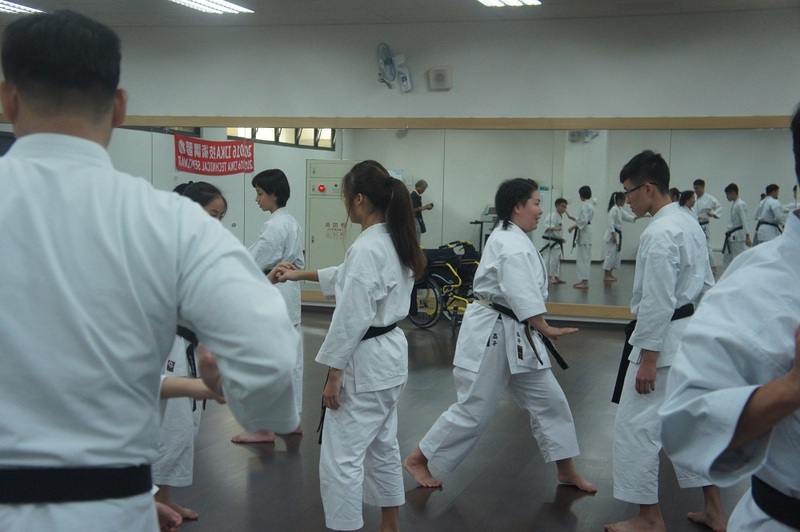 Another person with a high ranked Dan told me 窶廬 don窶冲 tell others my Dan.窶� This was because the Dan he had is only achieved when you have mastered almost all of the Waza on the Dan evaluation table. 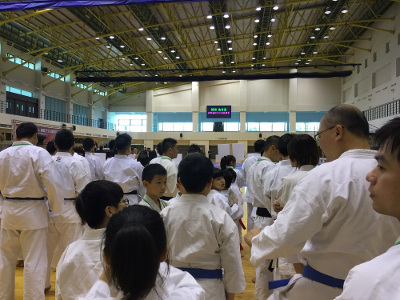 He explained that it would be embarrassing if he couldn窶冲 demonstrate the Kata requested by his juniors or pupils, or when he losses the Jiyu-Kumite because he had to go easy on a lower-ranked opponent. Also he mentioned that there were mean-spirited people who would come and compete just to test whether he actually qualified for his Dan. I remember how Master Asai used to answer any questions, anytime, from whomever, without hesitation. It was because of his hard training. "Tetsuhiko KAN" was established in Taipei,Taiwan. 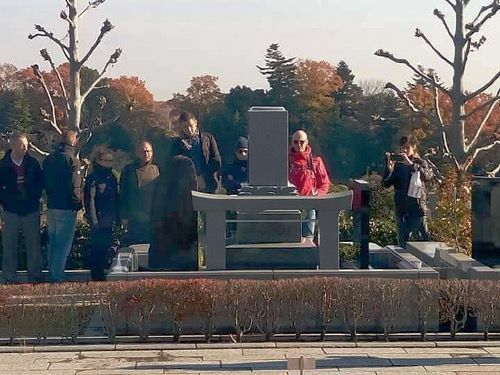 IJKA Main Dojo has been named "Tetsuhiko KAN" after late Master Asai. The planned Master Asai tribute event on August 15th has been postponed due to insufficient time for planning. 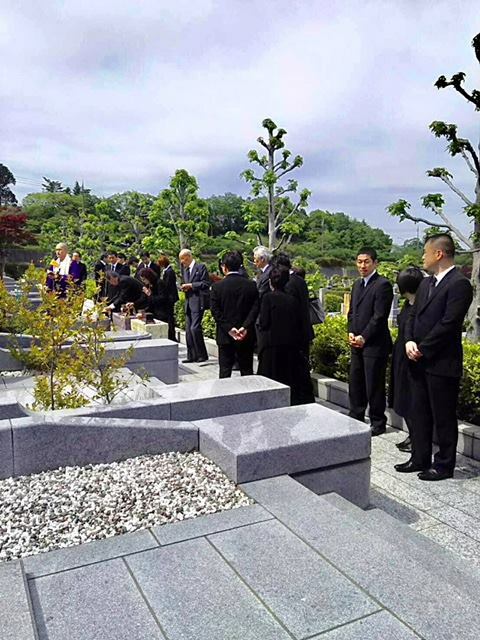 It was decided at the Instructor Meeting held in Switzerland on May 13th, on the same day of August 15th, IJKA Main Dojo will host a Master Asai's memorial event in Taipei, Taiwan instead. 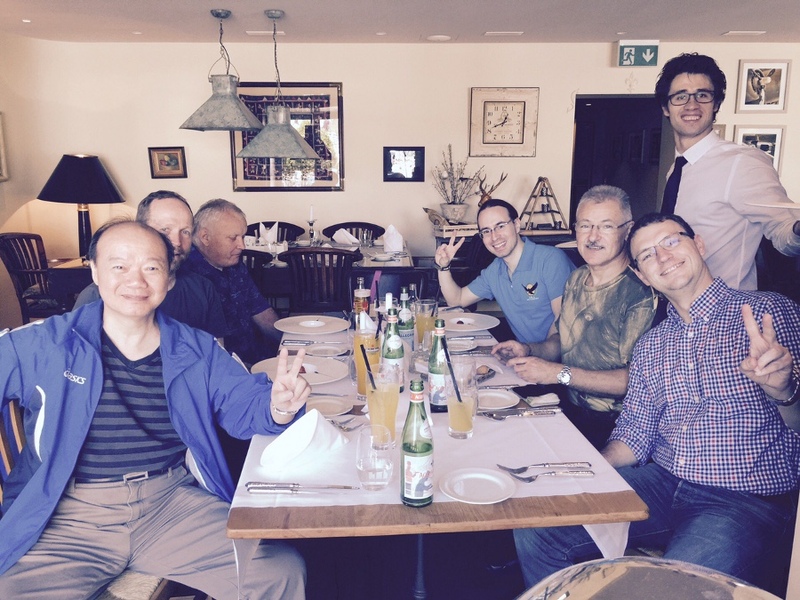 At May 15th, an international meeting was held in Gams, Switzerland. 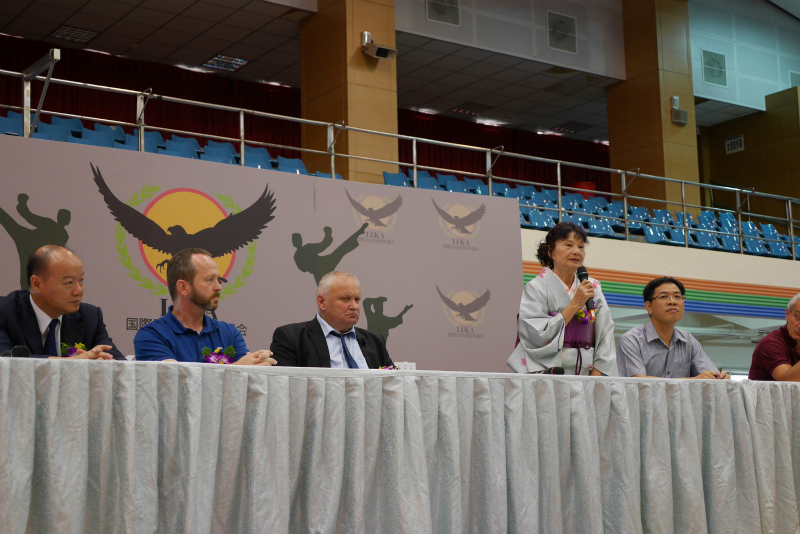 The meeting was led by Mrs. Keiko Asai, wife of the late shuseki shihan Asai Tetsuhiko and president of the International Japan Martial Arts Karatedokai Asai-Ryu. Besides Mrs. Asai. 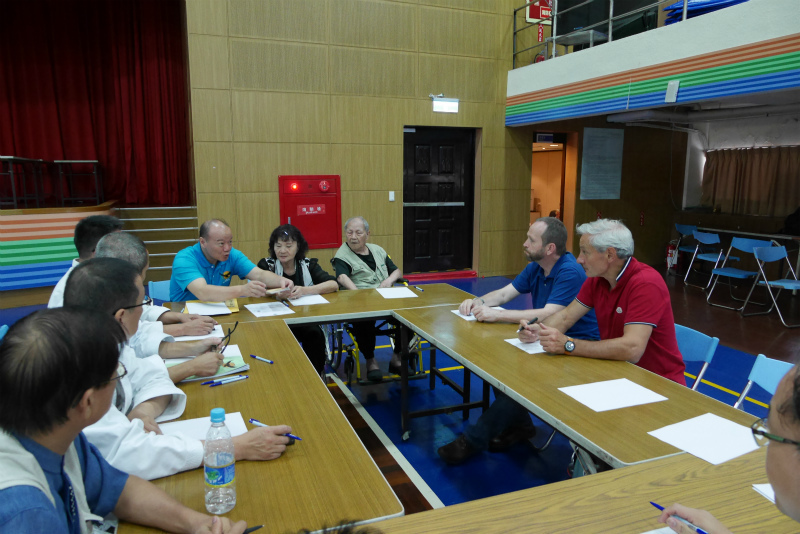 Senseis assistant chief instructor Chen Hsien-Koei (7-DAN, Taiwan), Koller Bruno (7-DAN, Switzerland) and several instructors from switzerland, Riedinger Otto (Germany) and Dormenko Andrey (Rrussia �ｼ餌nd Formenton Giuseppe(Italy)縲�attended the meeting. 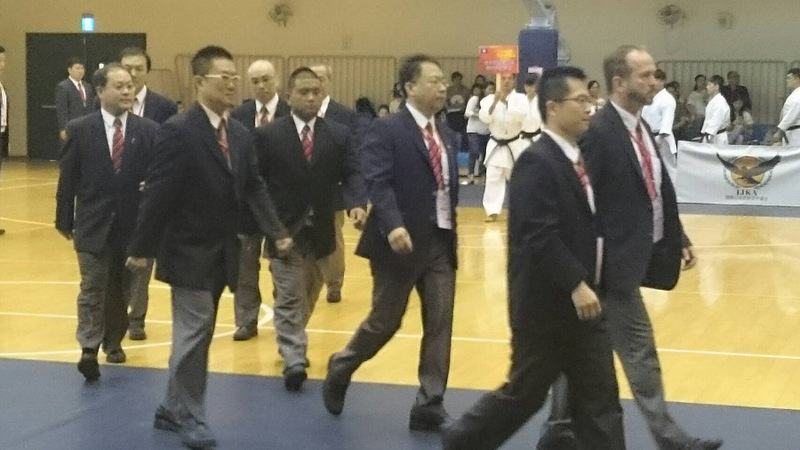 Supreme technical body is IJKA instructors commitee, which consists of Chief Instructor Chen Hongtsung (8-DAN, Taiwan), assistant chief instructor Chen Hsien-Koei (7-DAN, Taiwan), Koller Bruno (7-DAN, Switzerland), Fujiwara Ed (5-DAN, Hawai USA), and Joel Chinen (4-DAN, Hawai USA), who was just appointed. These people are also the members of the Instructor Committee, and we will be selecting more instructors as we go forward. We will gradually select each country head as well as regional heads. The regional head for Europe is Koller Bruno from Switzerland, and Riedinger Otto from Gemany has been appointed as the assistant regional head. 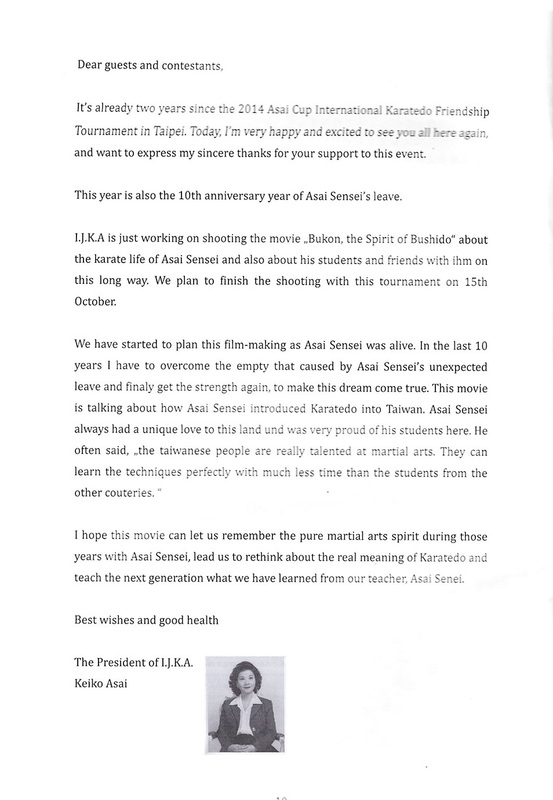 All attending instructors thanked Mrs. Asai for her words and will support her in the endeavor to preserve her husbands organisation and his unique style of karate. Singing Competition Song "My Life Karate Journey"
You sing a song with lyrics by Asai Tetsuhiko Shuseki Shihan, a karaoke contest will be conducted. The winner prizes so spectacular, please join us. The lyrics of the Karate Song represent the feelings and the realizations of Master Asai in his 50 some years of teaching karate. In the lyrics, Master Asai depicts the image of a butoka (martial artist) training hard at karate as: Dateniwa shimenu kuro-obi ni, sessatakuma no ase shimiru (In the black belt tied for a reason, the sweat of long hardship soaks through.)" Here, he admonishes those who merely seeks high karate ranking titles, and tells them to "sunka o oshimi waza o neri (hone skills without wasting any minute.)" To those who are causing discord with other karate-ka despite the common interest, he says to "washite ayuman onaji michi (walk the same road with all of you in Peace) and "onore no kokoro hibi migaku (hone my/your spirit day by day)." In wishing world peace, he also adds the line: "Kono michi kuni no sakai naku (No national borders on this road)." The song was made in hopes that Master Asai's students around the world would hear this and learn the essence of his teachings. About the Song "Karate Family" At the karate seminars Master Asai used to hold, often he saw big families coming in large vans from adjacent countries, travelling over ten hours. In such an era of the nuclear family, Master Asai was always impressed to see such families with brothers and sisters, parents, grandparents, sometimes with aunts and uncles and cousins, get together to work for a common goal. He believed such an environment was the best for children's health and education. That became the basis of this song. Winners will be sent an email of notification. The names will also be posted on the website.